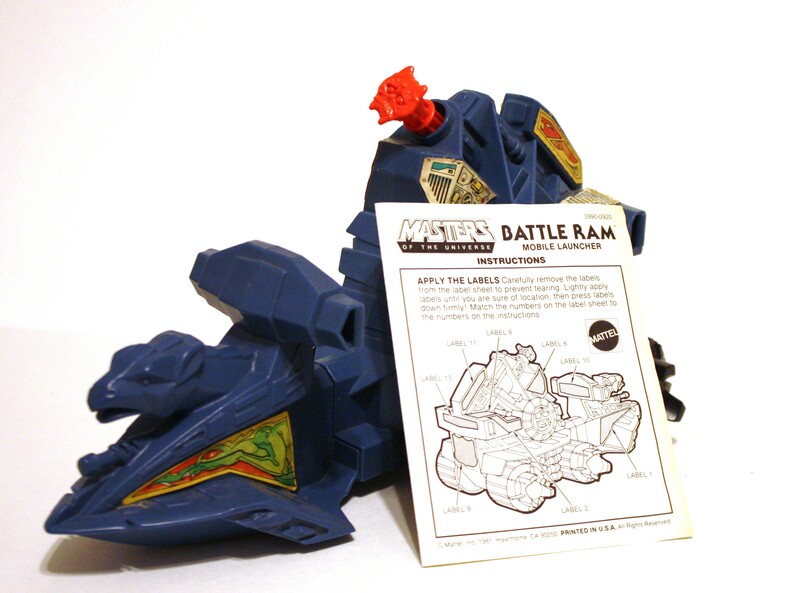 I was obsessed with the Battle Ram the moment I saw it on the shelf as a kid. 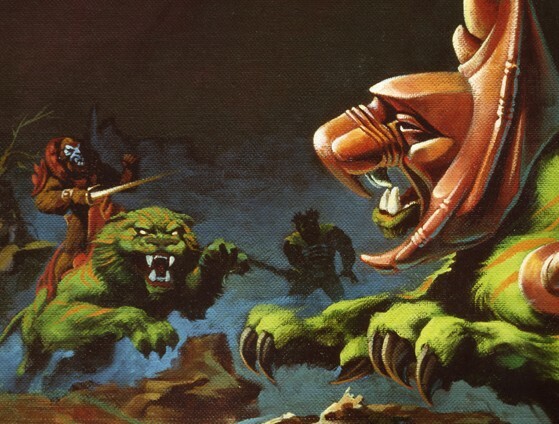 Maybe that’s obvious from the name I chose for this blog. 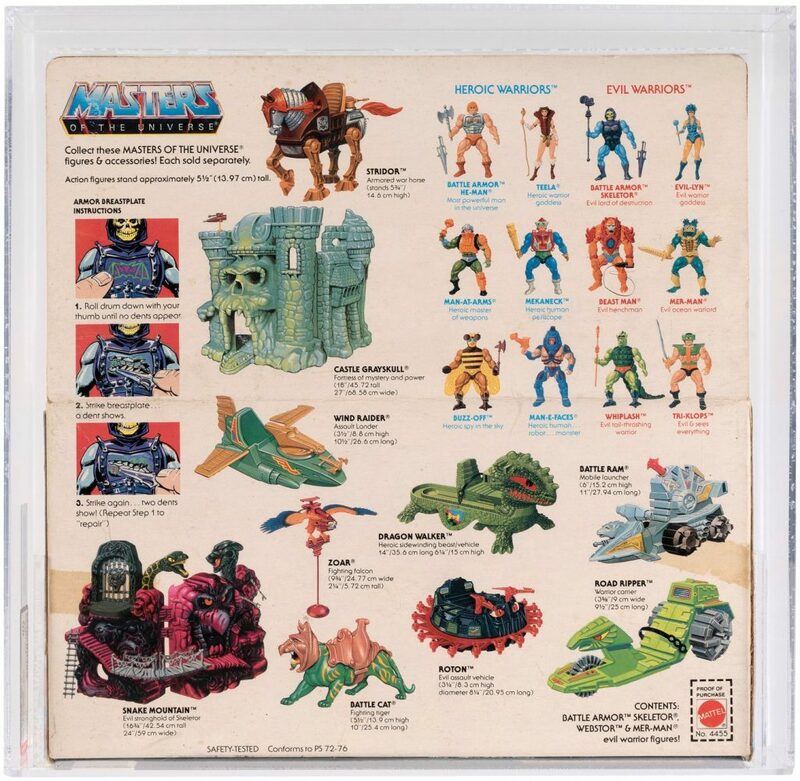 Unlike most of the other MOTU items I got as a kid, there was no window box or bubble in the packaging. 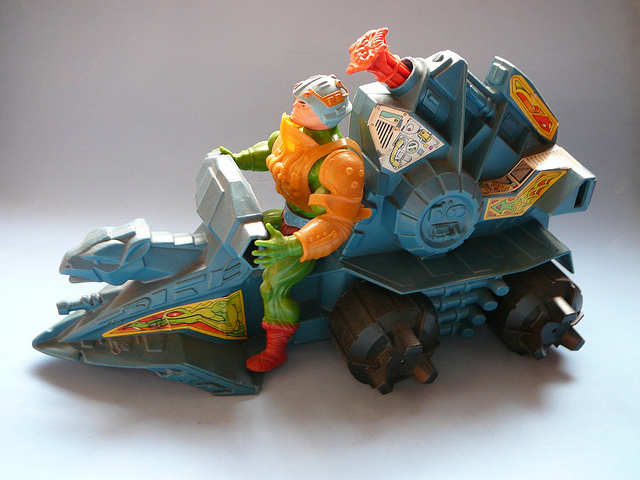 The Rudy Obrero art sold the toy all by itself, and it was more than up to the task. 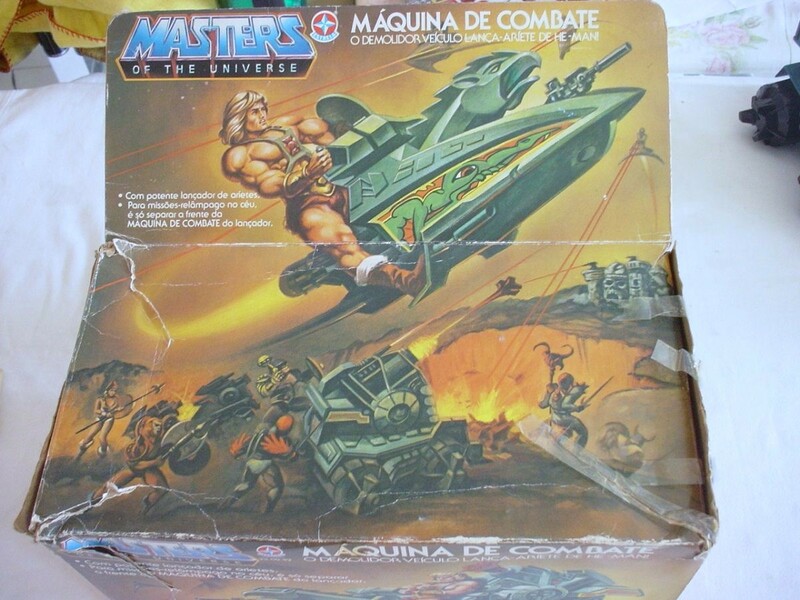 Every piece Rudy Obrero did for Masters of the Universe was moody and full of movement and mystery (with the possible exception of the Attak Trak box art). 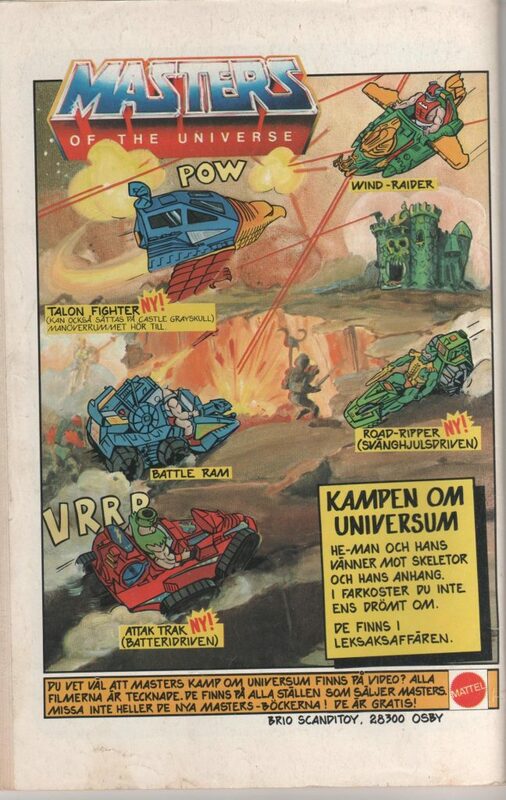 This illustration, like the Wind Raider pieces he did the same year, features two separate action scenes. 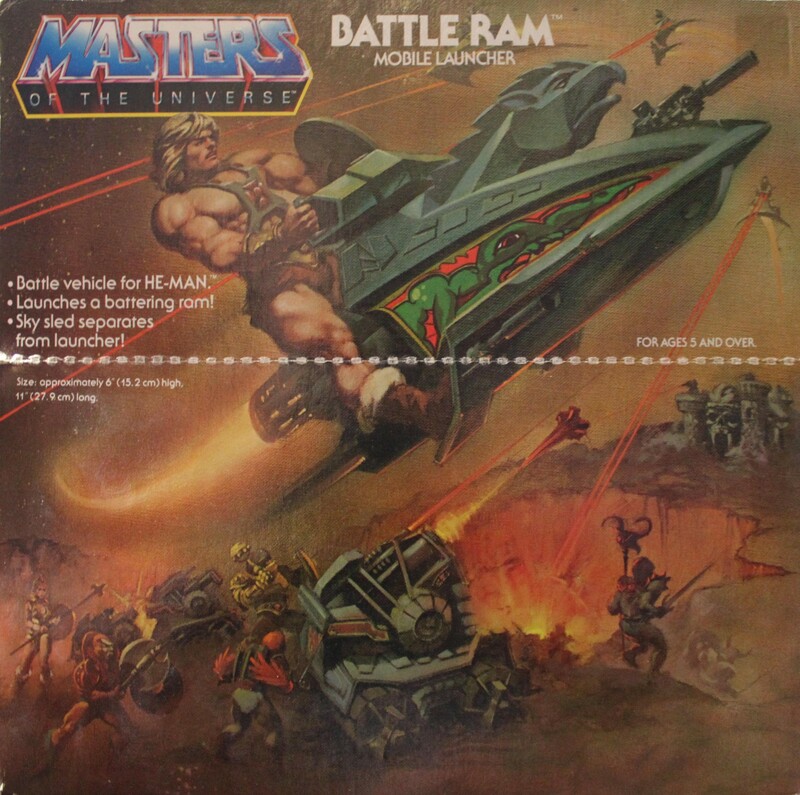 The bottom scene, which would have been facing front at about eye level for kids wandering the toy isles of Toys ‘R’ Us (or in my case, the White Elephant), depicts He-Man guiding the Battle Ram over difficult terrain as evil warriors rain down fire from above. 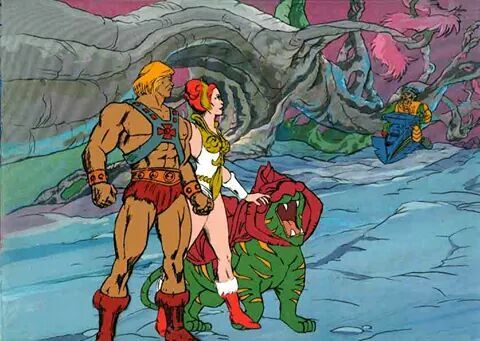 He-Man is shown here with white colored fur at the tops of his boots. 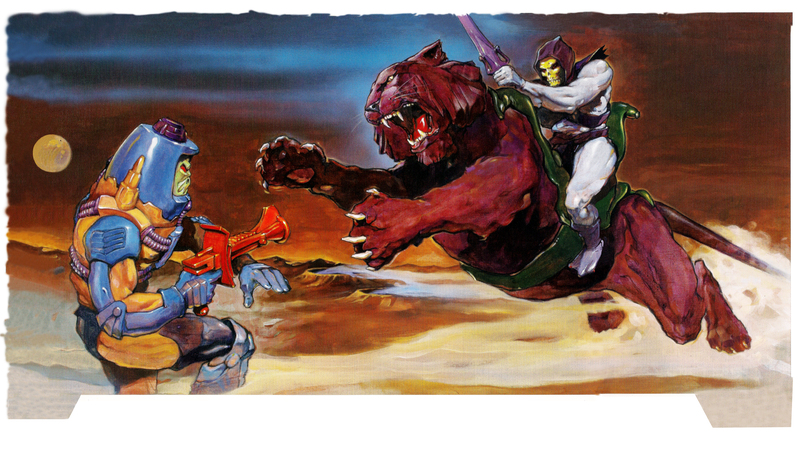 Every time Obrero depicted He-Man, he had these boots (sometimes the fur is white, other times it’s more of an ocher color). 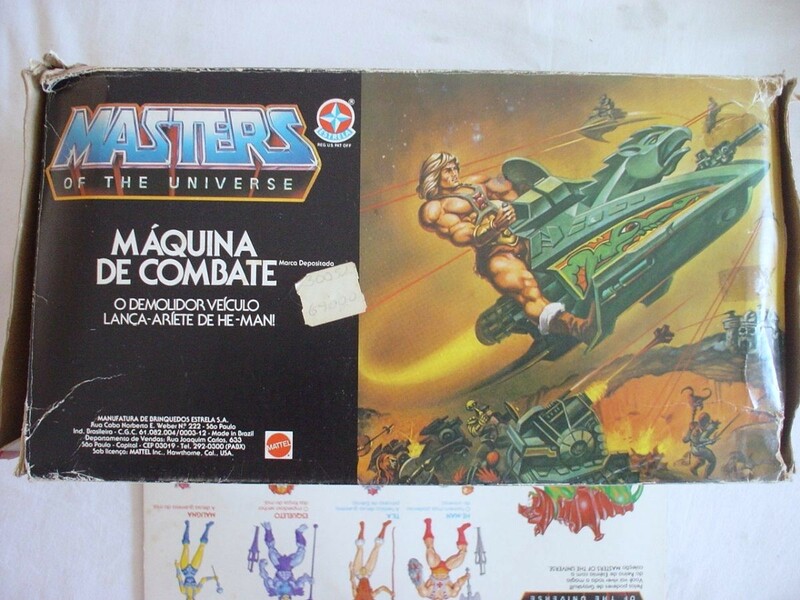 They’re actually based on the prototype version of He-Man that Obrero used as a reference. 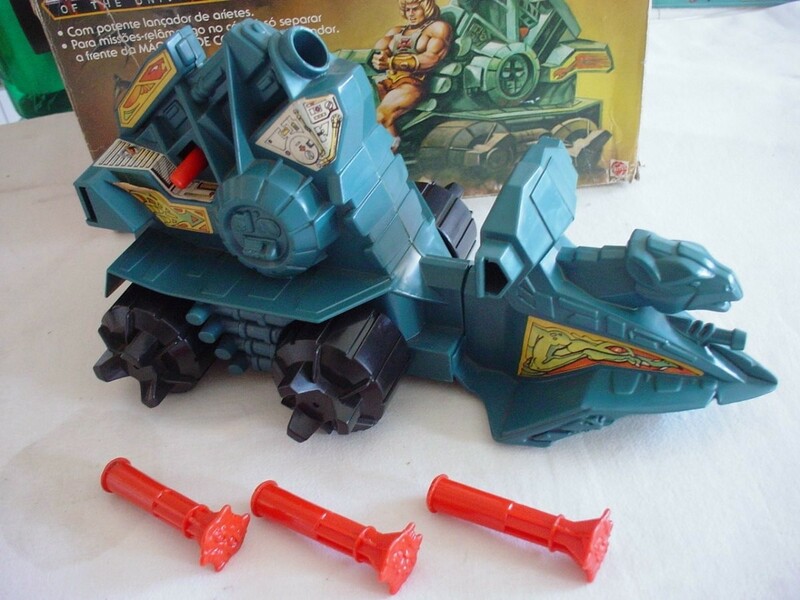 The mass-produced toy had fully red boots. 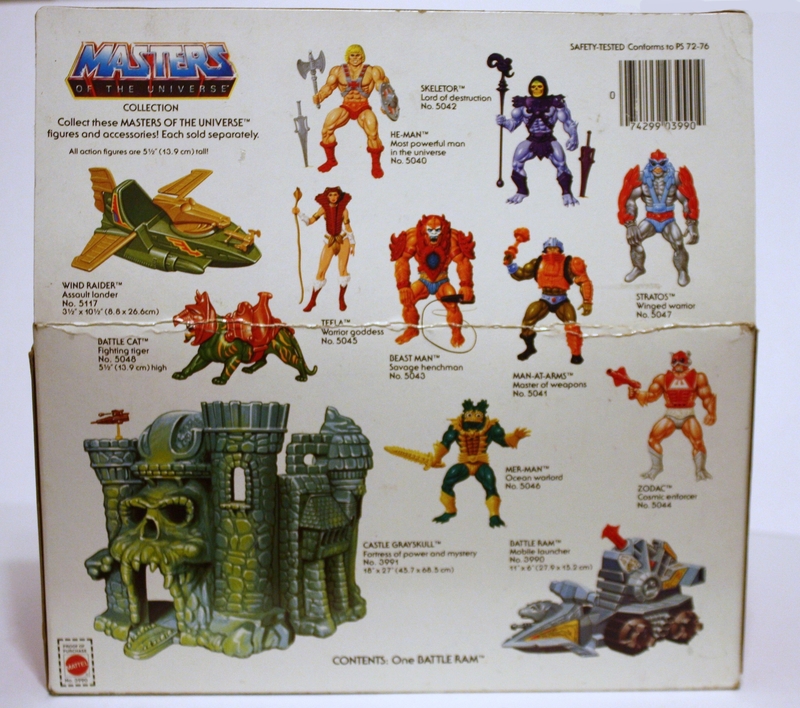 The top portion of the art was subdivided into two sections on the actual box. 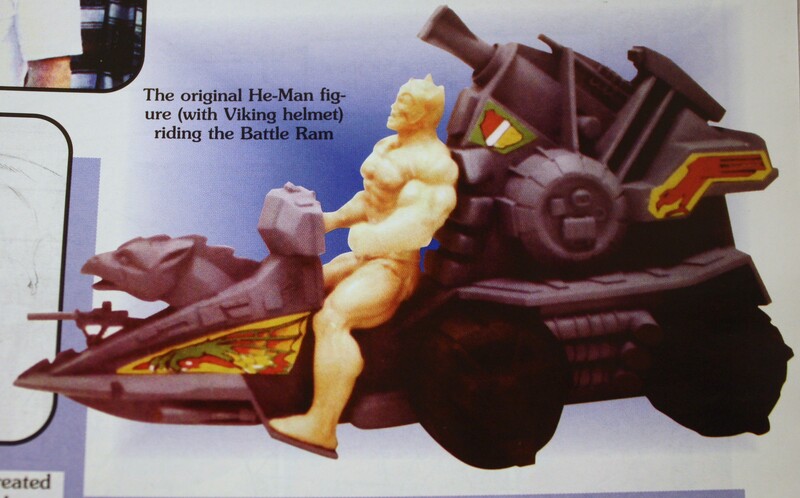 The top-most section was again facing front and featured He-Man shooting through the air on the front portion of the Battle Ram (aka the Sky Sled). 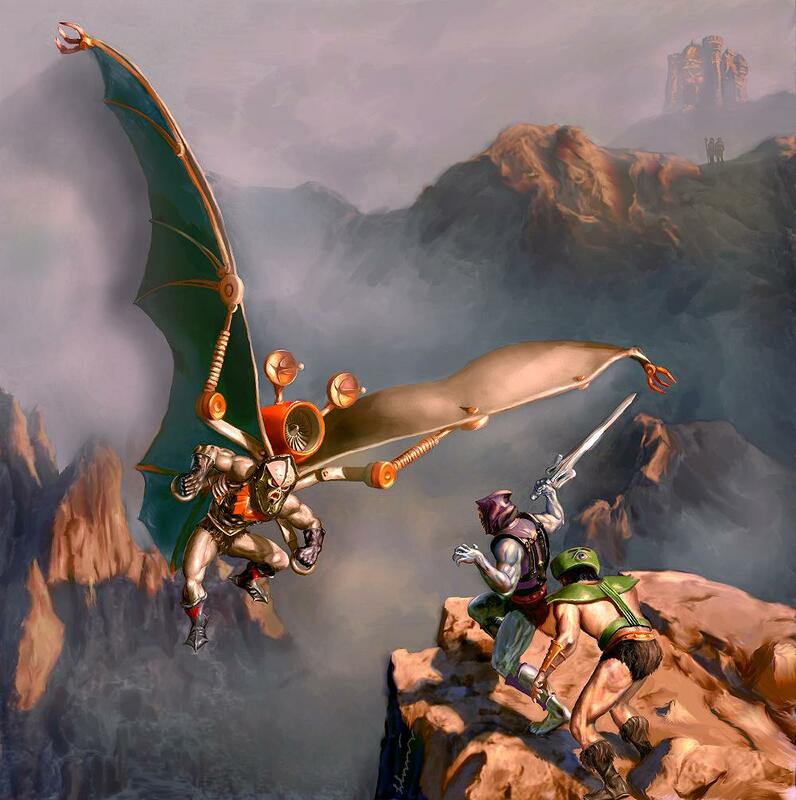 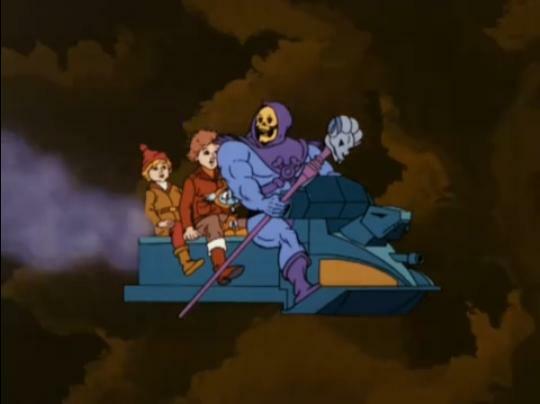 Evil versions of the Sky Sled (which also appear in the Castle Grayskull box art) send out twin laser blasts while a fierce battle rages below. 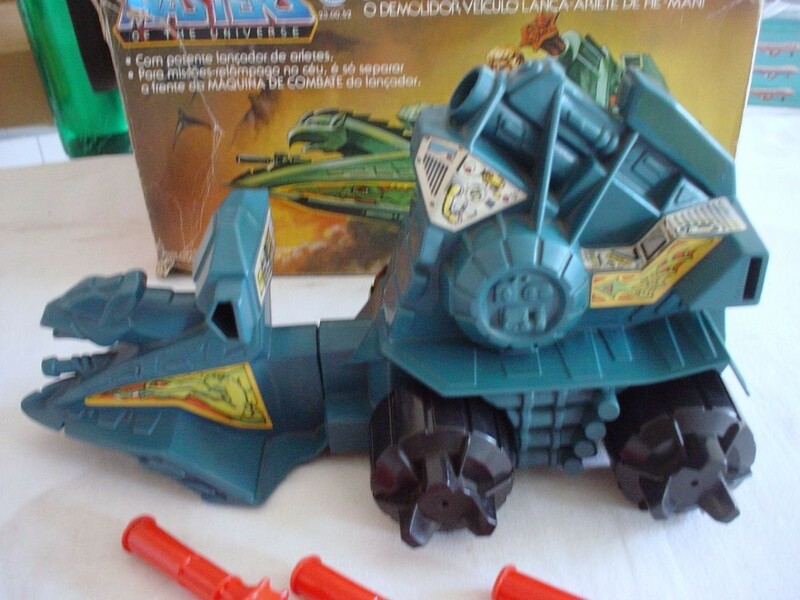 The middle section faces up rather than forward due to the shape of the box. 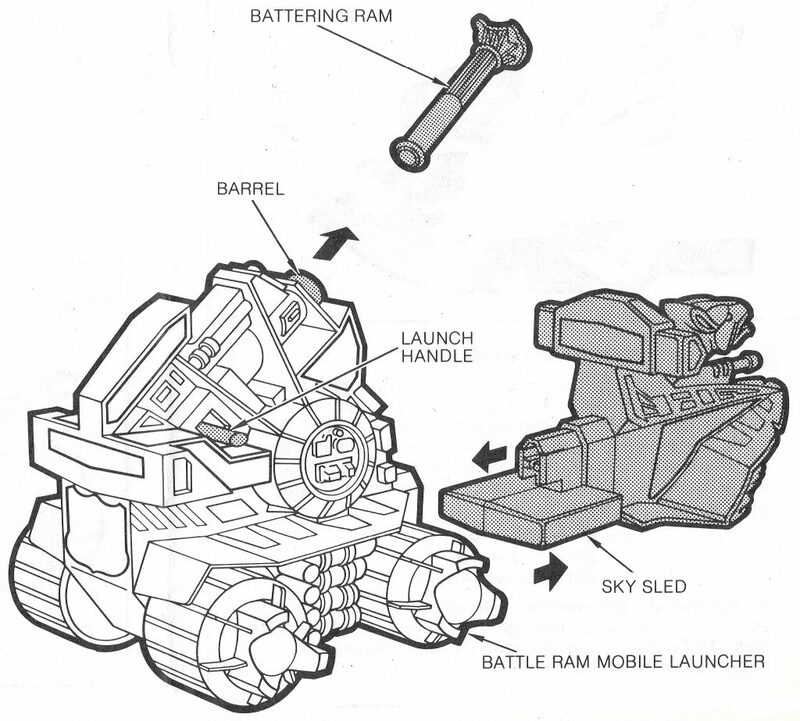 Several back halves of Battle Rams are launching missiles. 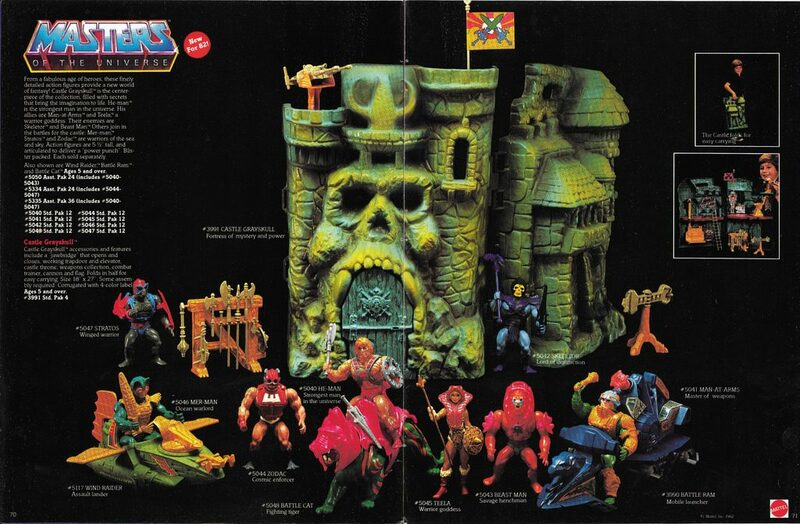 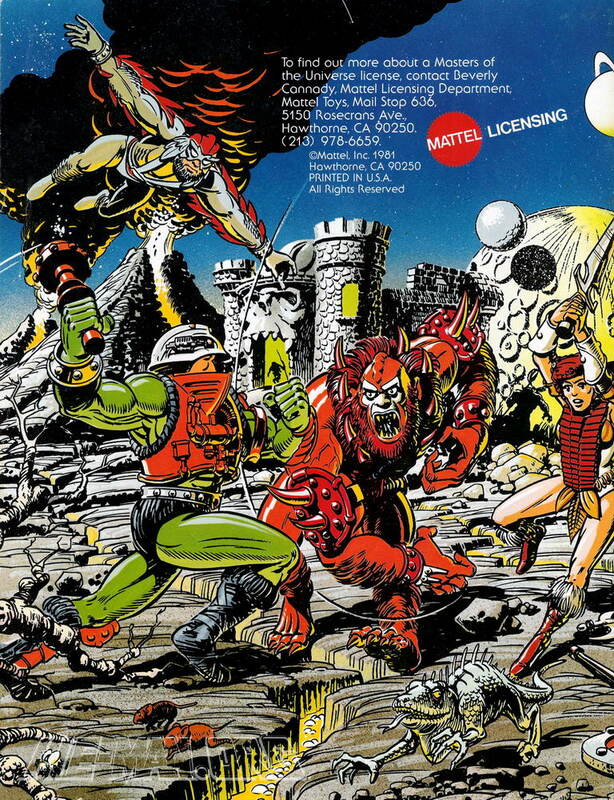 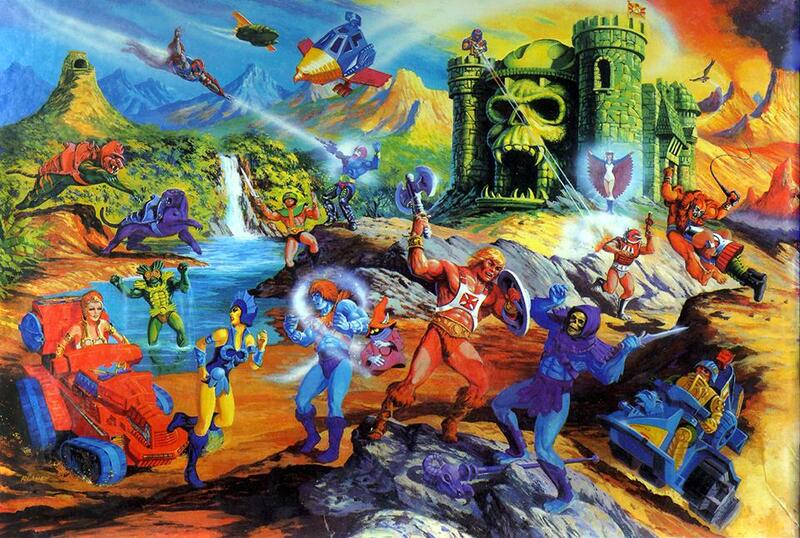 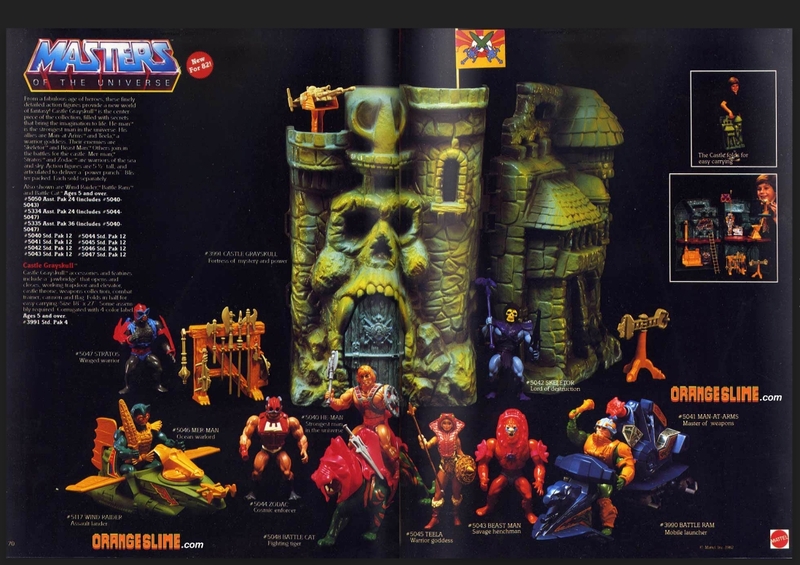 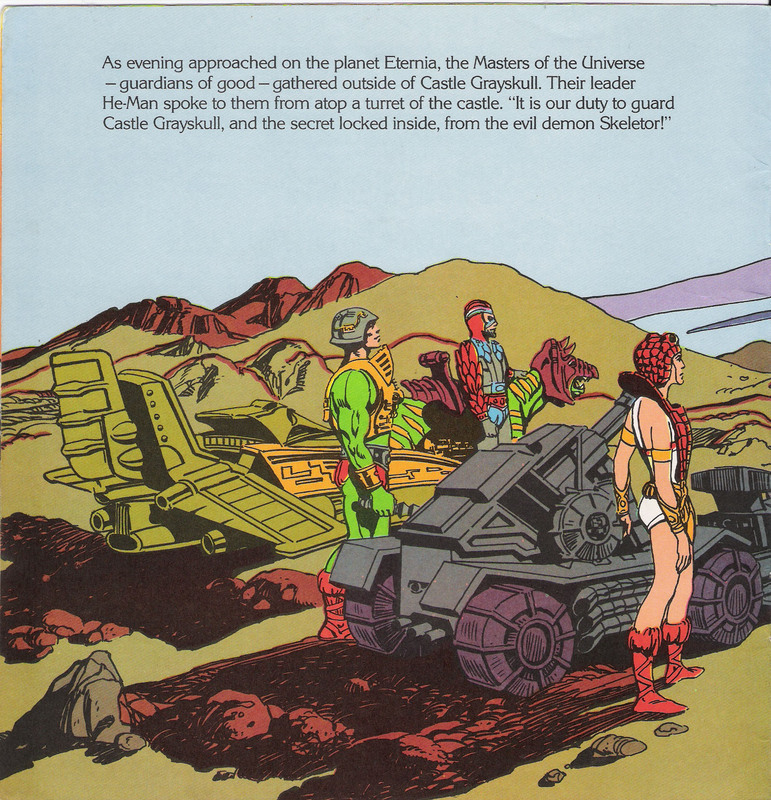 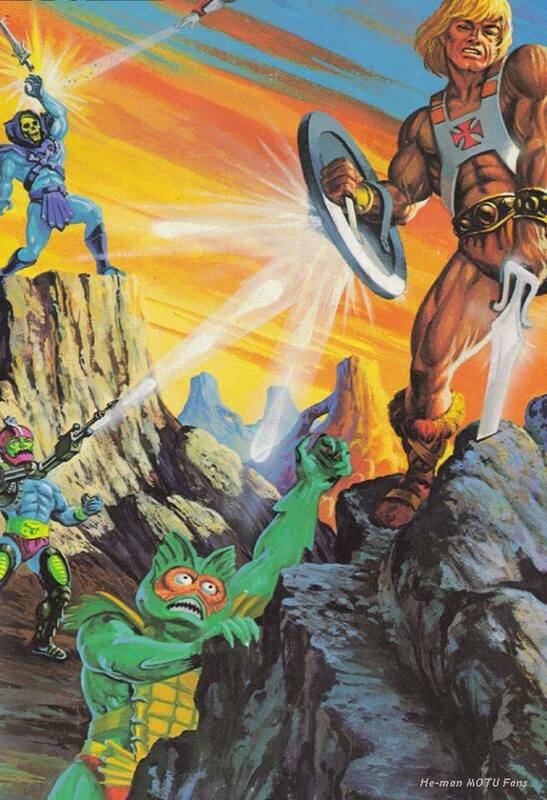 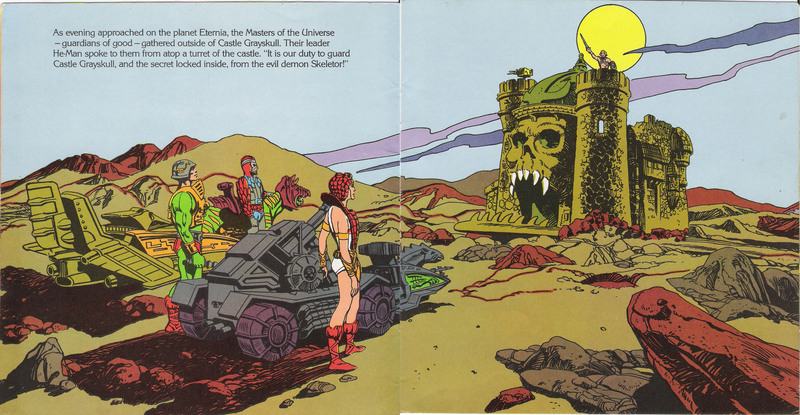 Skeletor, Beast Man, Stratos, Man-at-Arms and Teela (sporting her concept spear that never appeared in the vintage toy line) are seen, along side a warrior with a horned helmet and Castle Grayskull in the background. 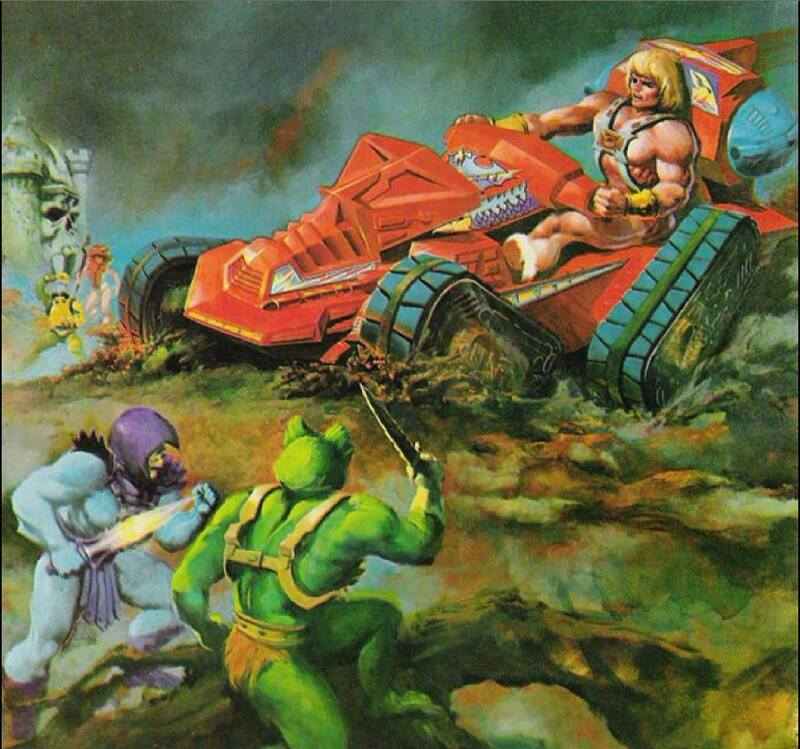 It looks like all-out war. 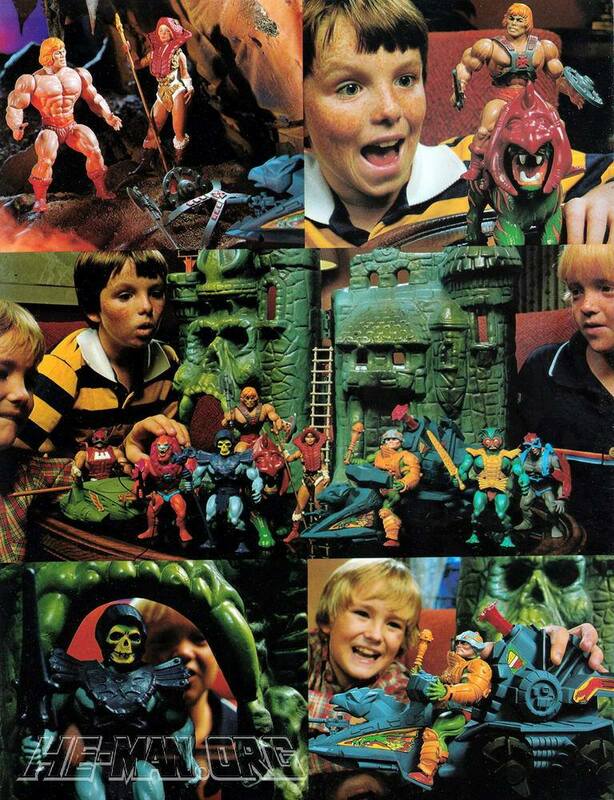 As a kid, I was instantly hooked. 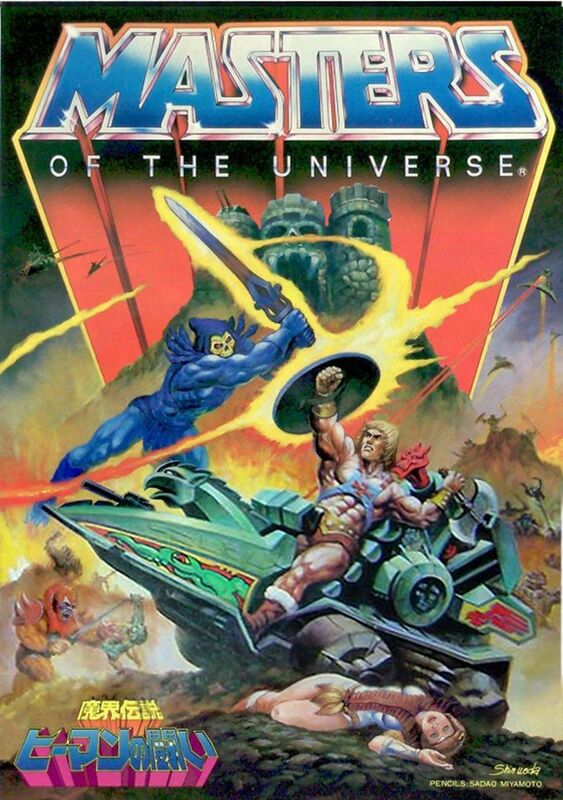 I had never seen anything like it. 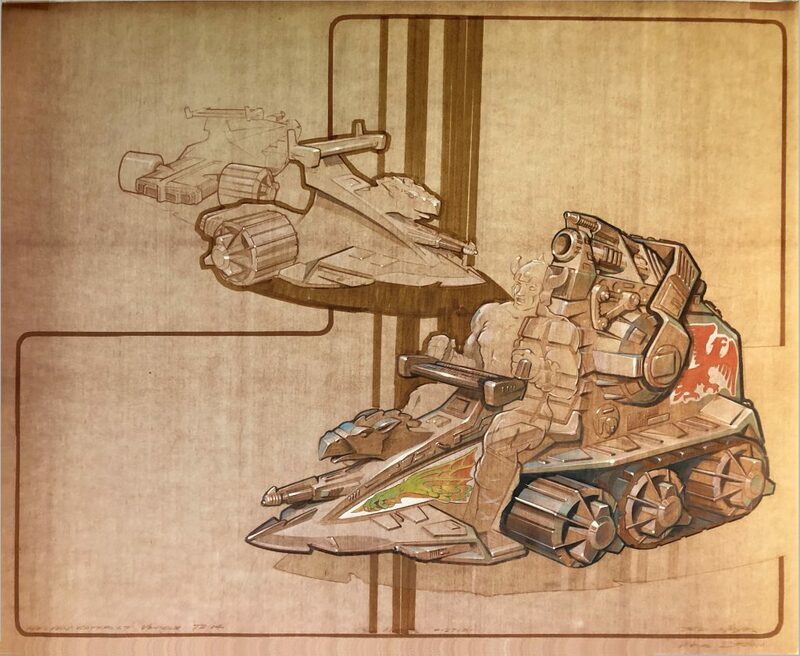 As I said, Obrero’s artwork (done in oil) really sold this vehicle. 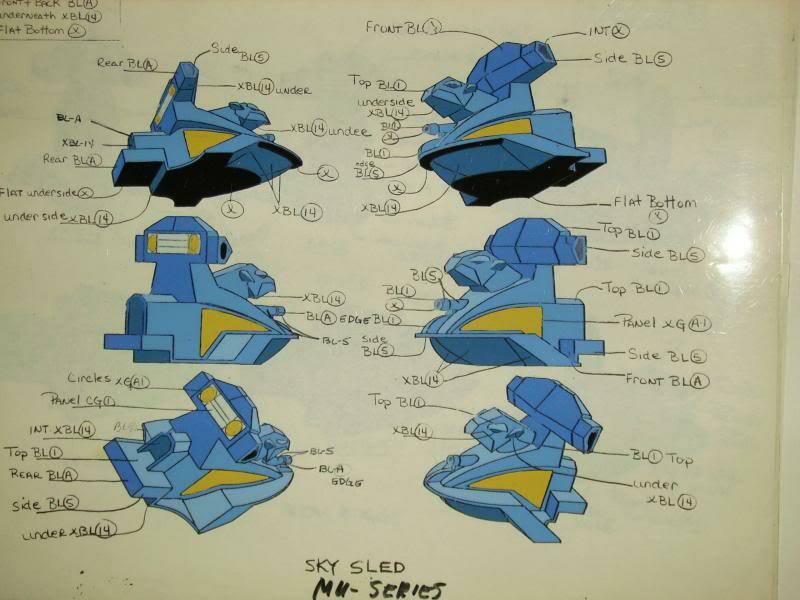 It didn’t hurt that the artist tended to add extra details, like a protruding jet engine on the back of the Sky Sled and under-guns that the actual toy only hinted at (but were actually present in the prototype version). 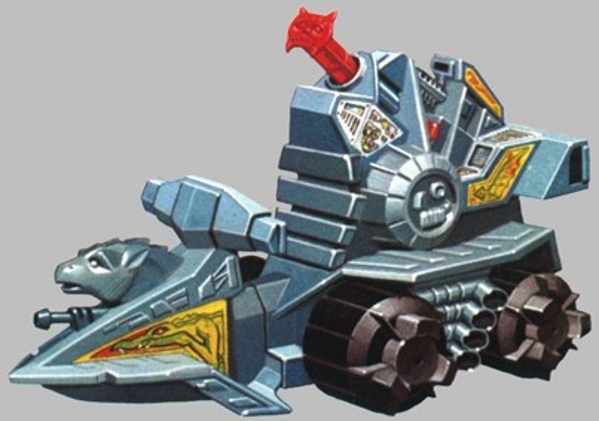 Yet another modification to the artwork was done on the Brazilian Estrela version of the Battle Ram. 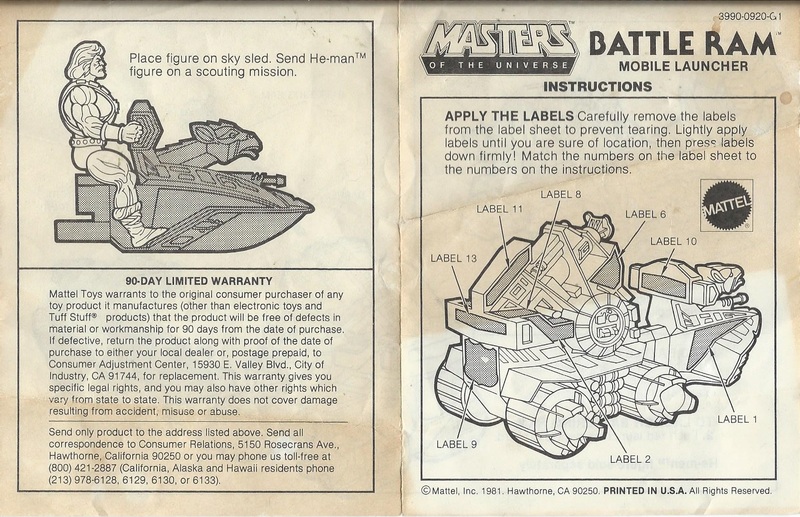 They even modified the cross sell art on the back of the package. 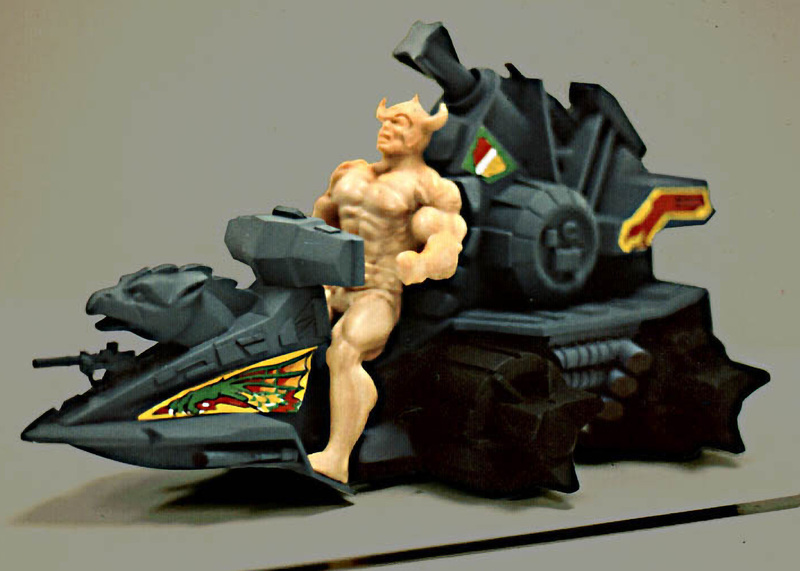 It’s unclear to me why this was done. 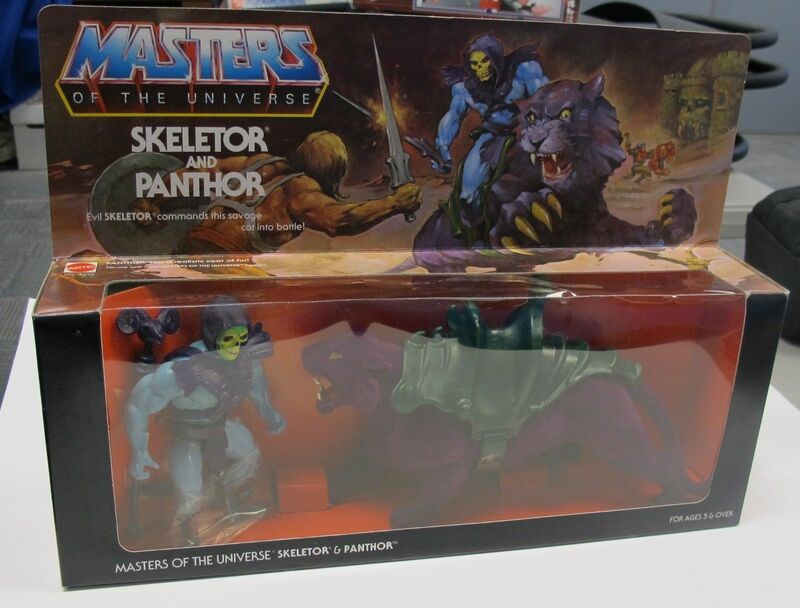 My speculation is that they had the rights to produce and sell the toys, but opted not to purchase rights to the packaging artwork. 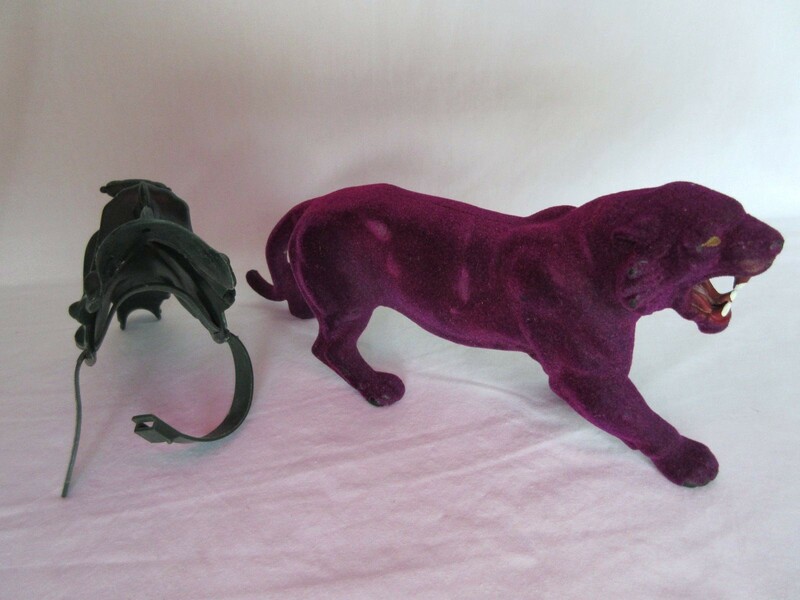 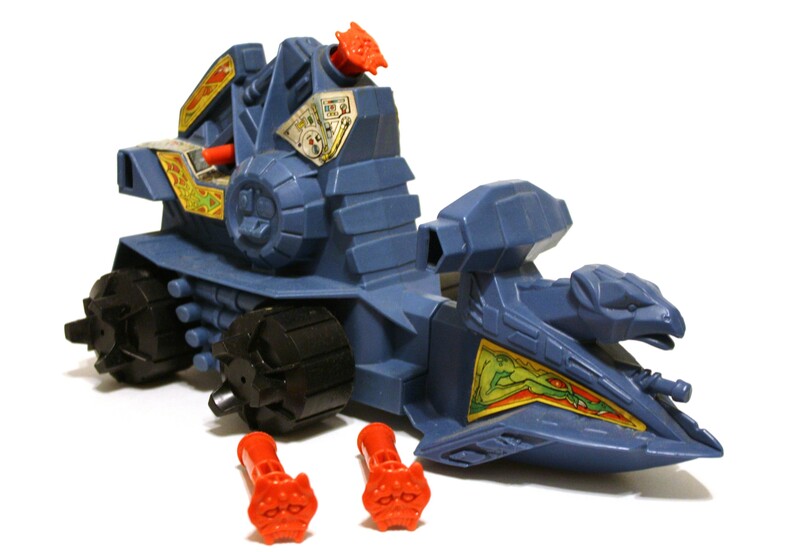 The toy was designed by Ted Mayer, who also designed the iconic Wind Raider, Attak Trak, Eternia, Slime Pit, and quite a few figures that came out between 1985 and 1987. 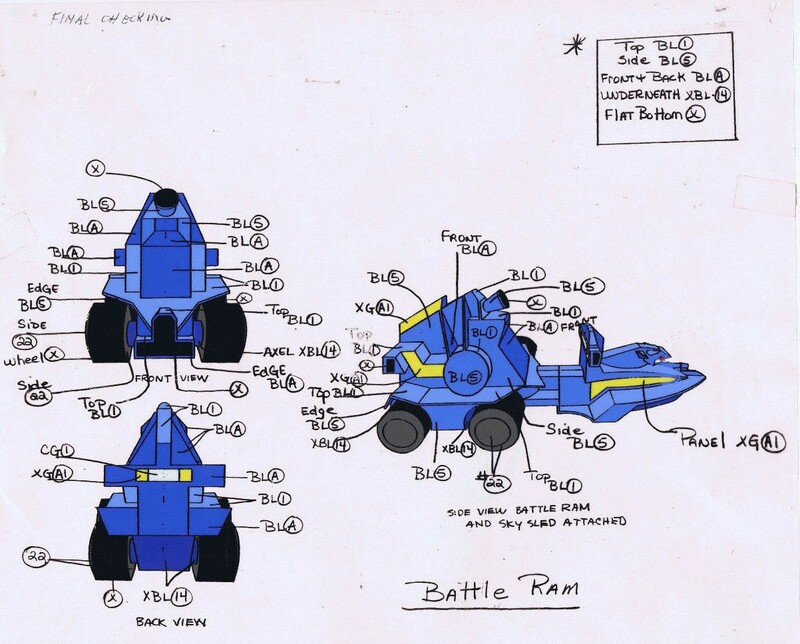 Let’s take a look at some of the artwork and prototypes leading up to the creation of the Battle Ram. 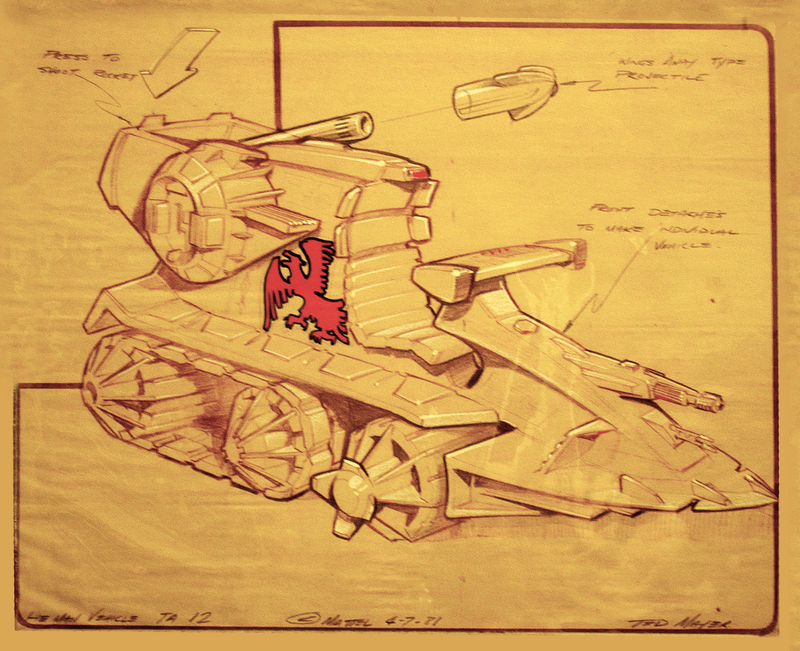 Mark also created another vehicle design called the Battle Catapult. 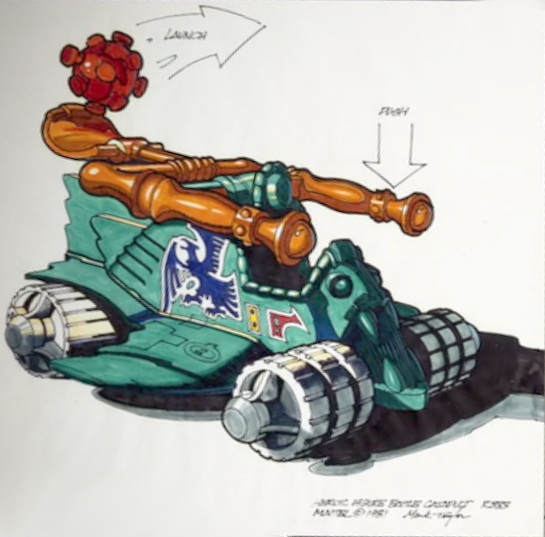 Again, not much resemblance to the Battle Ram, other than the wheels, color scheme, as well as the bird sticker on the side, which designer Ted Mayer would incorporate into some of his early Battle Ram concept art. 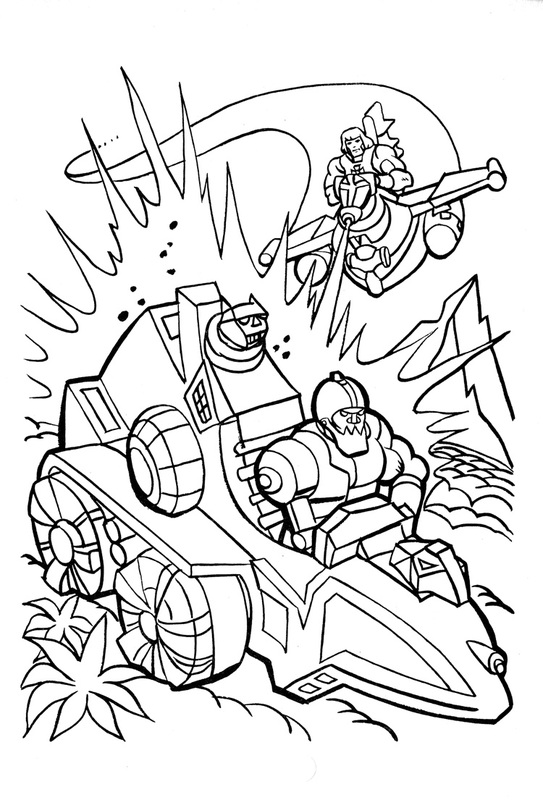 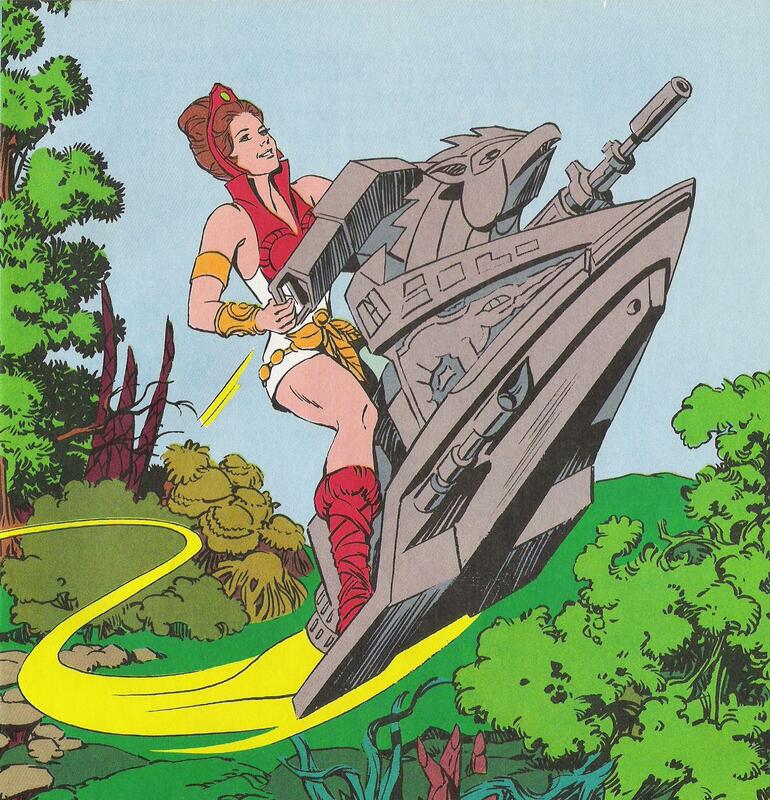 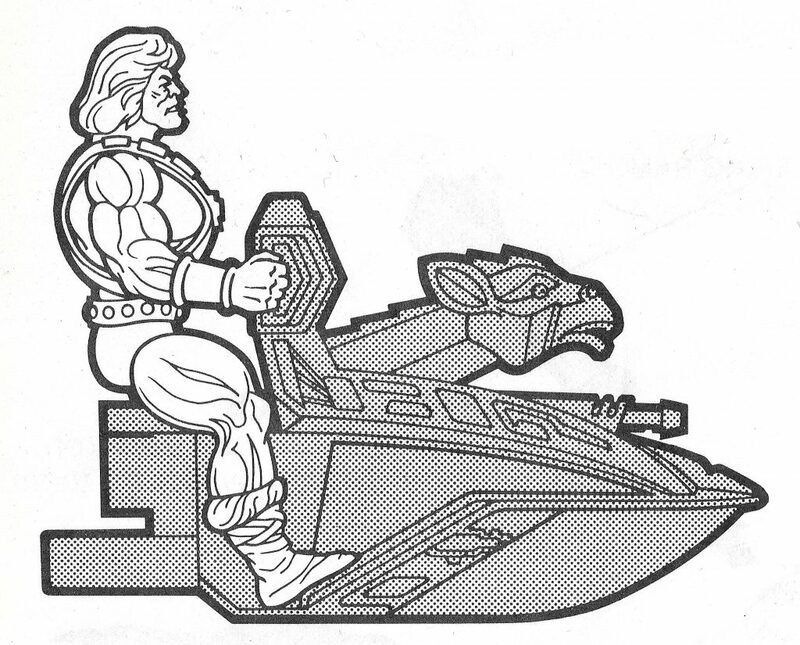 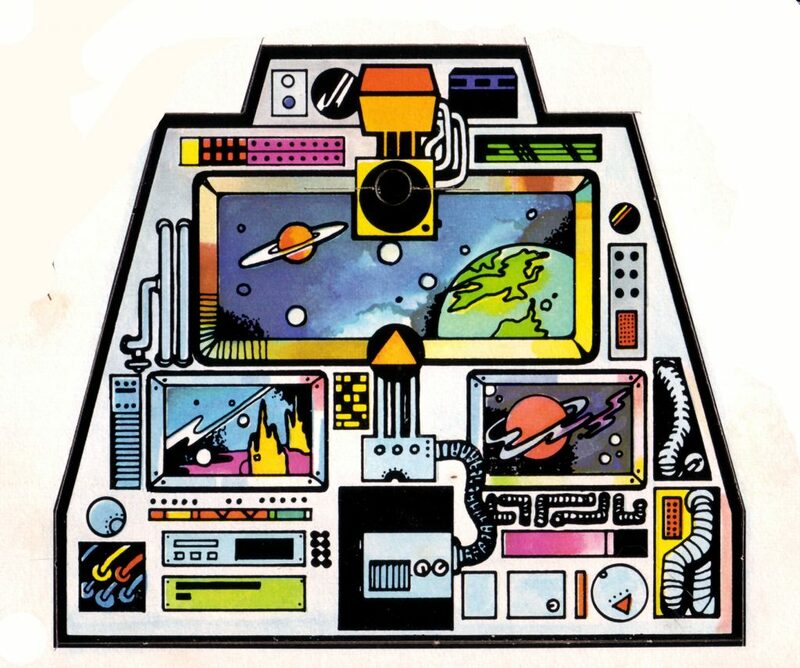 In early minicomic line art by Alfredo Alcala, this vehicle was depicted, but it was later replaced by the Battle Ram in the final colorized artwork. 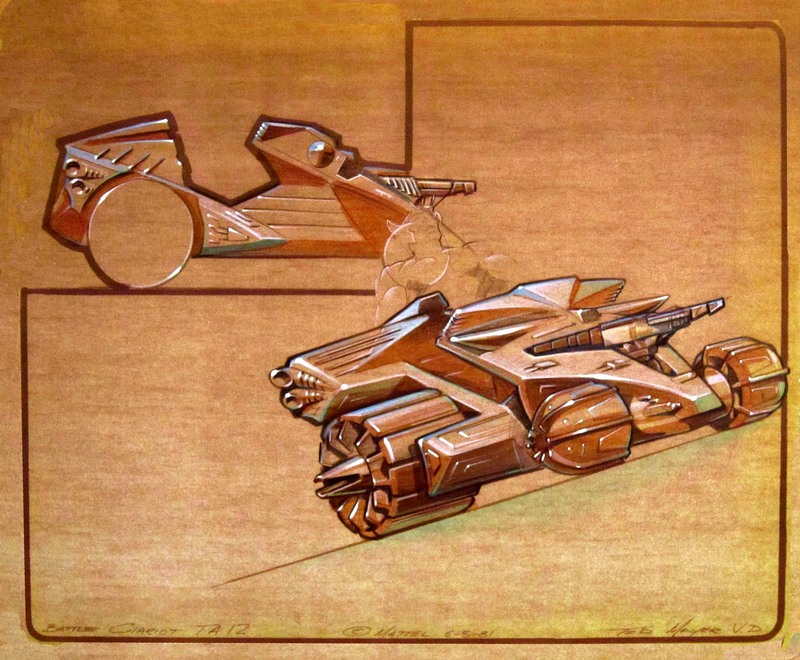 The first two of the above concept drawings are recognizable as ancestors in the Battle Ram family tree. 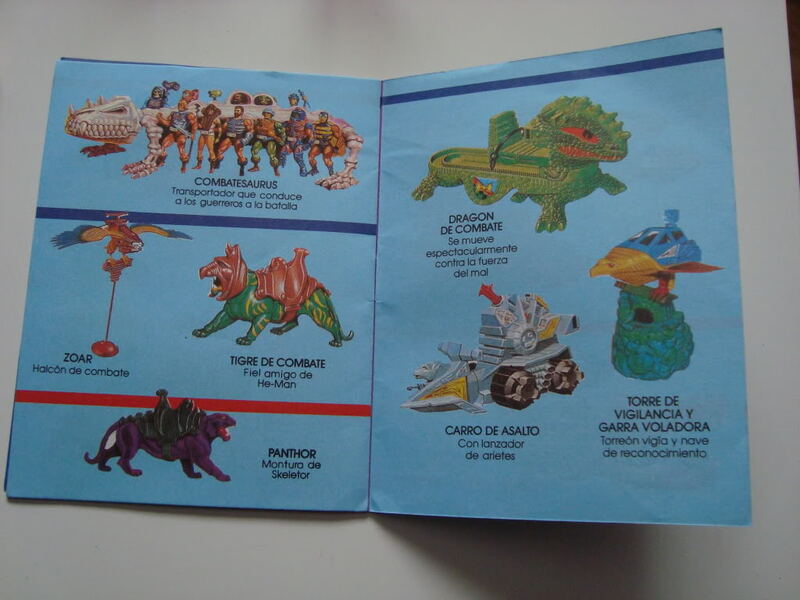 There are several differences from the final toy, of course. 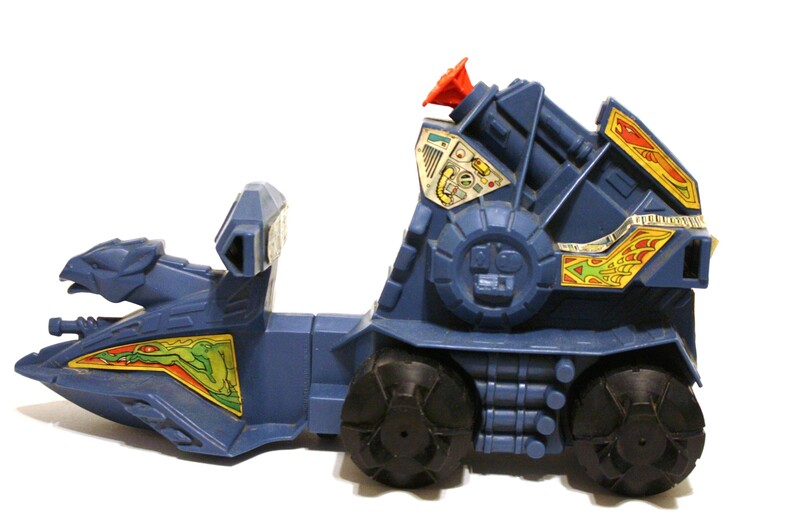 In both images, the Battle Ram had six wheels, four of them set with tank treads. 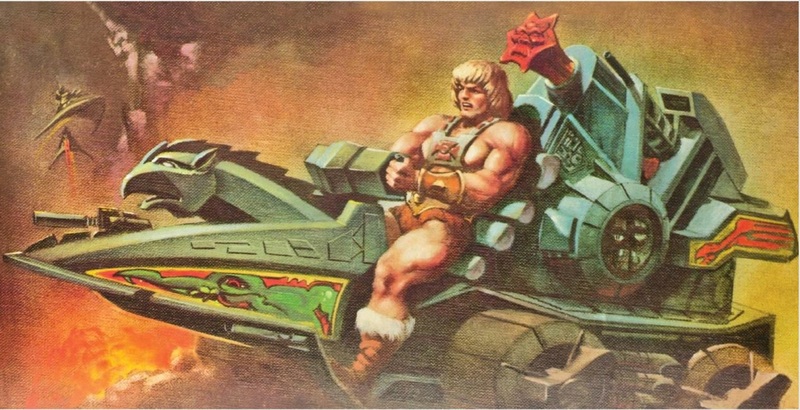 The first image features a Recaro-type seat and lacks the gargoyle figurehead in the front. 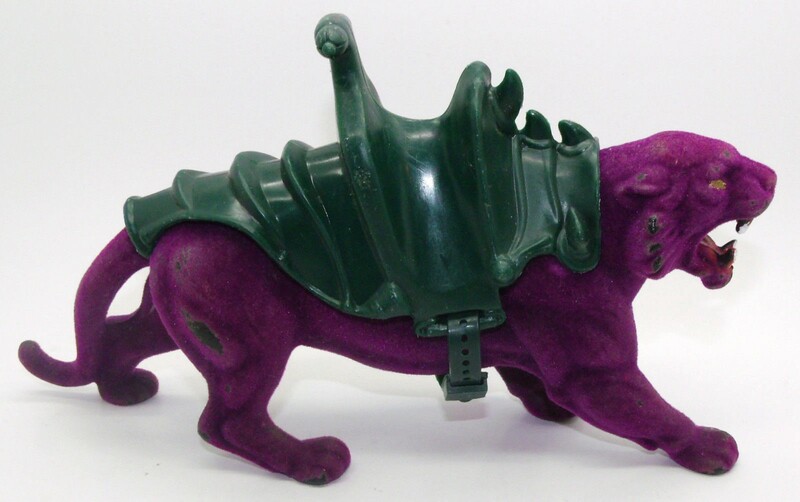 The second version has the familiar gargoyle figure head. 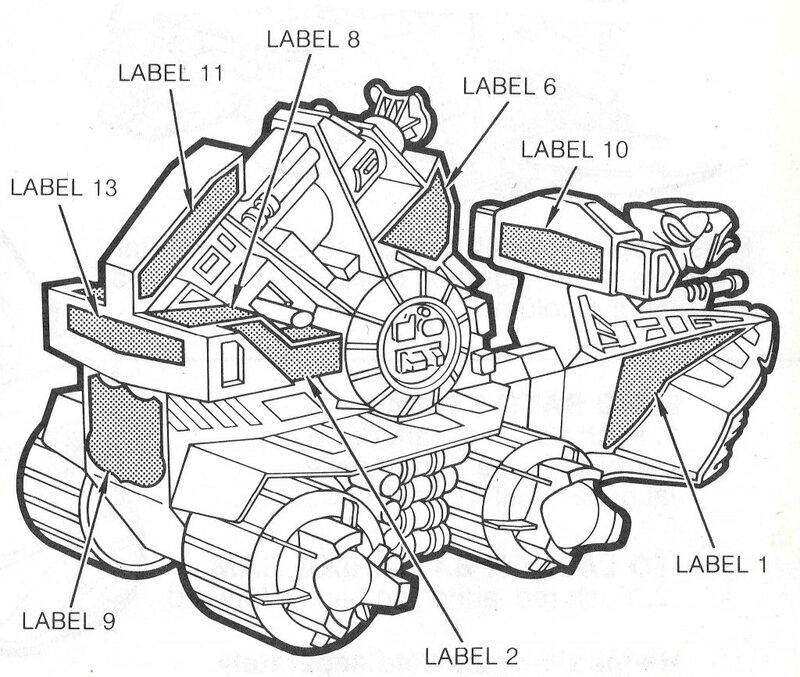 However it’s clear from the background image that the idea was for the front wheels to detach along with the front section. 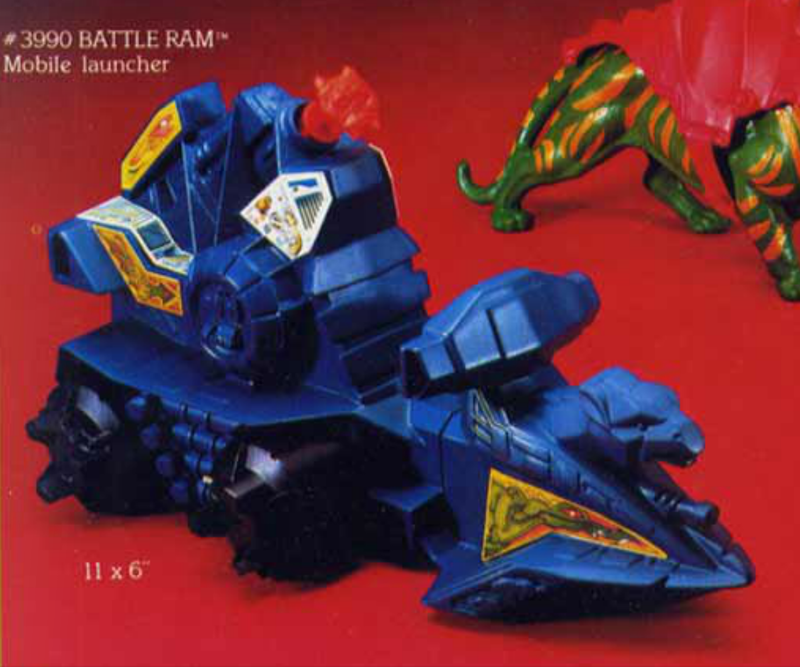 At this point the Battle Ram had no flight capabilities. 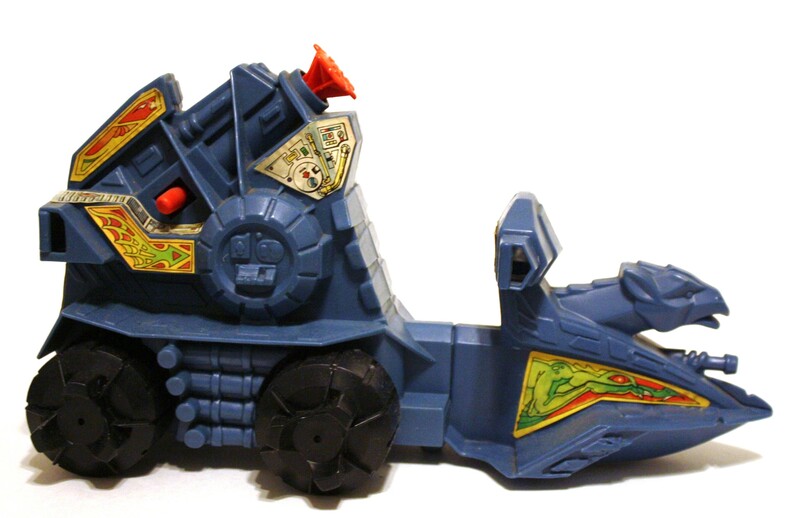 According to Ted Mayer, there would have been an additional wheel under the nose of the vehicle to allow it to roll freely, separate from the back half. 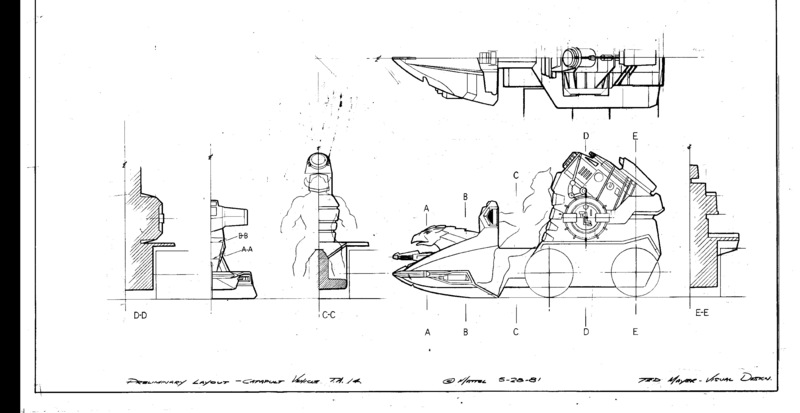 Ted says he was influenced by hot rod and WWII aircraft design, and you can certainly see those elements in in the form of exhaust pipes and nose art. 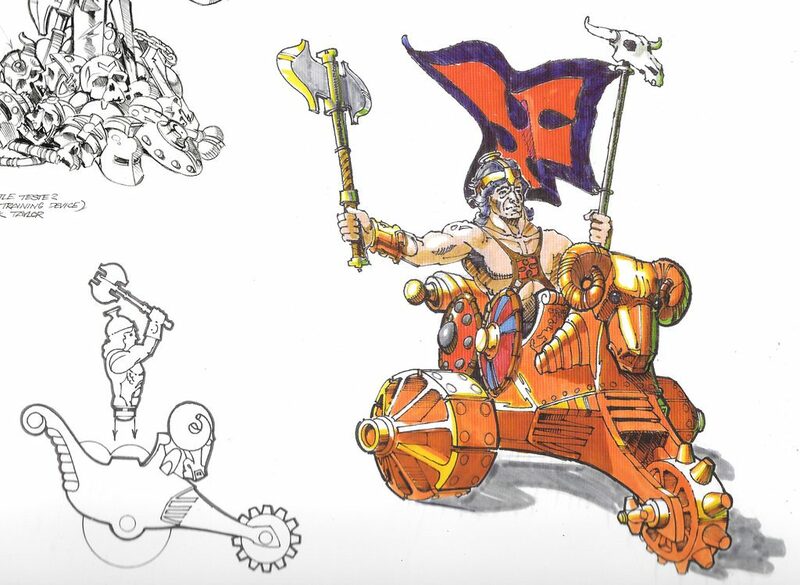 The above concept drawing shows the Battle Ram (featuring He-Man in a helmet, which he had in most early concepts) looking much closer to the final vehicle. 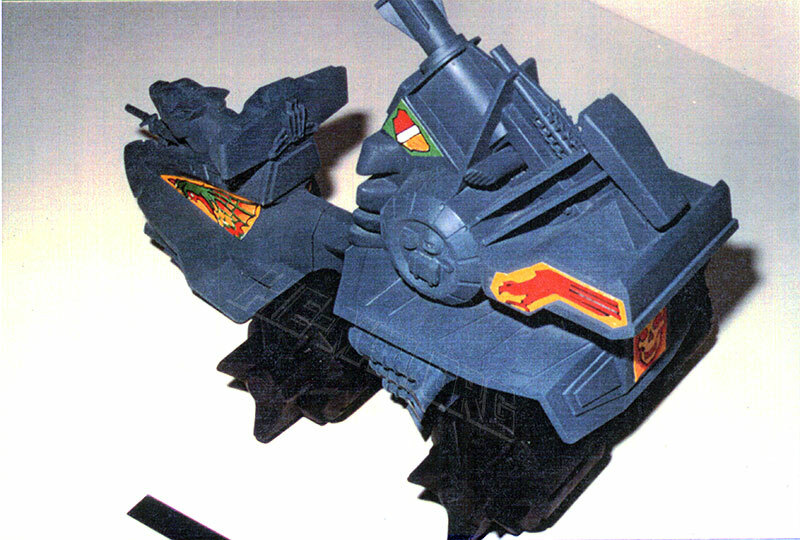 At this point it has only four wheels, and the detachable front section has been re-envisioned as a flying vehicle. 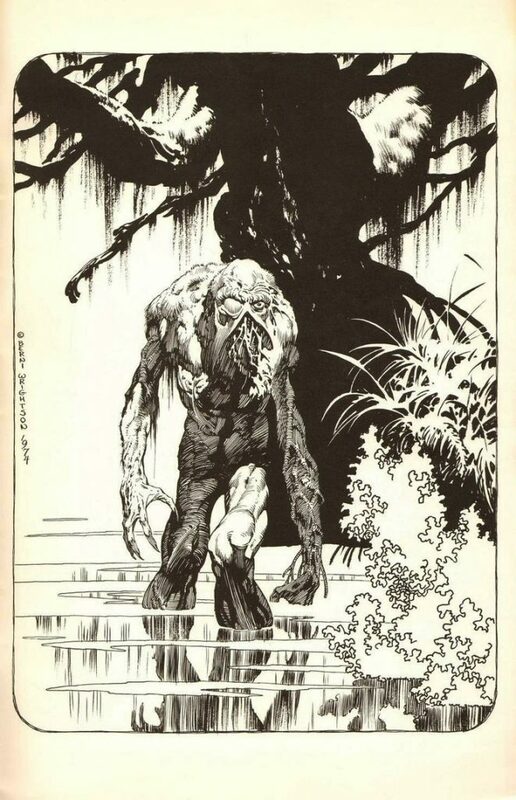 Rudy Obrero probably based his artwork from this image, or one very much like it. 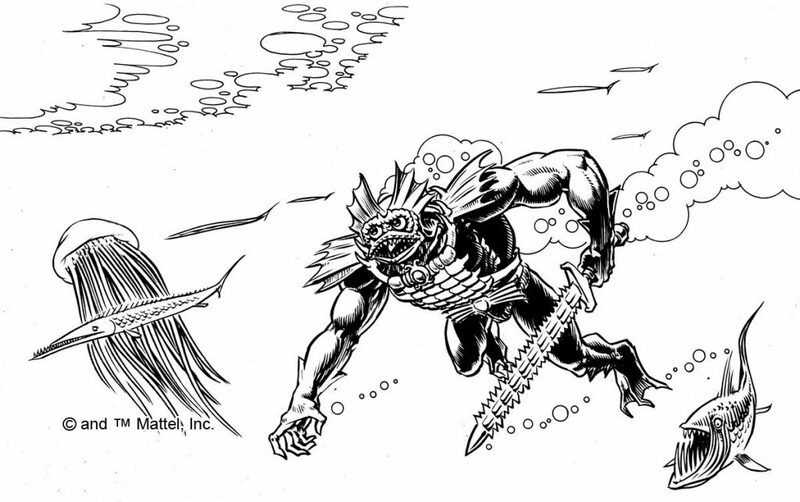 Image courtesy of Ted Mayer. 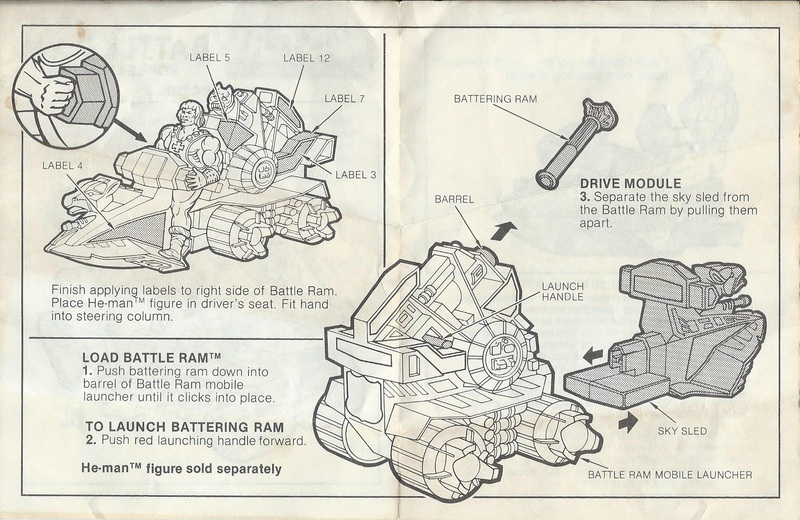 Prototype Battle Ram as shown in the 1981 licensee kit. 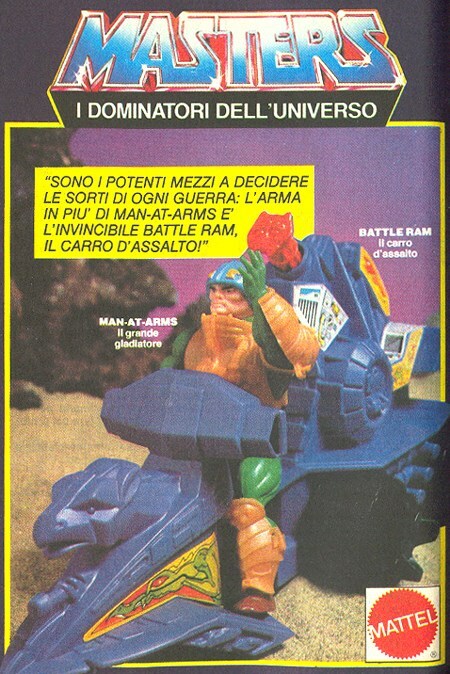 Prototype Battle Ram as pictured in Tomart’s Action Figure Digest. 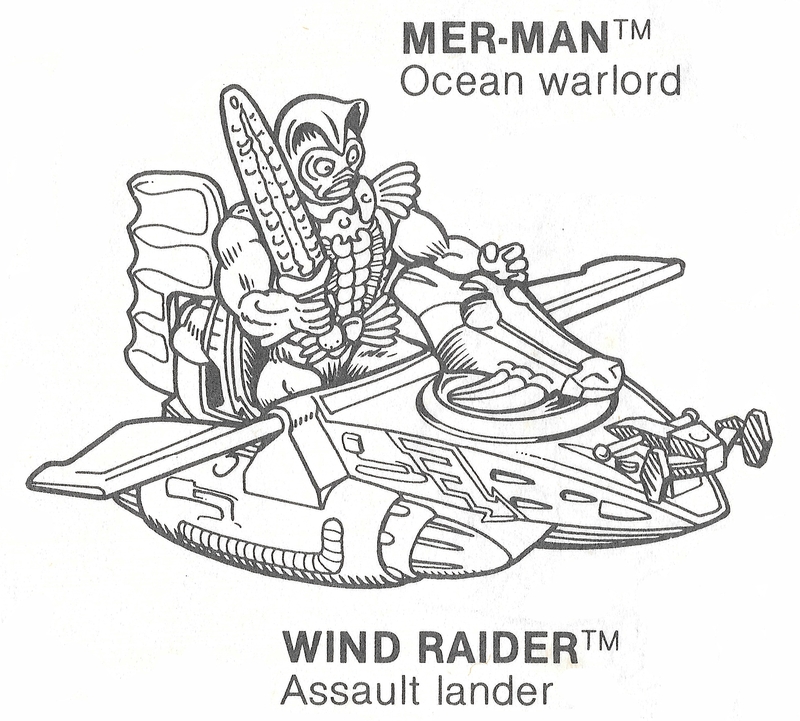 As suggested by the packaging artwork and concept drawings, the front half of the production toy detaches from the main vehicle, and is something of a flying WaveRunner. 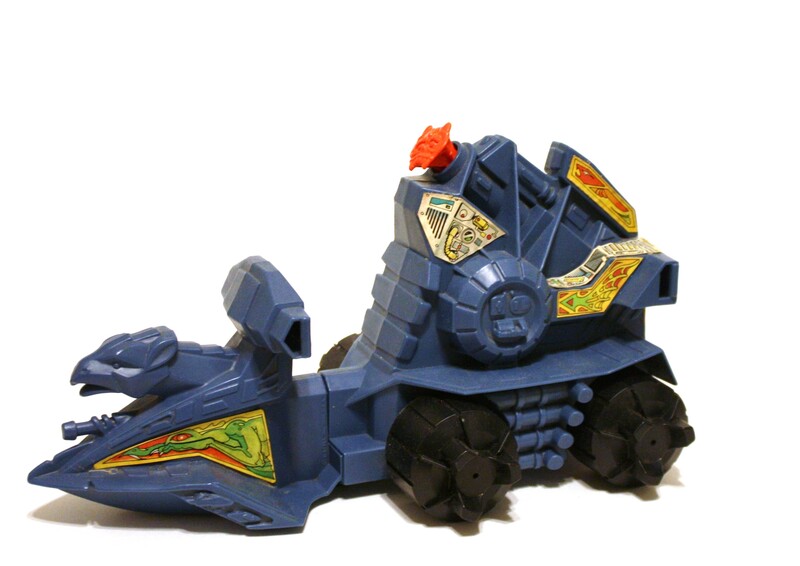 I’m not sure if a toy vehicle had come out before with that concept, but as a five year old I’d never seen anything like it, and it added a tremendous amount of play value. 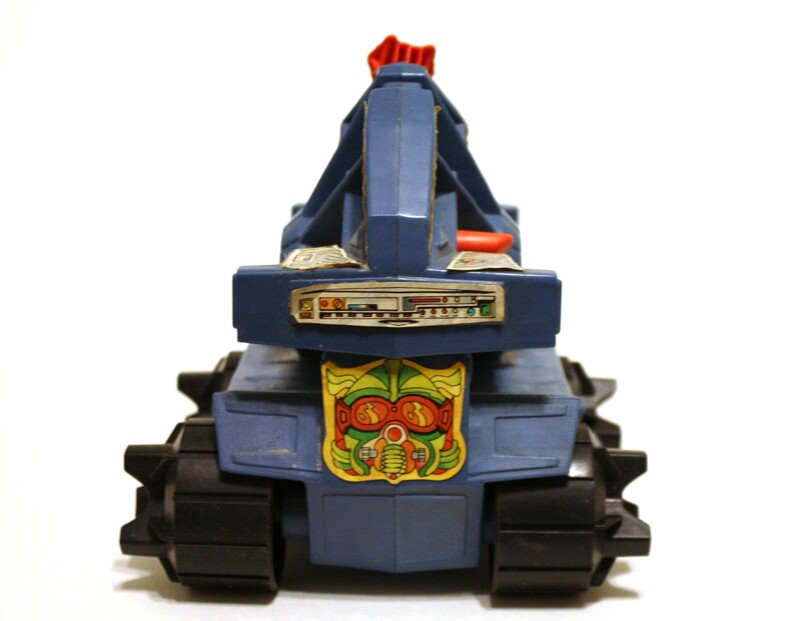 The back half features a spring loaded rocket launcher with a red firing mechanism. 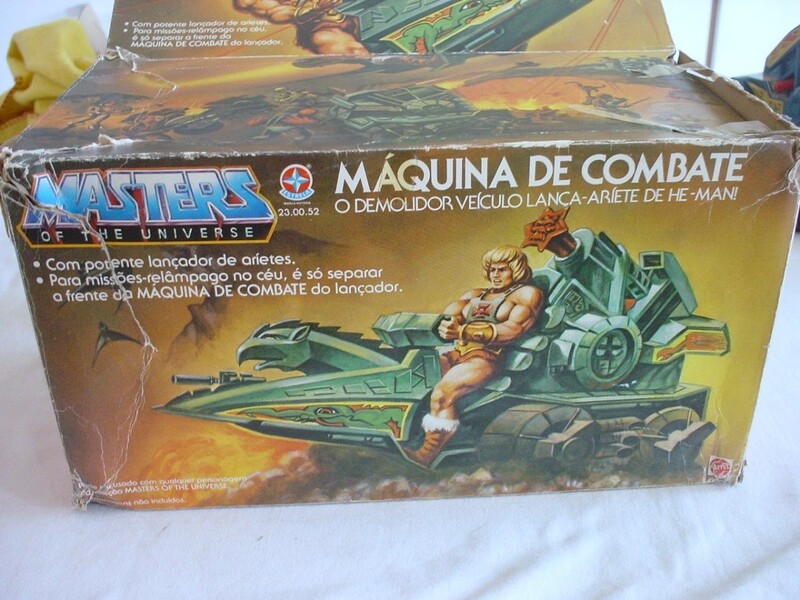 The rockets themselves (called battering rams on the packaging) came with sculpted gargoyle faces. 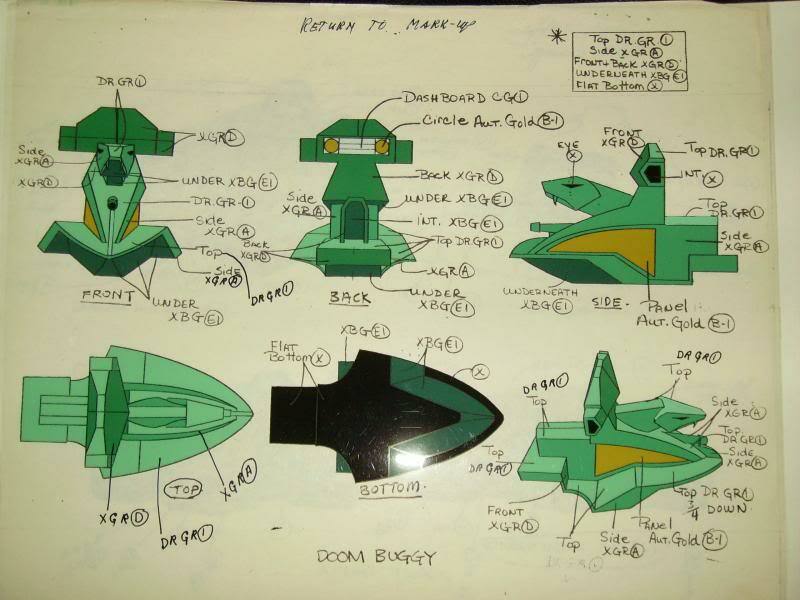 The wide profile of the rockets was designed to help prevent accidental choking. 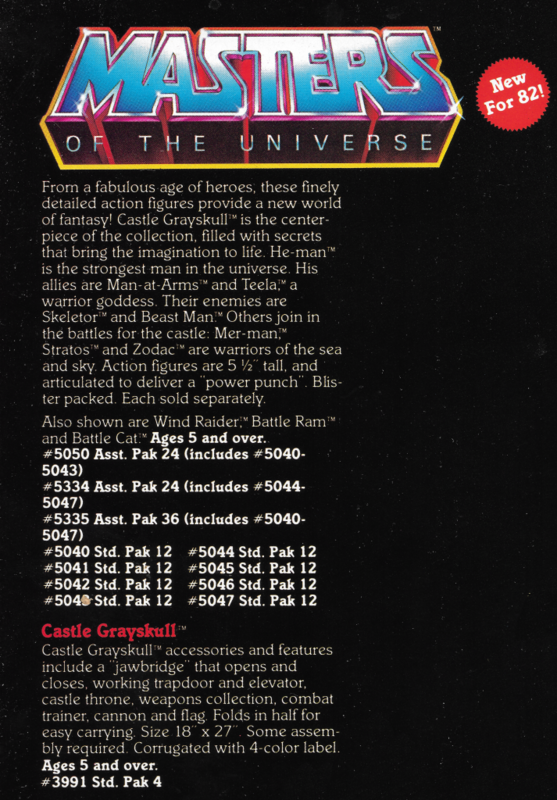 Description from the 1984 UK Annual, which drew from very early source material. 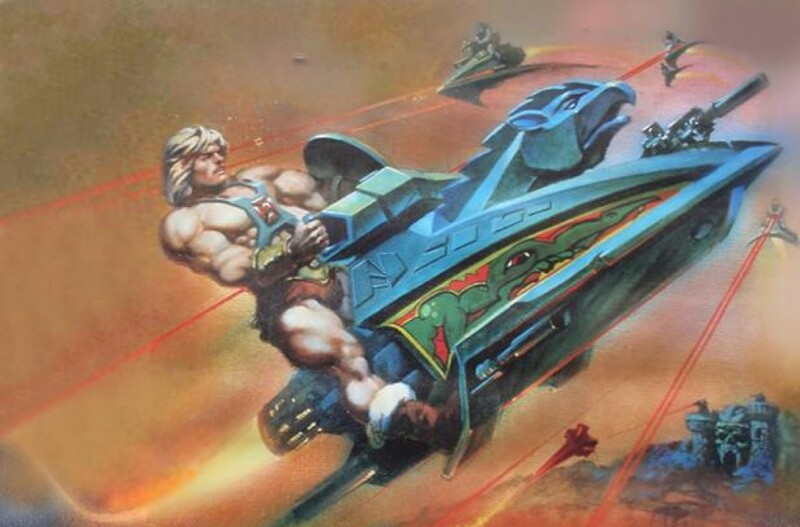 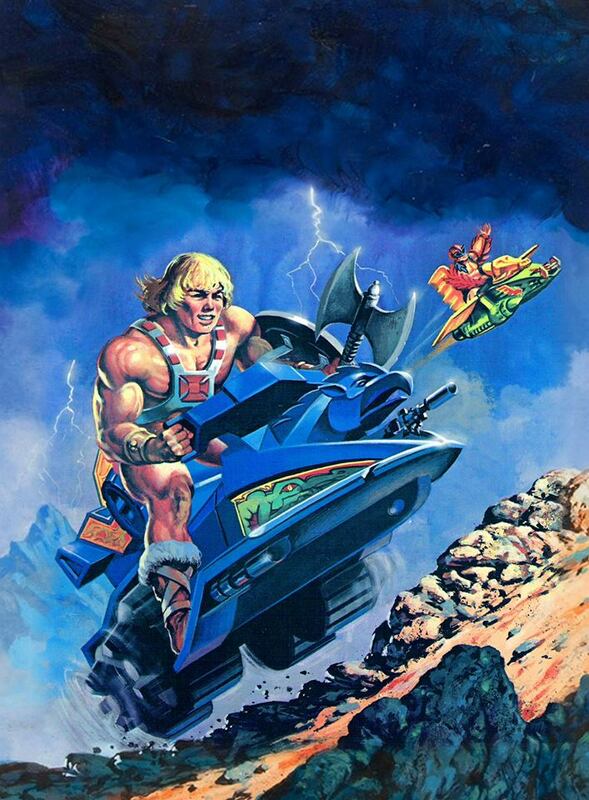 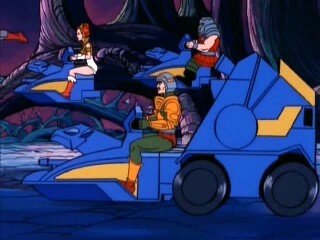 Image from He-Man and the Power Sword, showing the front half of the Battle Ram scooting along the ground. 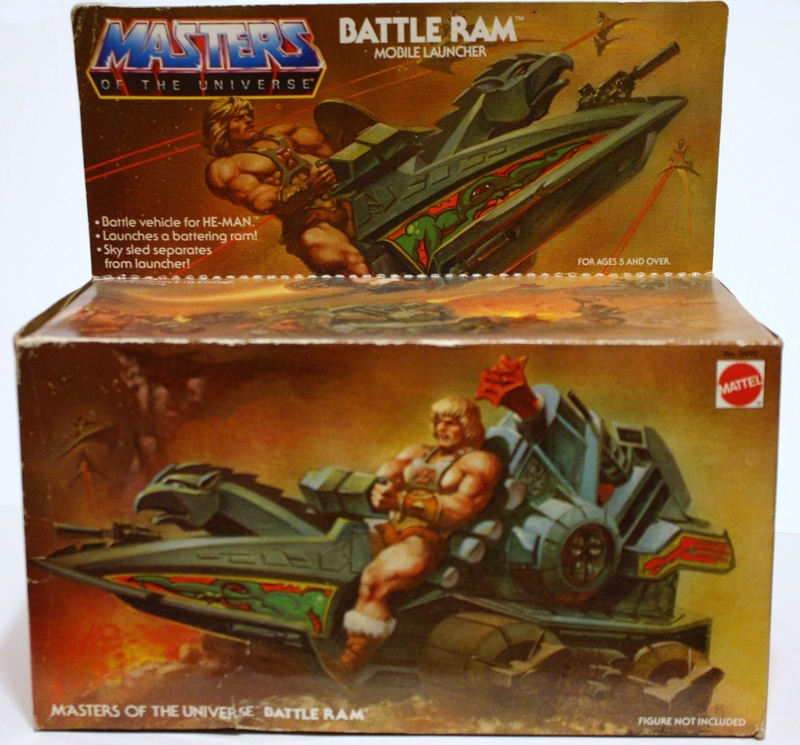 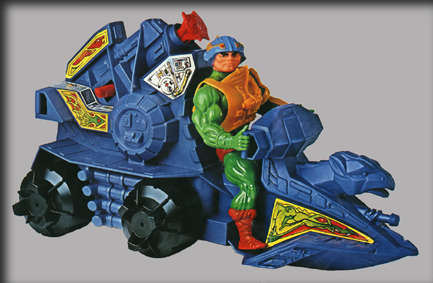 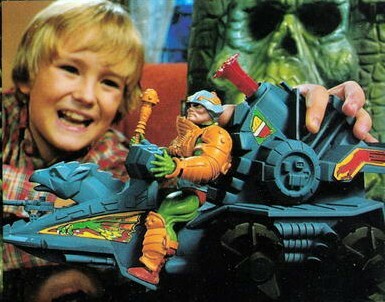 The Battle Ram is the first and best example of what made Masters of the Universe vehicles so great. 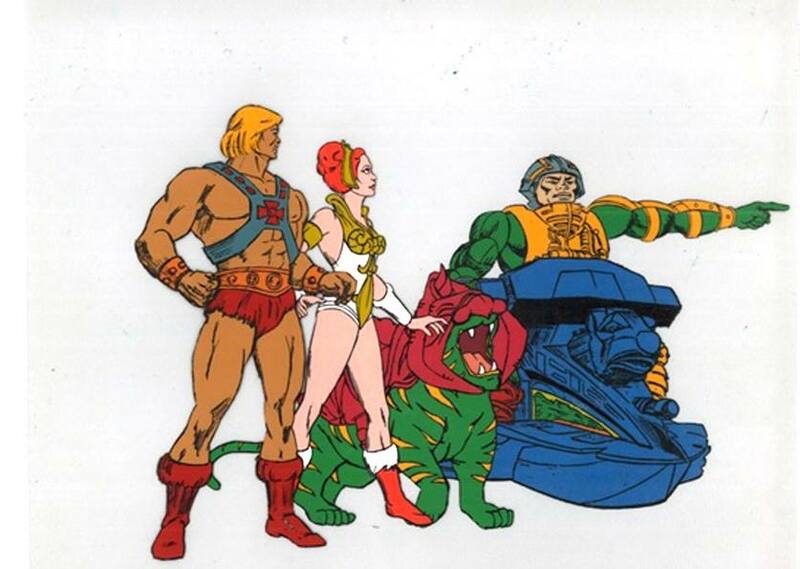 They were a marriage of Gothic aesthetics with futuristic tech, relics in the MOTU universe of a bygone age of mass-produced technological wonders. 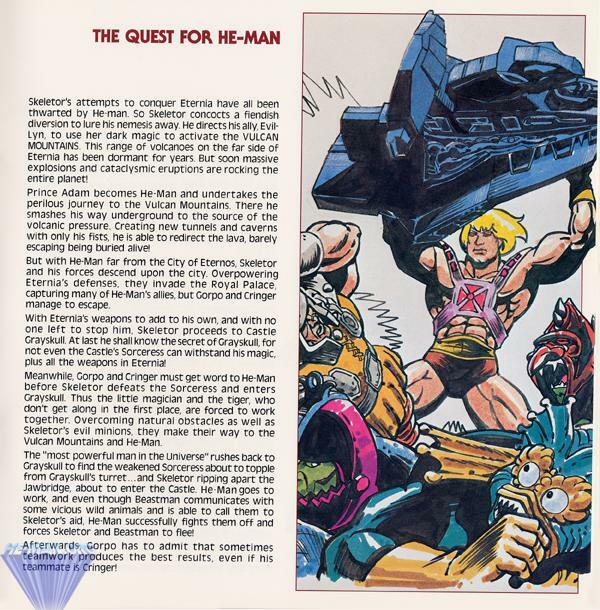 “Carries Warriors through Space and Time” – A TARDIS for He-Man? 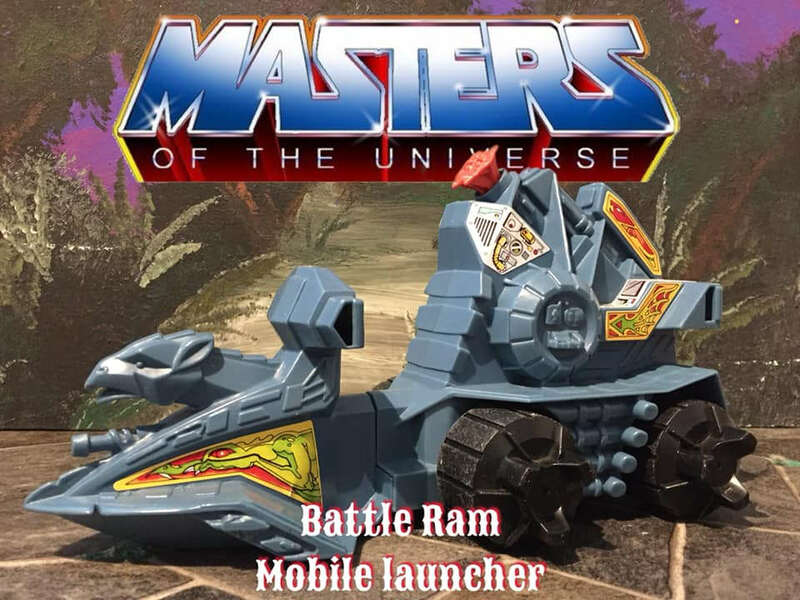 There were many great vehicles produced for the Masters of the Universe toyline, but in my opinion, none greater than the amazing Battle Ram. 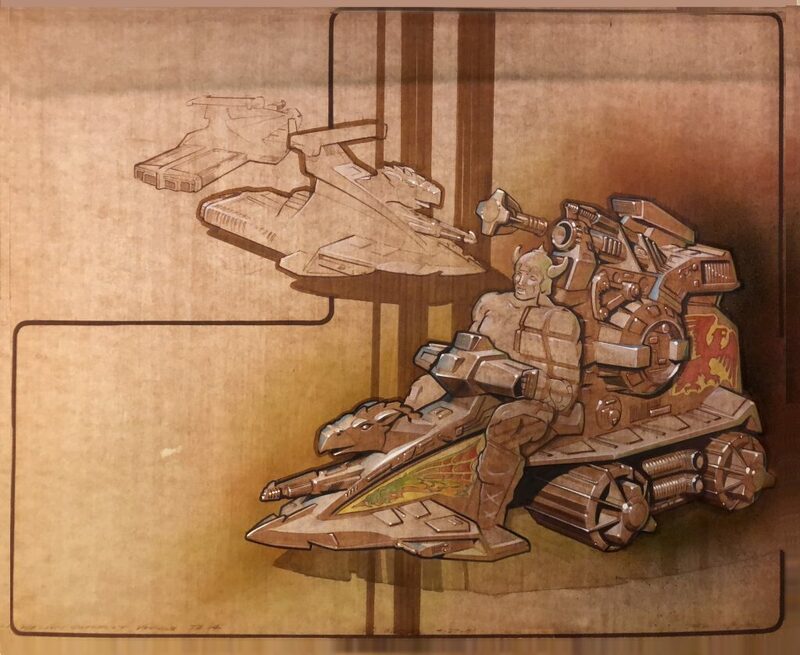 From German artist Deimos comes an amazing illustration of a concept for an Evil Horde vehicle. 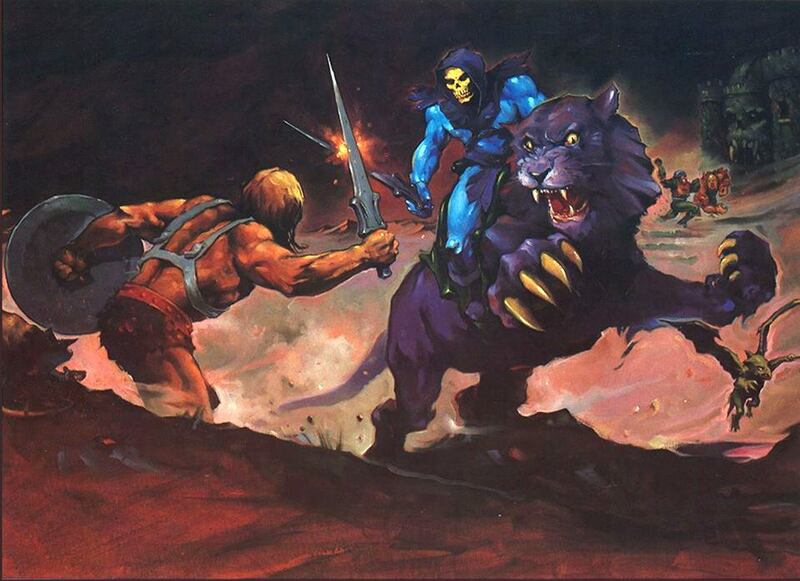 This is an evocative piece with loads of atmosphere and action. 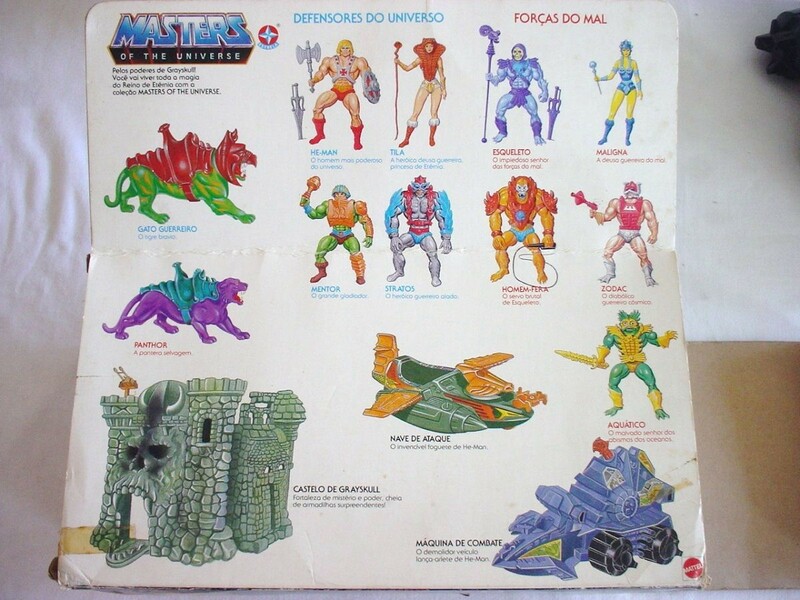 His artwork seems to include a lot of details specific to the vintage toys, while giving the characters a feeling of depth and realism (or as realistic as it gets with Masters of the Universe). 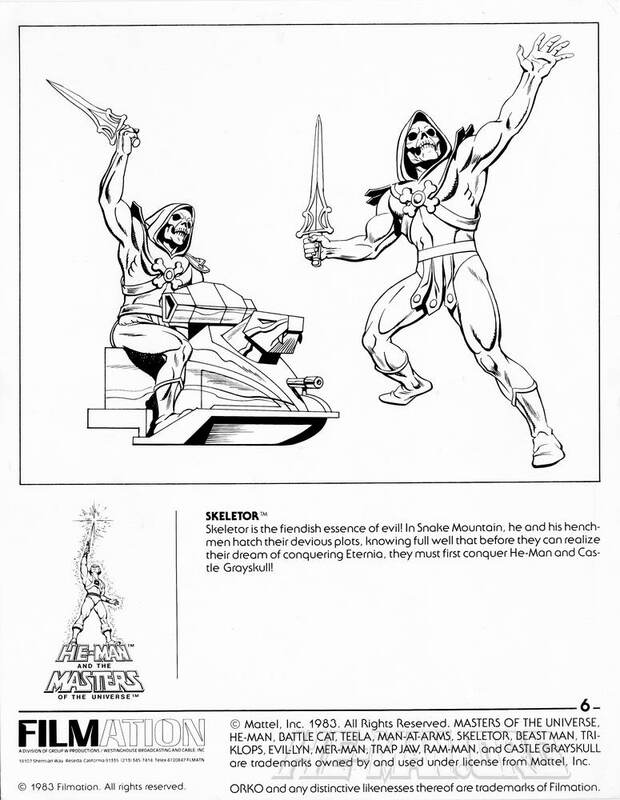 The design came from the Summer 1986 issue of Masters of the Universe Magazine. 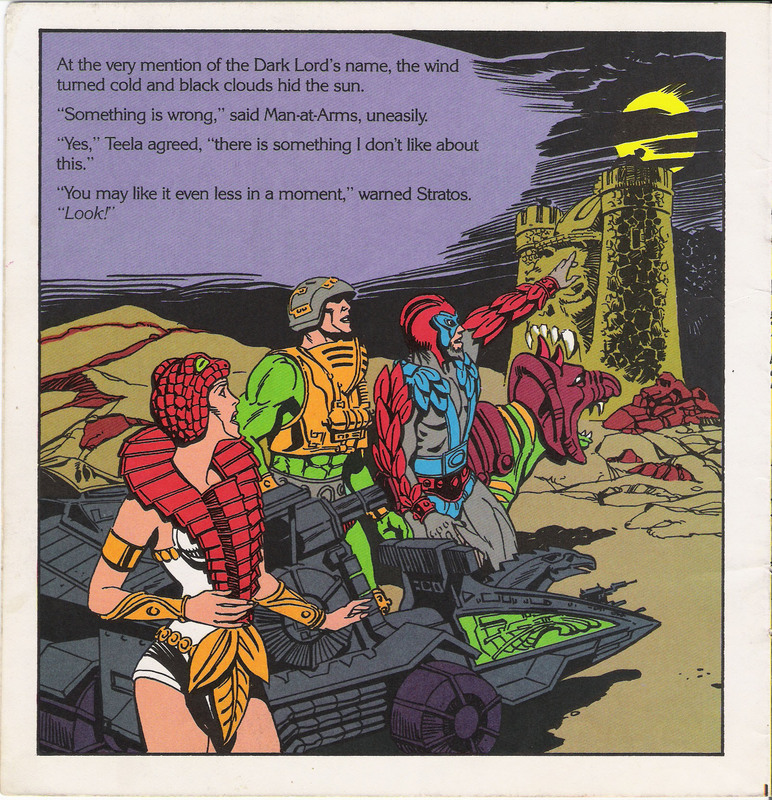 Thanks, Matthew Martin, for the tip. 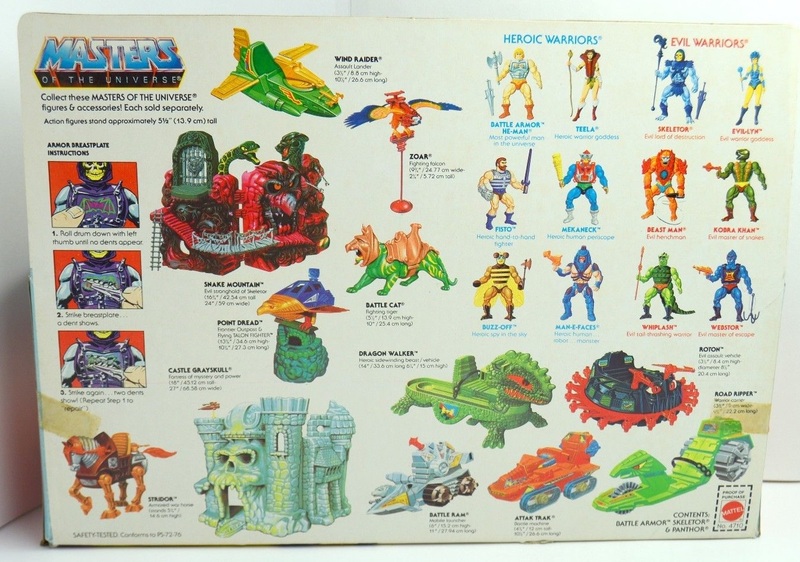 I would have loved each and every one of these as a kid. 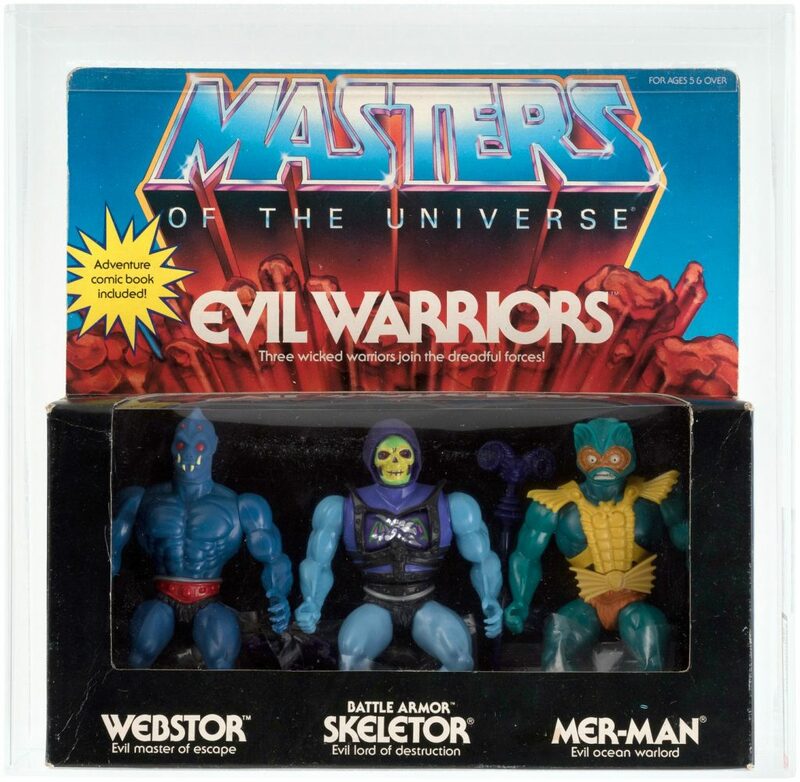 I’m not sure why Mattel never produced them. 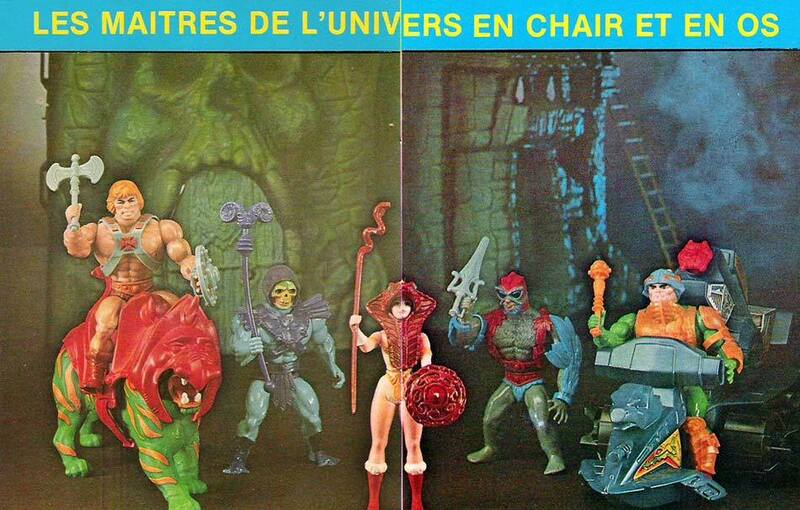 Masters of the Universe probably could not have happened in any decade other than the 80s. 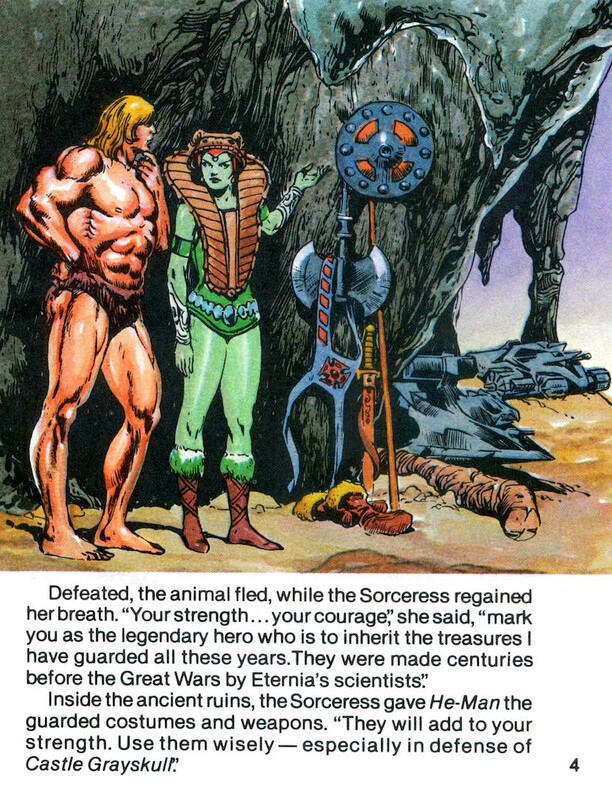 In 1982, it came at the heels of two disparate but very popular movie franchises – Star Wars and Conan the Barbarian. 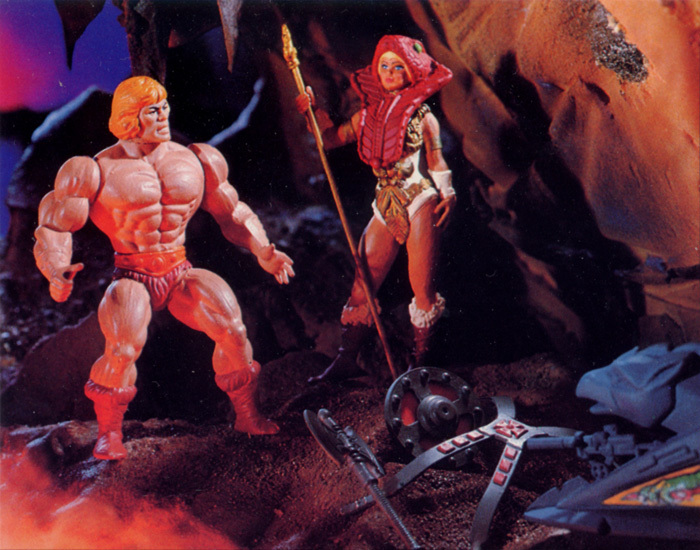 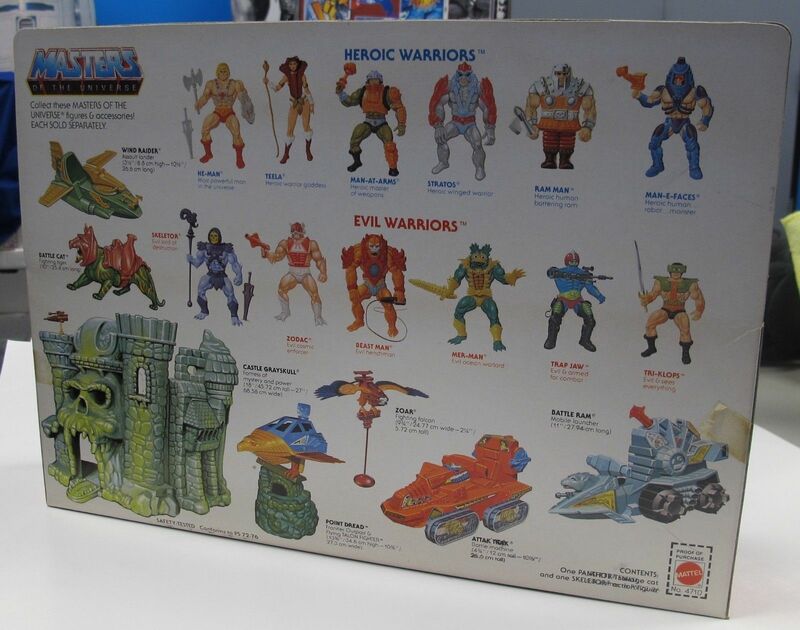 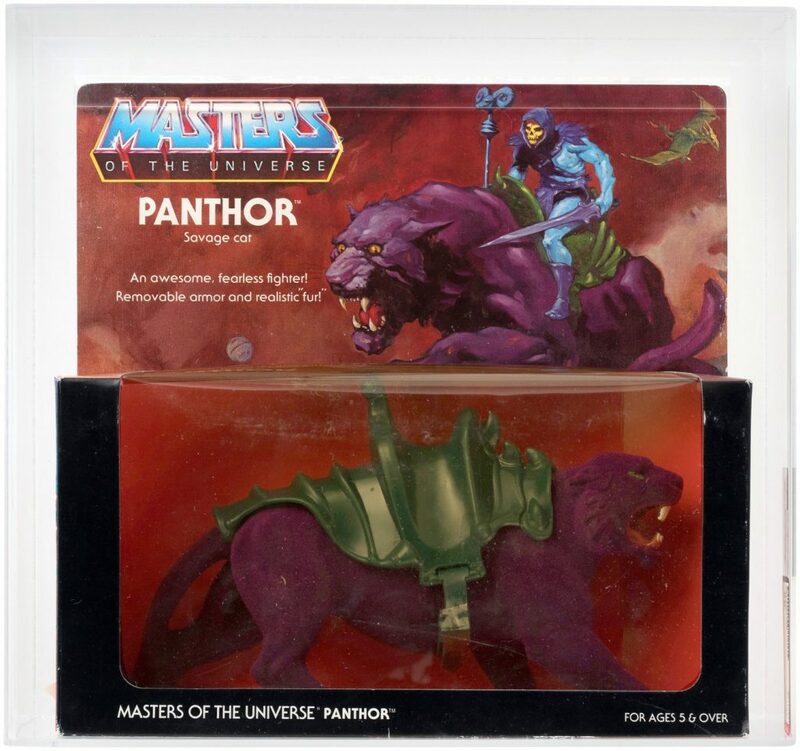 Those influences weighed heavily on the first wave of He-Man figures, playsets and vehicles. 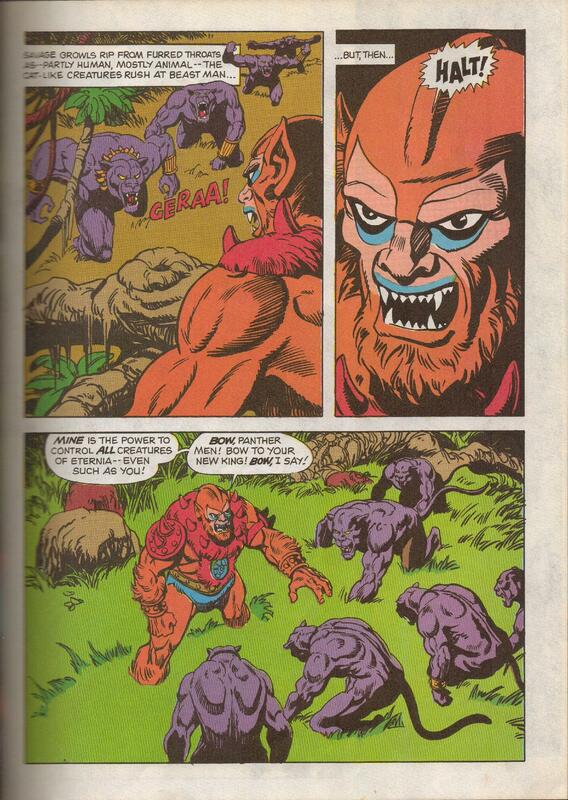 Almost every figure, although generally barbaric in appearance, featured some kind of subtle sci-fi element. 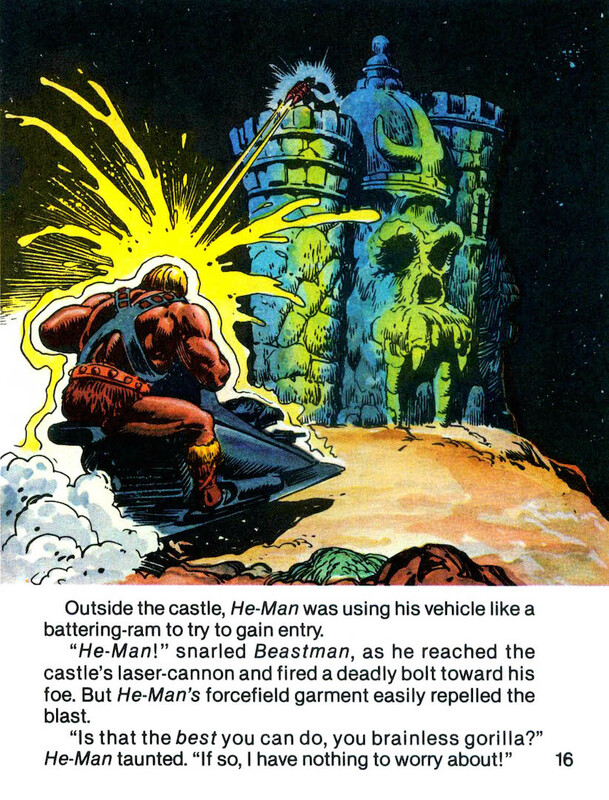 Even the grim, Frazetta influenced Castle Grayskull had a laser turret and a computer system. 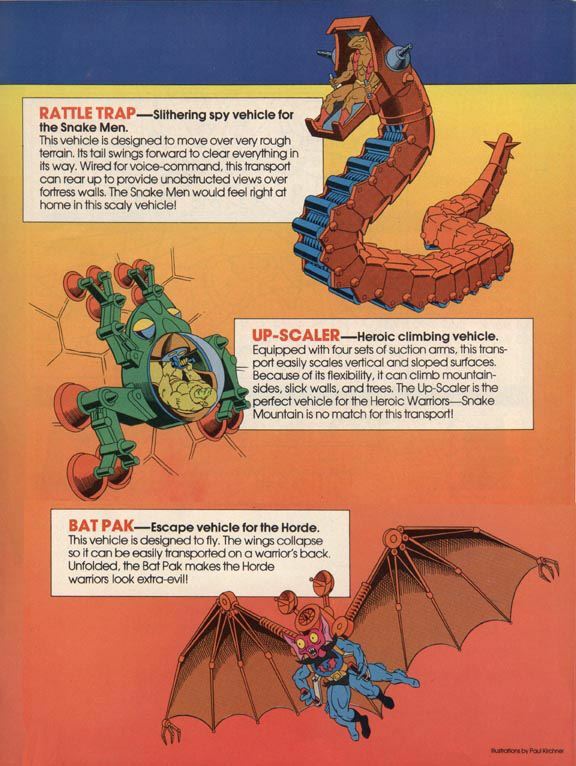 As the line grew long in the tooth it tended rely more on gimmicks, but the early figures were mostly about cool designs. 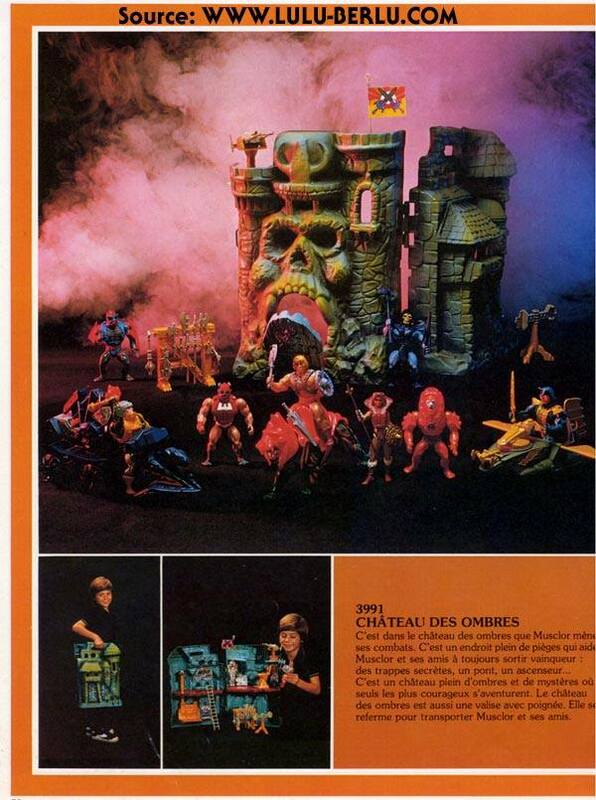 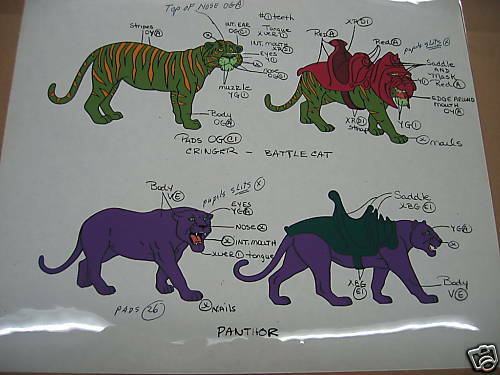 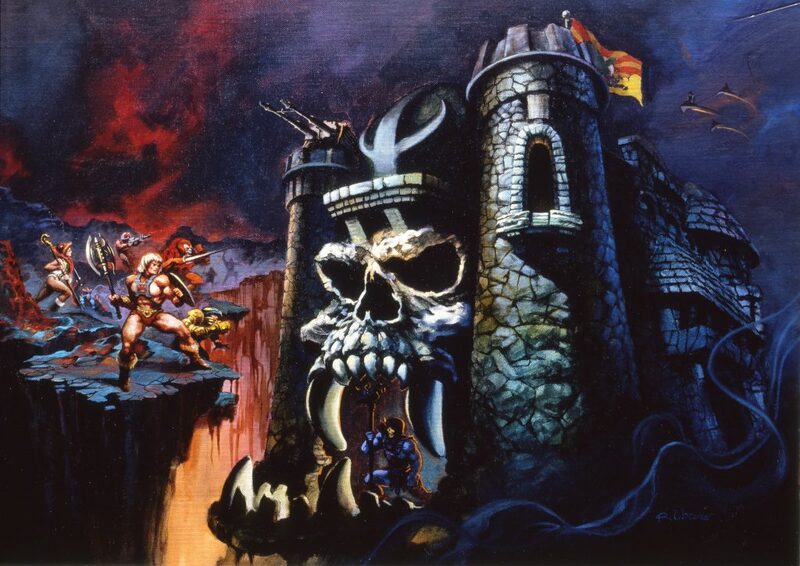 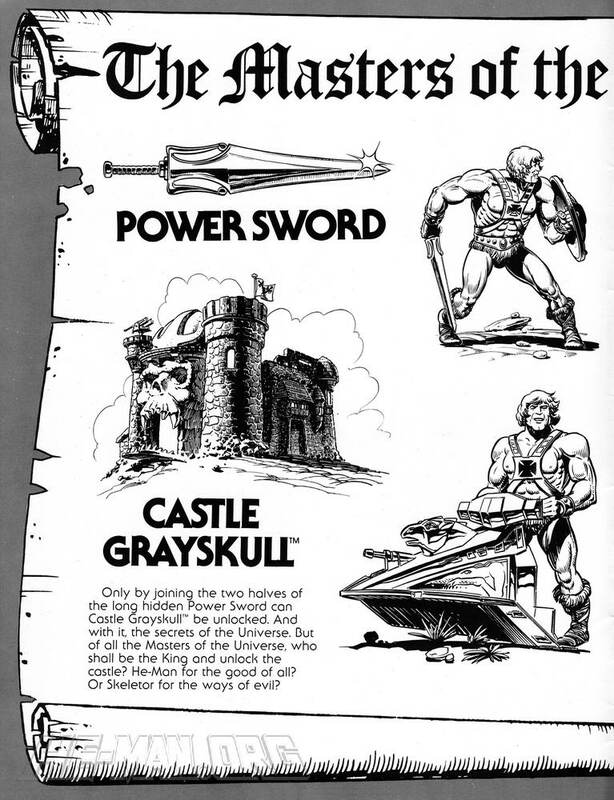 Mattel artist Mark Taylor was responsible for the lion’s share of the early figures and for Castle Grayskull. 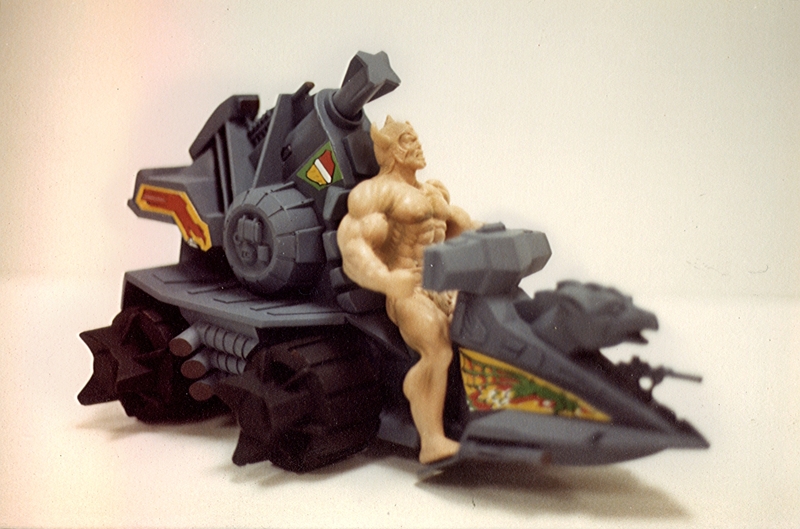 Ted Mayer assisted with the sculpting of Castle Grayskull and created the line’s first two vehicles, Battle Ram and Wind Raider. 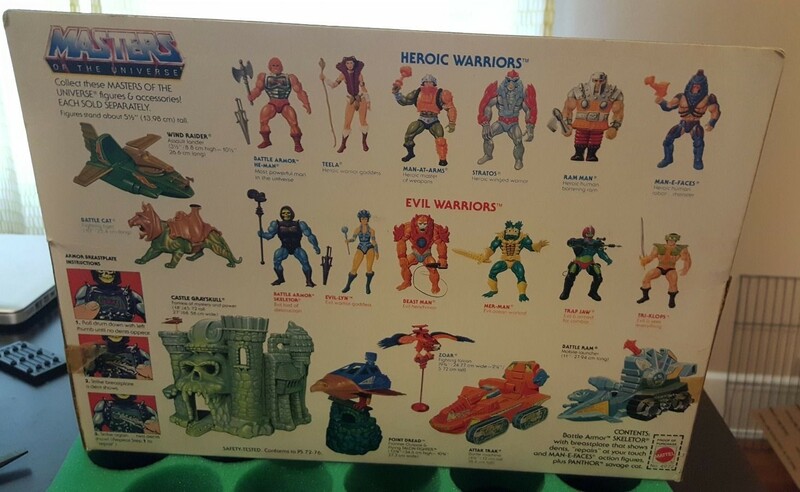 He also went on to design many of the 1985-1987 figures. 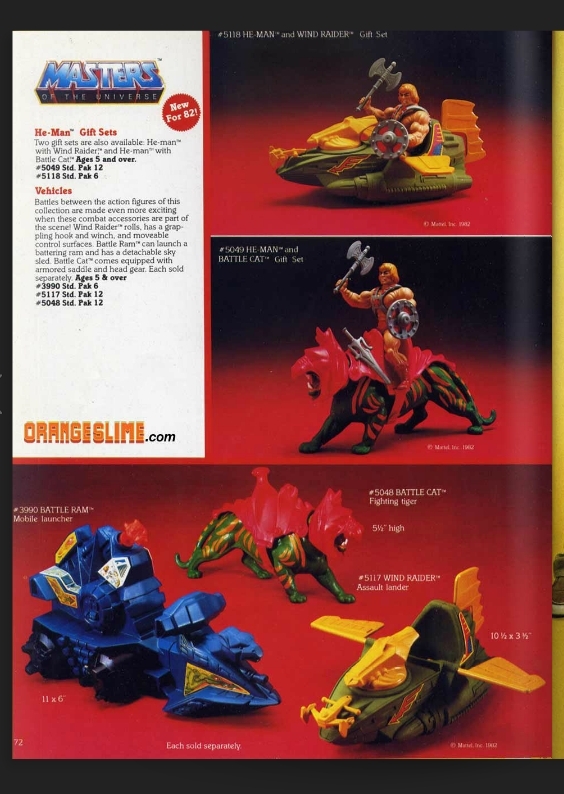 It’s normal for toys to have some inconsistency between first promotional material and finished product. 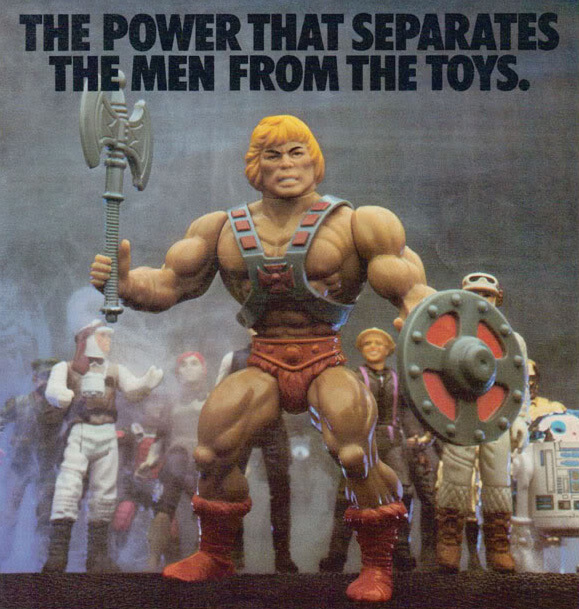 That happened all the time in the Filmation He-Man and the Masters of the Universe Series. 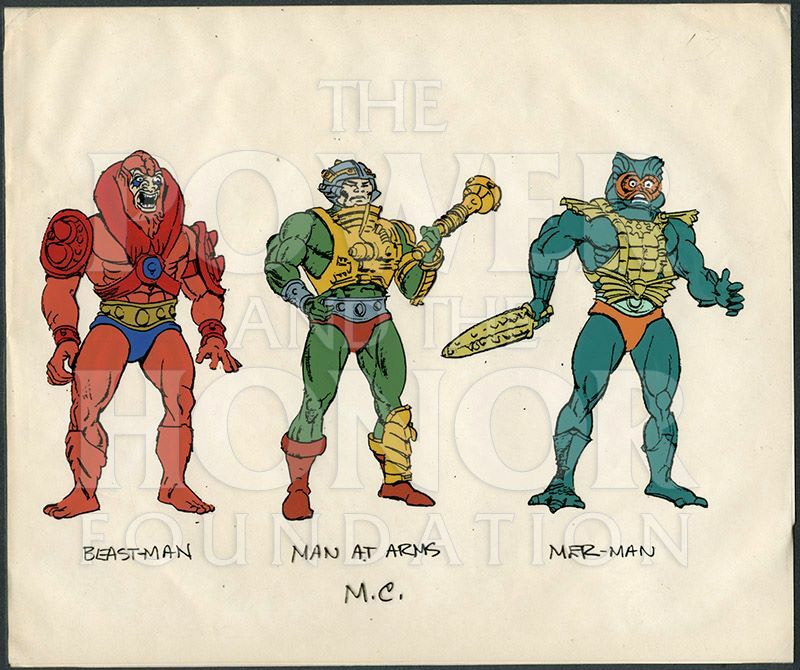 Filmation would receive early concept art for a figure and create a story based on that art. 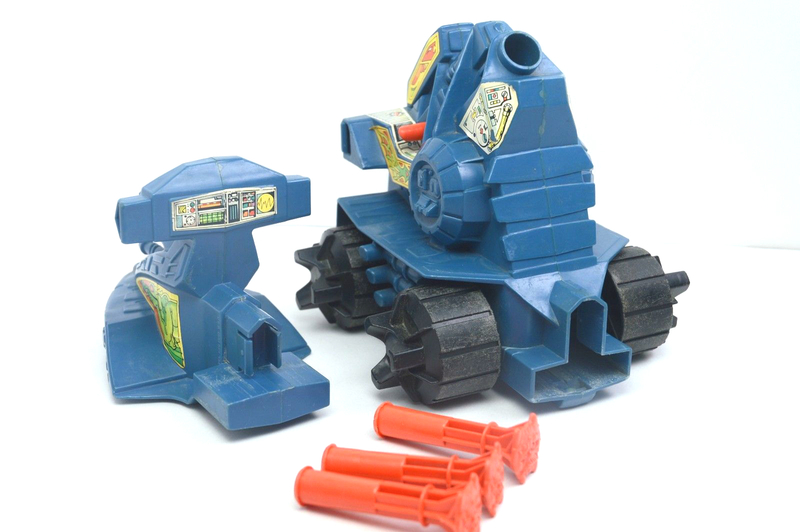 By the time the toy came out it would sometimes be radically different. 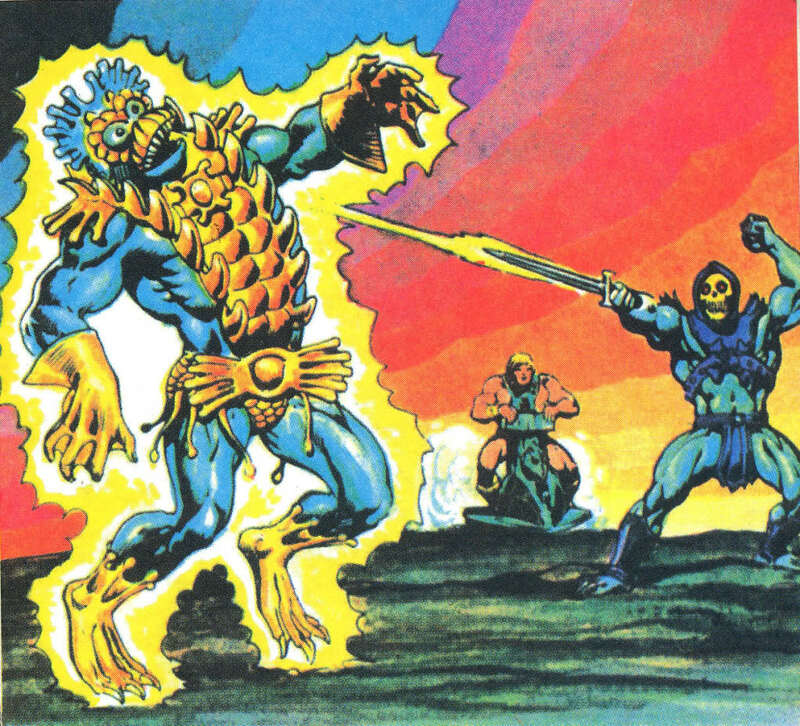 For young kids in the 80s, often the first glimpse of upcoming figures came from the cross sell art on the back of MOTU packaging. 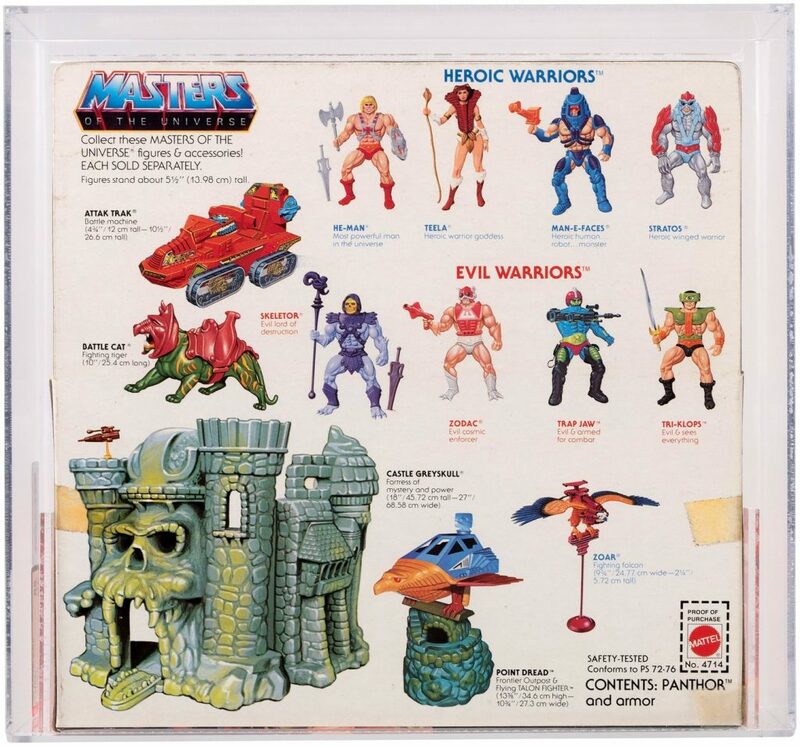 When Mattel released the first four figures in 1982, we could see on the back of the package that more were coming. 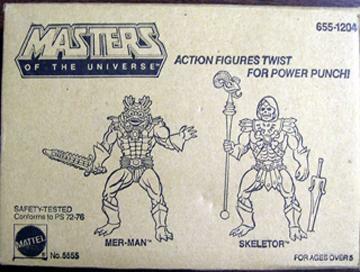 A lot of us already had our He-Man, Skeletor, Beast Man and Man-At-Arms figures. 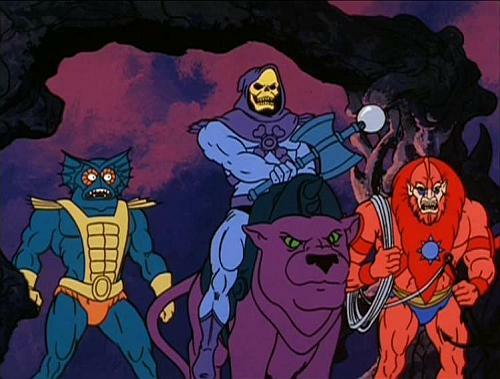 But who were these other guys? 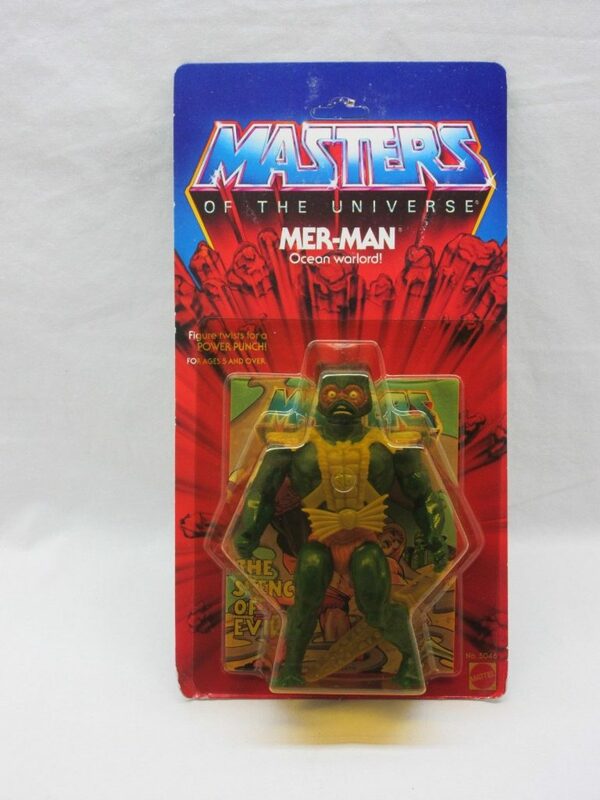 Mer-Man especially caught my eye. 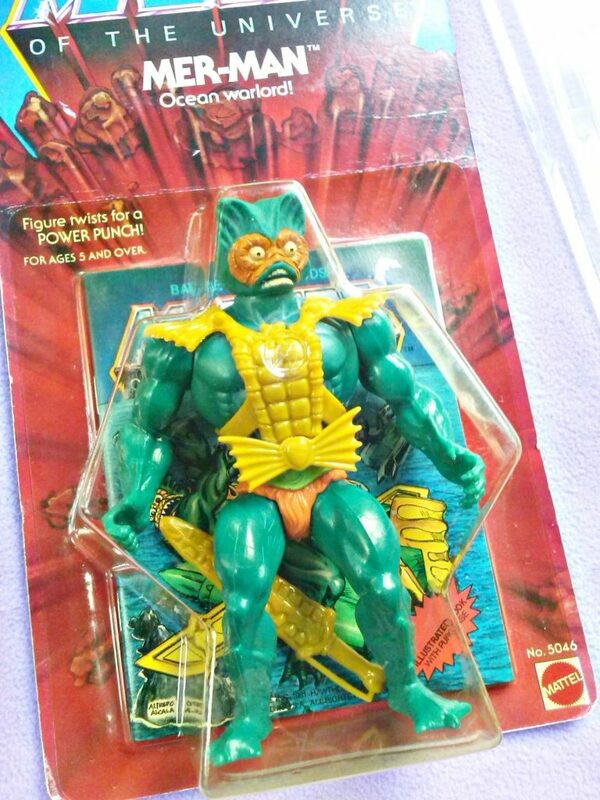 These were the first action figures I ever had, and the idea of an aquatic half-man half-fish warrior really fascinated me. 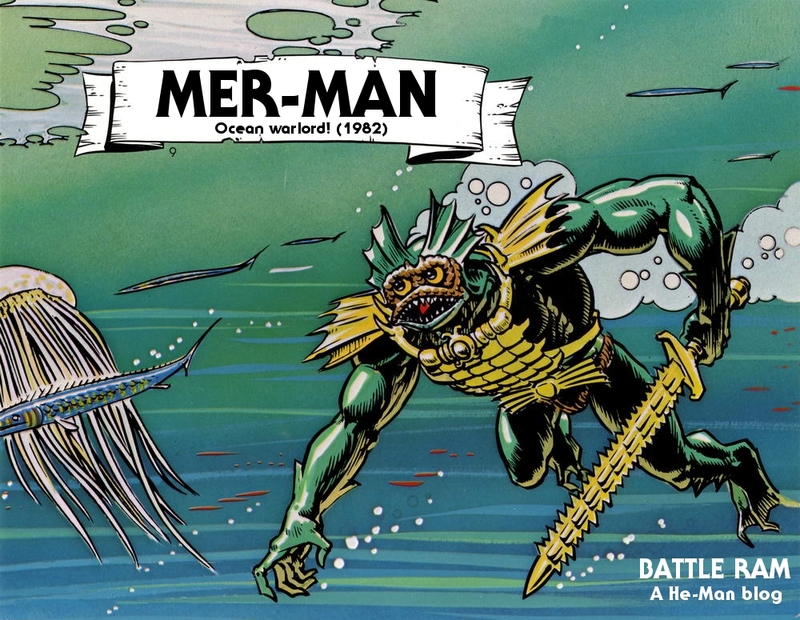 Mer-Man’s cardback art was first released with blue skin, then with green, following the evolution of the figure design. 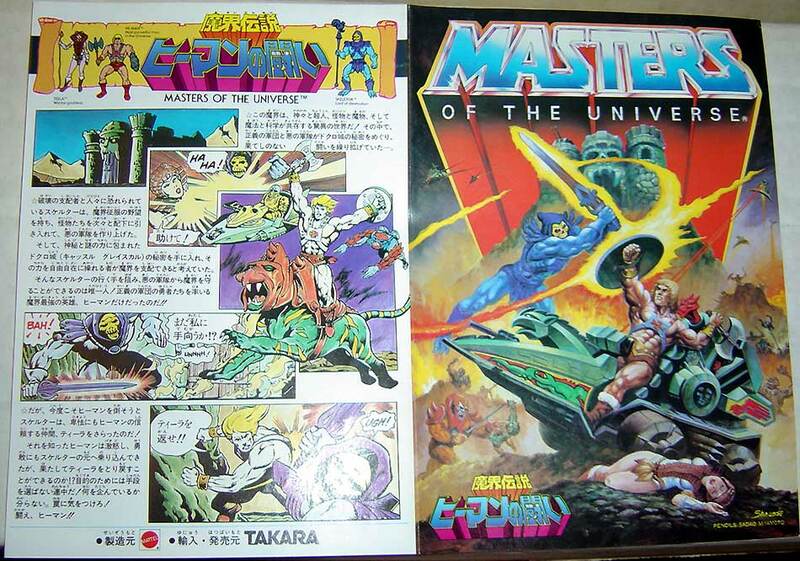 Image courtesy of Tokyonever. 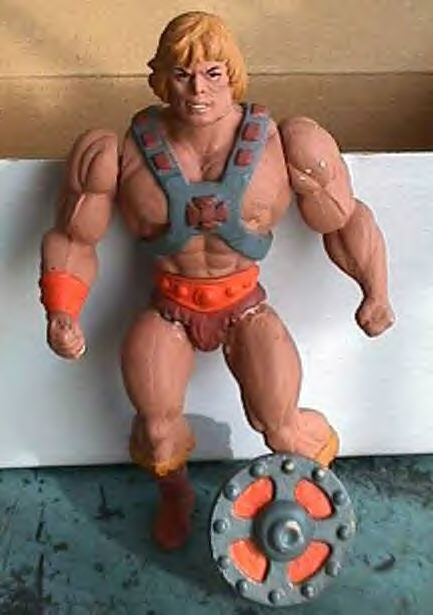 The gloves and shin guards were unpainted. 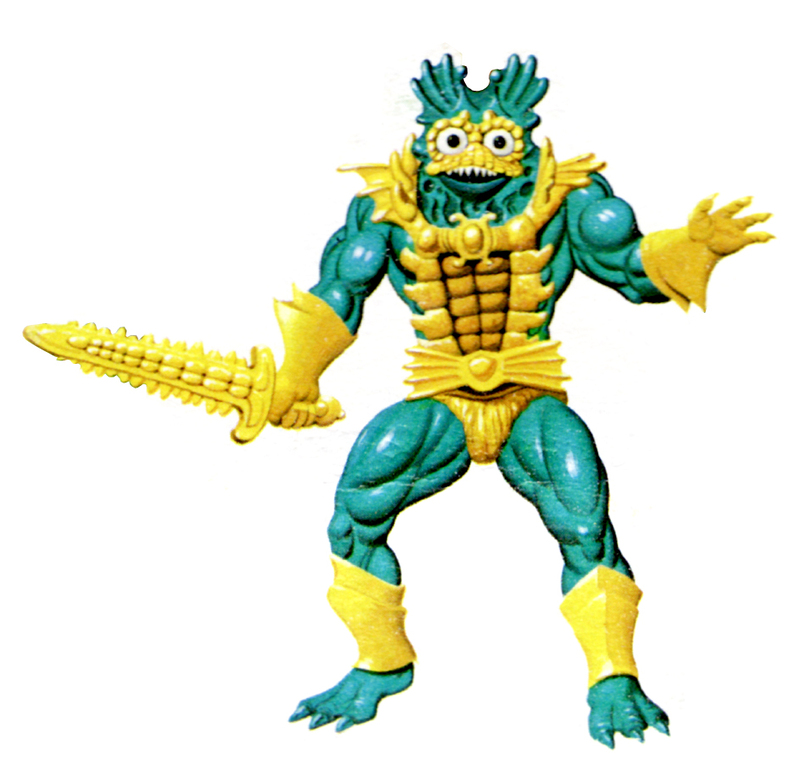 The sword bore a closer resemblance to corn than coral (note: I am informed by Mantisaur82 that Mer-Man’s sword is supposed to be a weapon made from a sawfish rostrum, and that actual weapons have been made after this fashion). 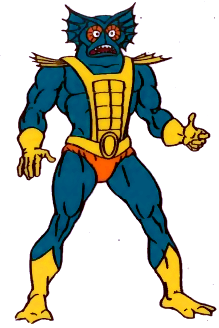 The furry shorts were orange instead of yellow. 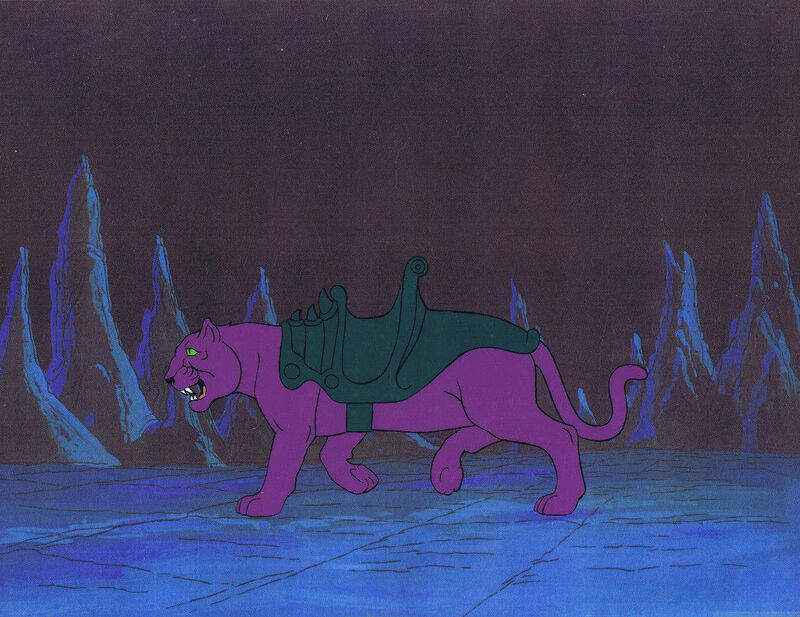 The armor’s detail was softened considerably. 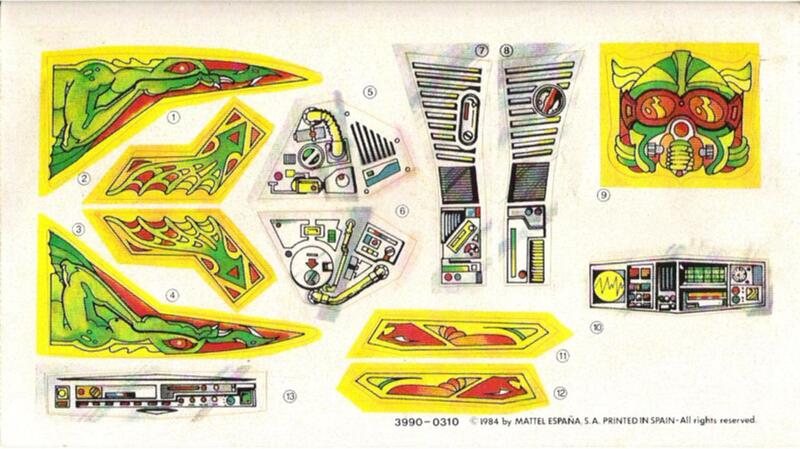 And most of all, the design of the face seemed markedly different from the cross sell art we had memorized. 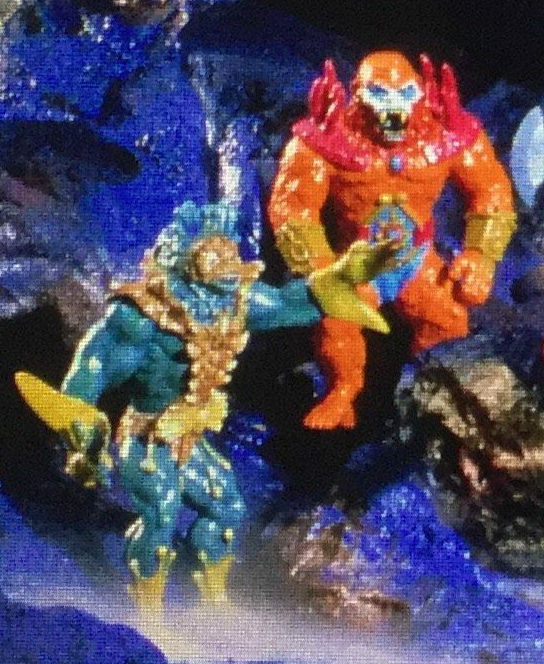 A lot of MOTU collectors talk about Mer-Man a little bitterly. 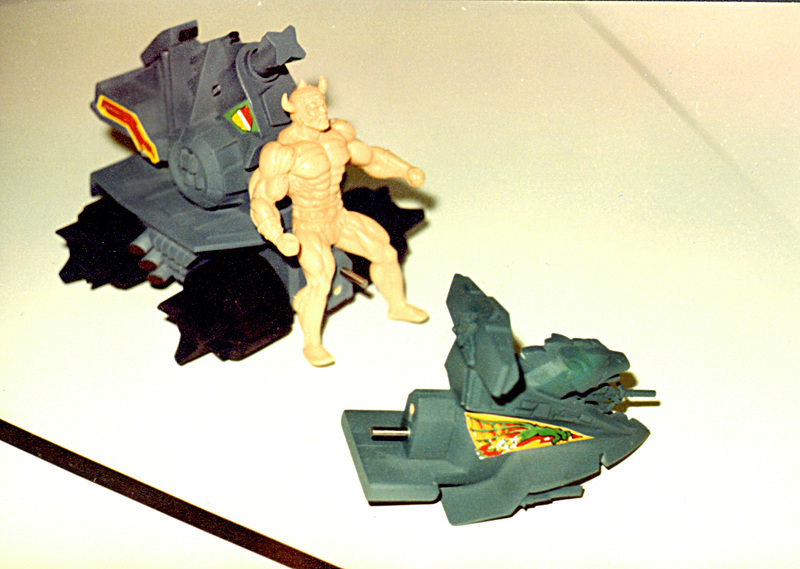 Like they were so disillusioned with the way the toy was changed from the artwork that it soured them on the figure. 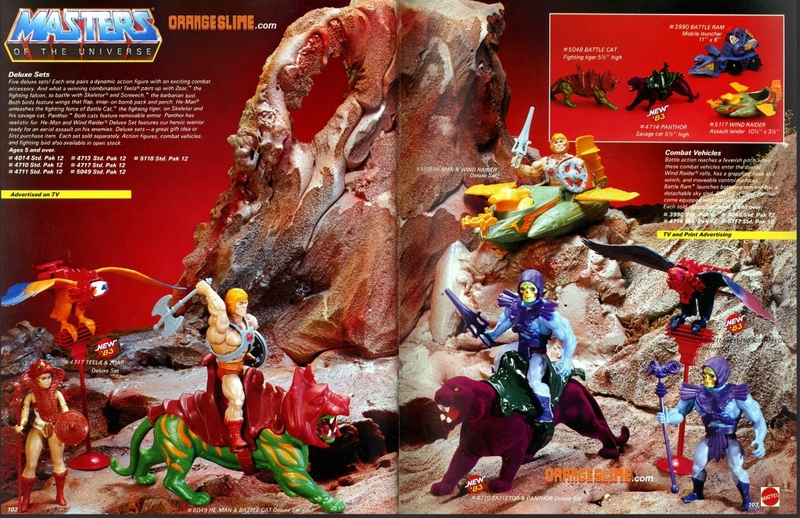 And yes, as a kid I was a little dismayed at the difference at first. 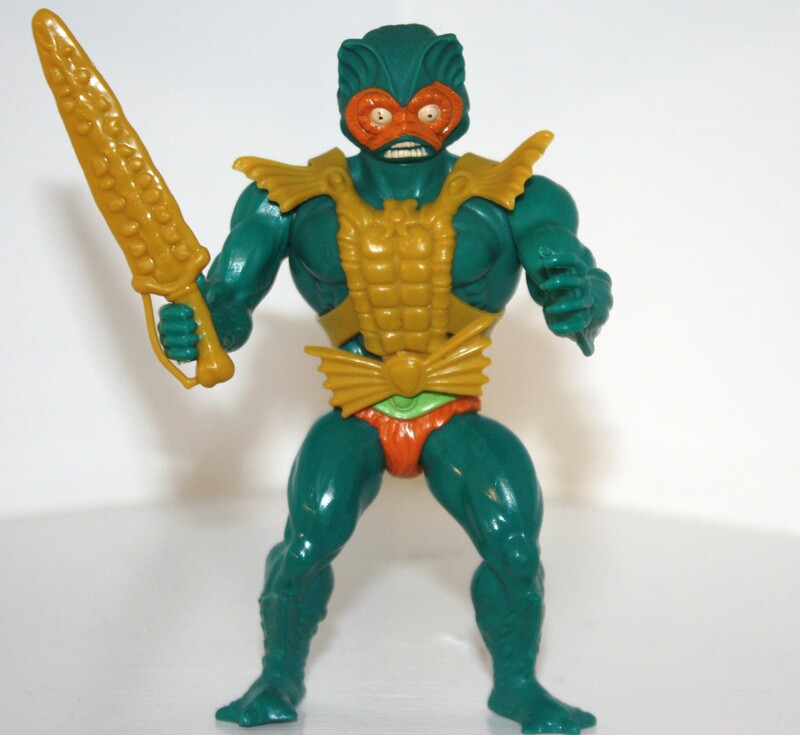 But when I really looked at him closely, I realized I was still kind of in love with Mer-Man. 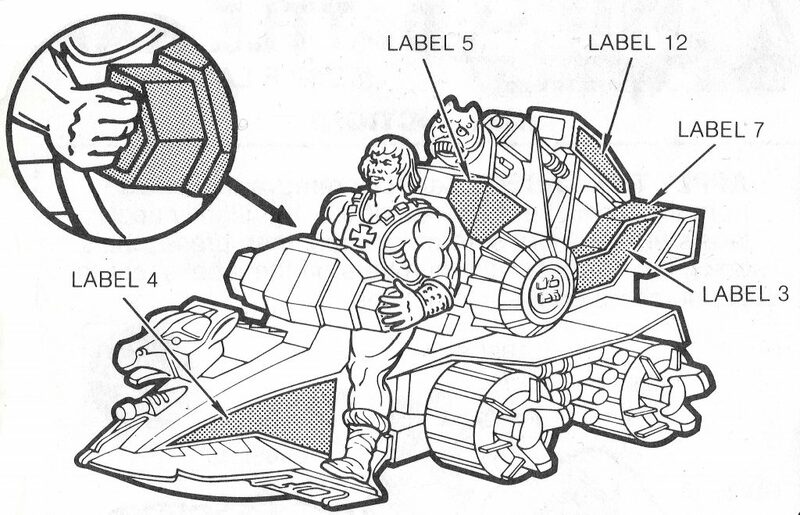 And let’s face it, he looks a lot more villainous in his toy form than he did on the card back illustration. 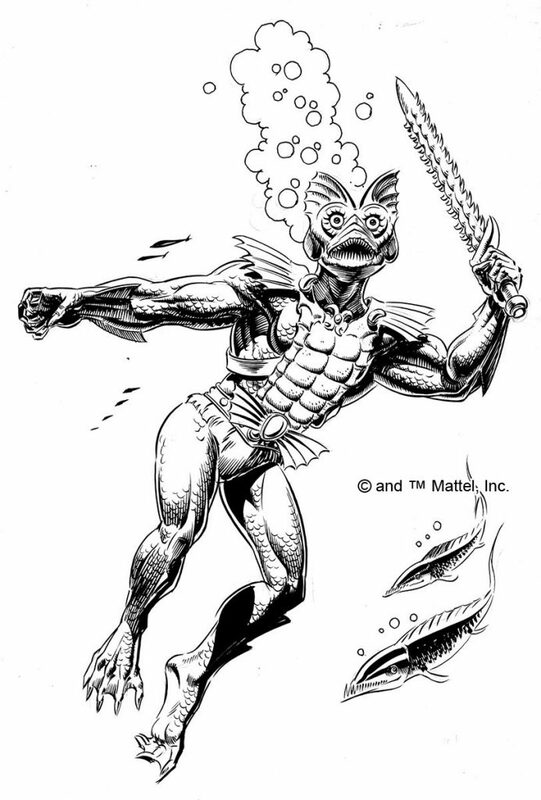 Mer-Man’s initial concept design (by Mark Taylor) was actually quite different from both the action figure and the cross sell art. 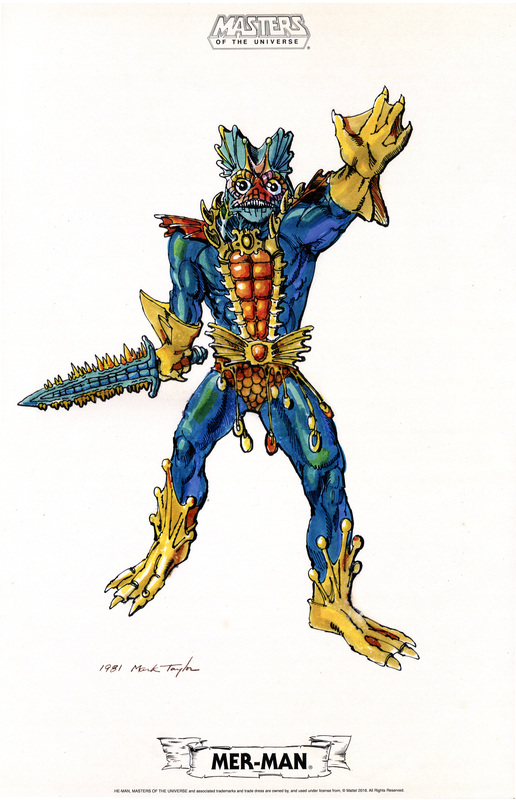 The original concept (known as “Sea Man”) would have had unique legs, arms and a scaly loin cloth. 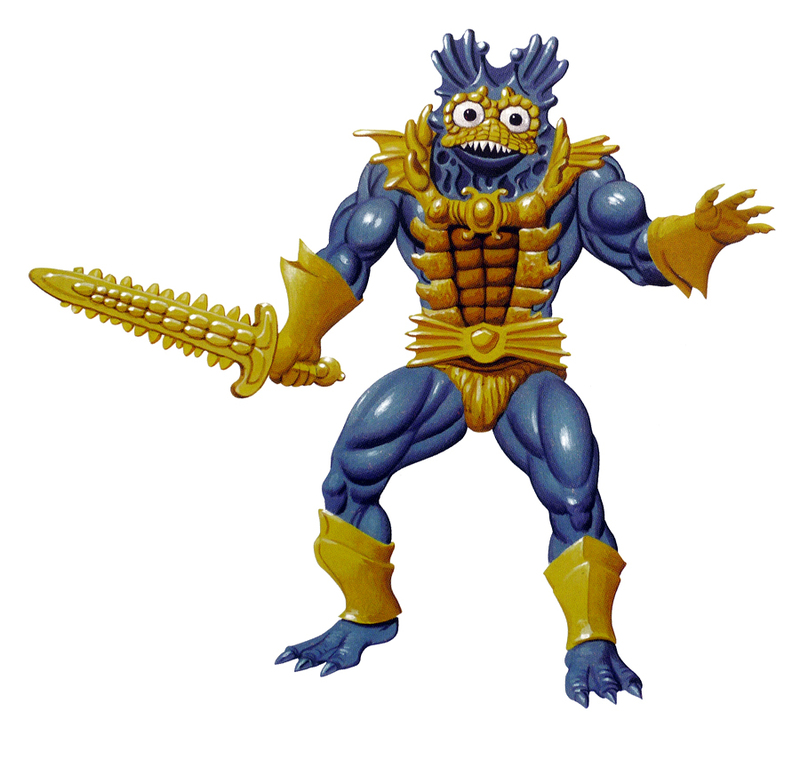 The cross sell art cut down on the fishy details, and the toy version even more so. 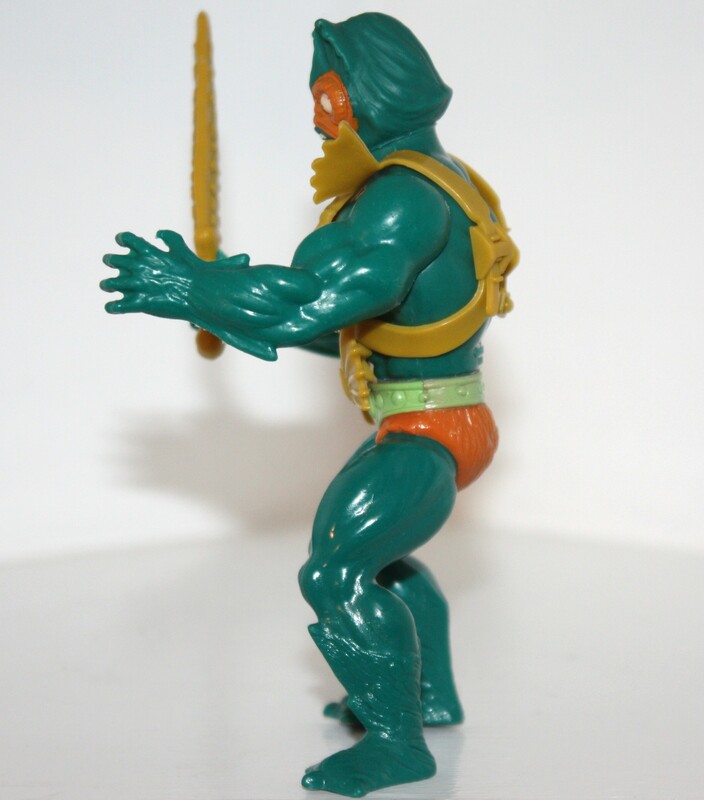 Below is the early Mer-Man prototype, sculpted by Tony Guerrero. 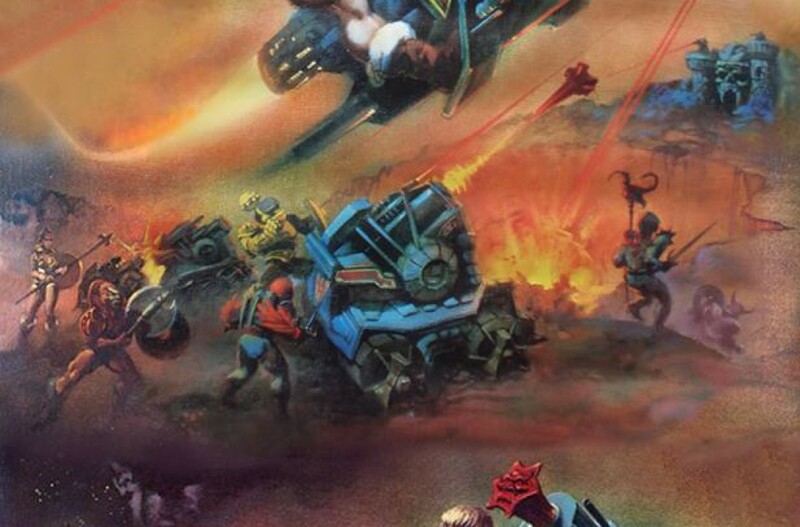 Notice the model is very faithful to the concept art, down to the pose. 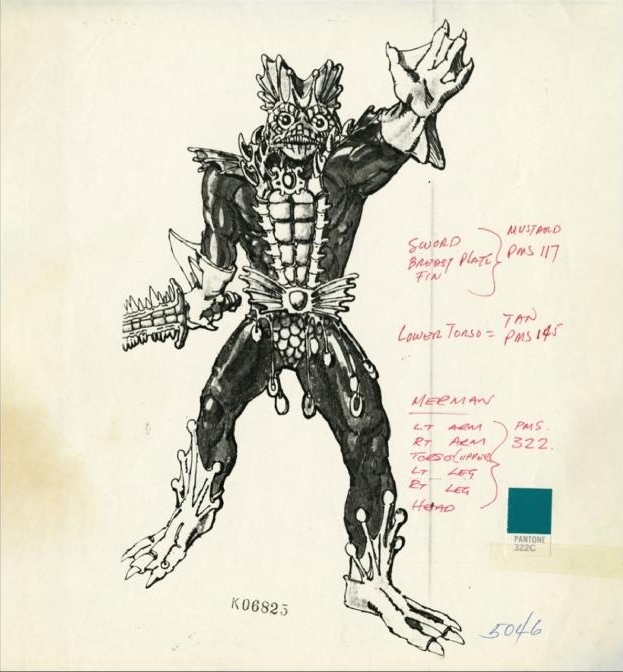 Mer-Man’s revised sword design is laid out in the Mark Taylor B-sheet design below. 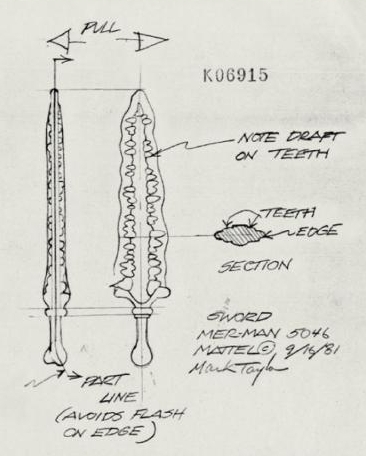 Note that the teeth of the sword don’t go out as far as the edge of the sword. 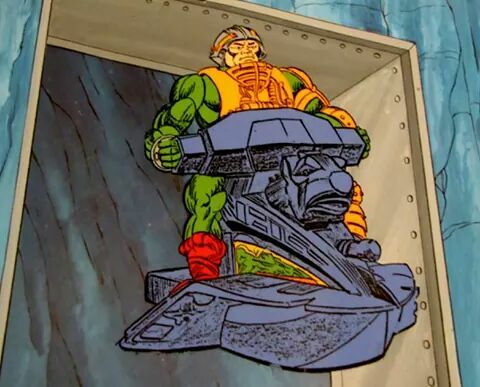 I’m sure this had to do with limitations of manufacturing technology at the time. 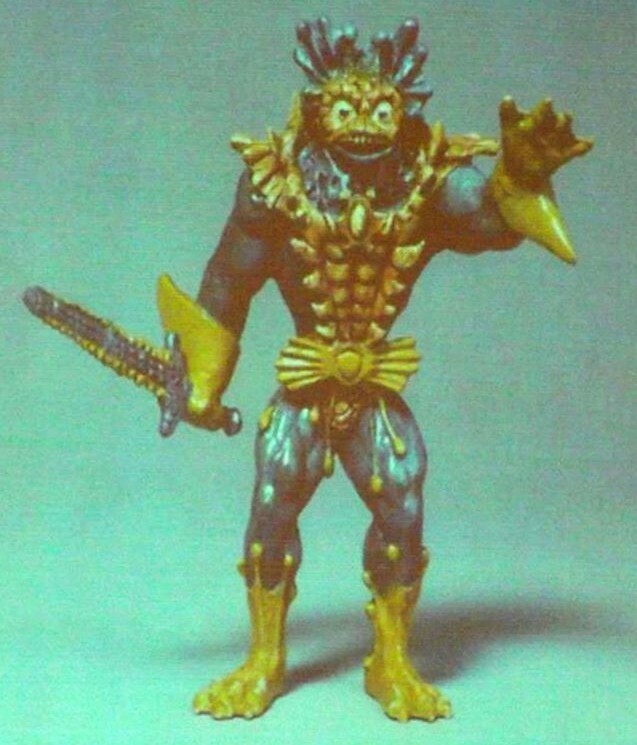 Mer-Man’s final, hand-painted prototype appears below. 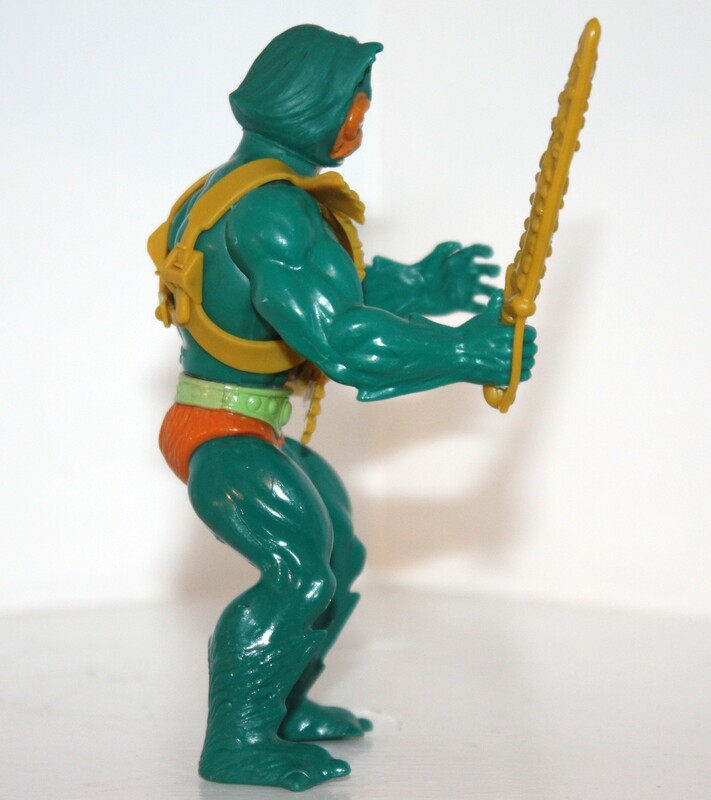 The sculpt is identical to the mass produced toy, except the sword is missing the hand guard. 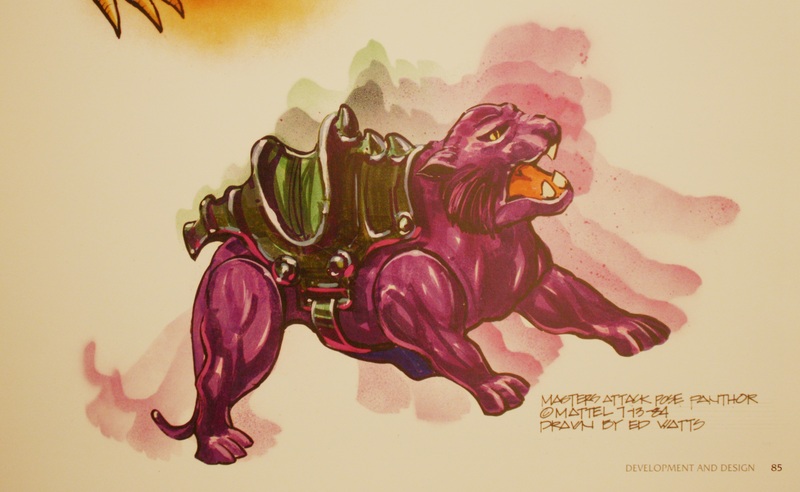 If you take a close look at the head on the original concept art, it’s actually somewhere between the somewhat goofy cardback and the simplified but more intense vintage toy face. 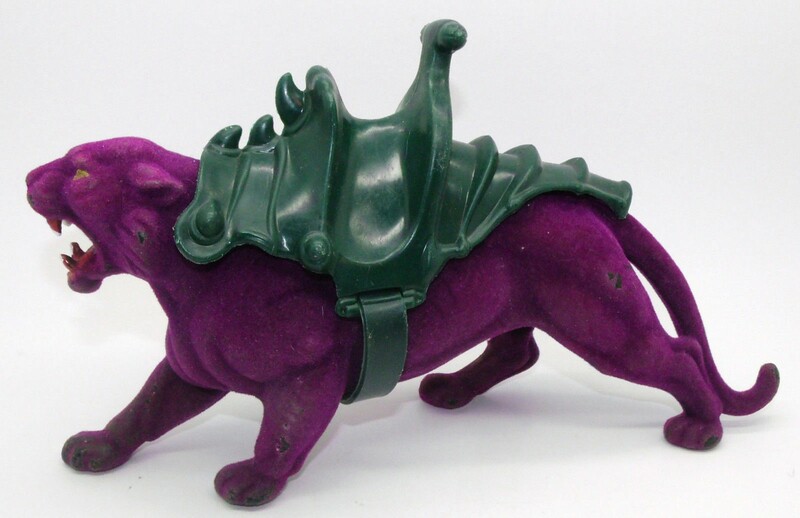 In fact, if you were to color that original concept design just like the vintage toy (as I did below), it would be much clearer that they were really the same basic character, just simplified, recolored and made a bit meaner looking. 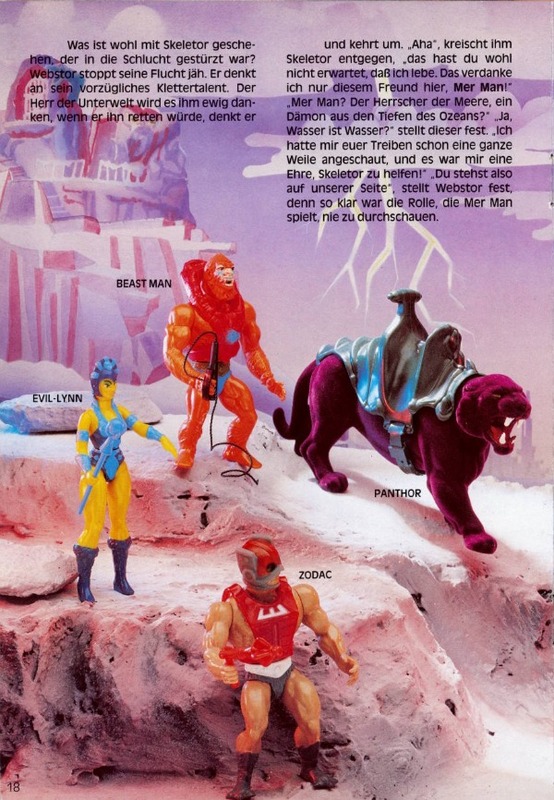 But why were the painted gloves and shin guards removed? 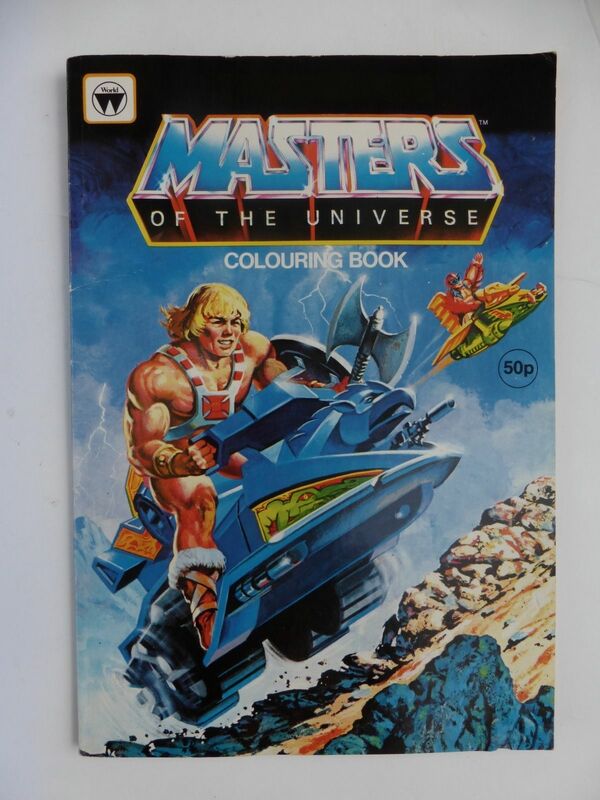 Almost certainly to cut costs. 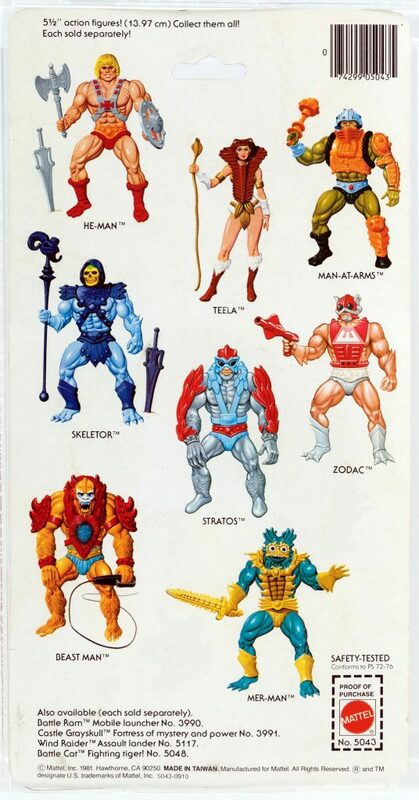 The second half of the first wave of figures that came out in 1982 (Mer-Man, Stratos, Teela, Zodac) all had reduced paint apps and/or accessories compared to the first four (He-Man, Skeletor, Beast Man, Man-At-Arms). 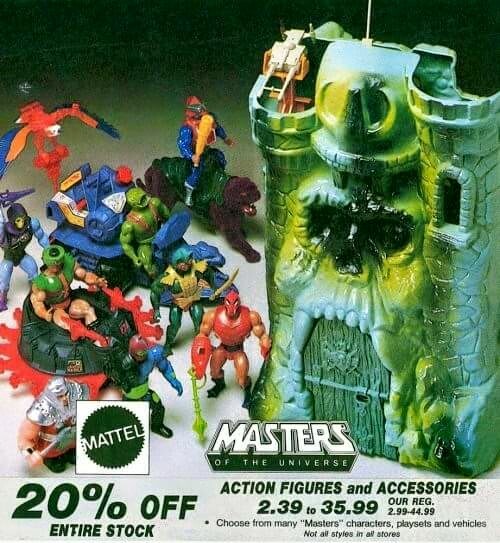 This despite the fact that, apparently, Mattel made a boat load of money from He-Man that first year. 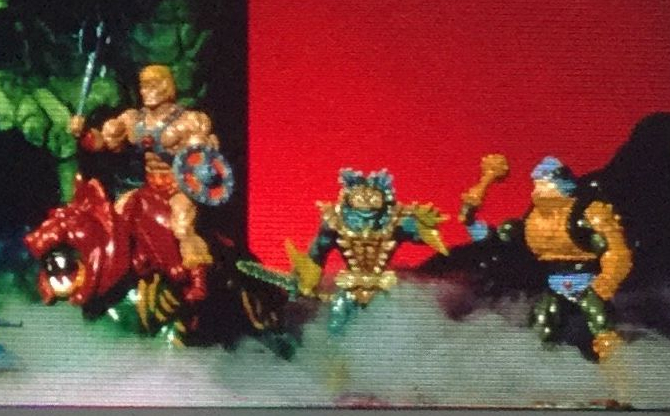 Mark Taylor and Ted Mayer have both said that Mattel was very reluctant to invest money in new tooling for the MOTU line, even after its unexpected success. 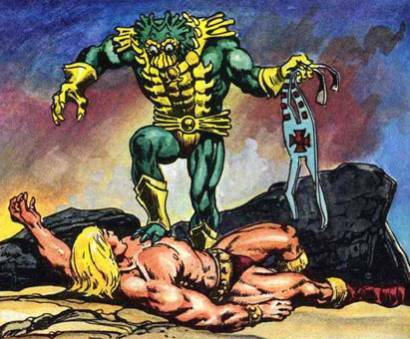 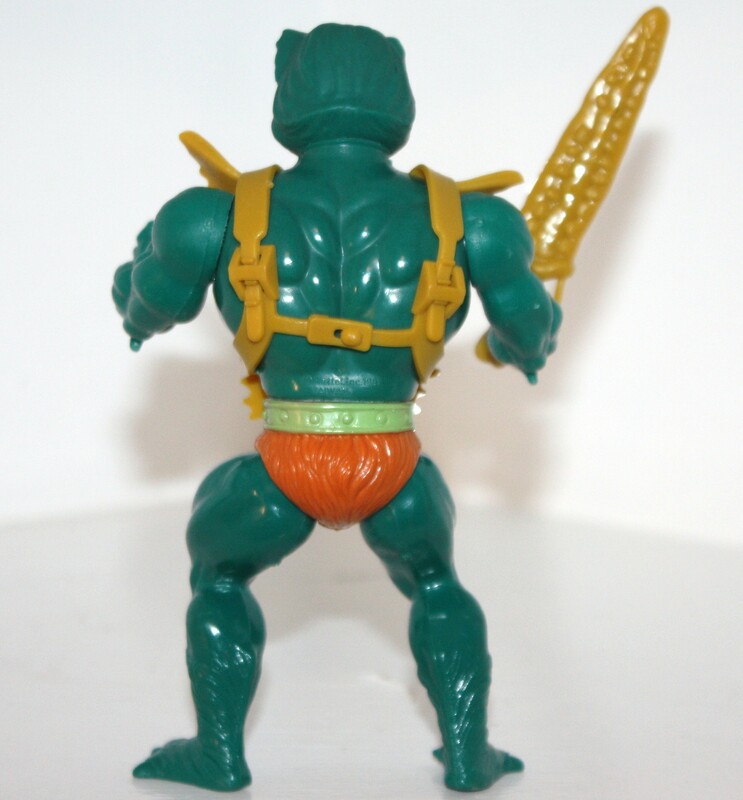 The first (1982) release of Mer-Man had his belt painted green. 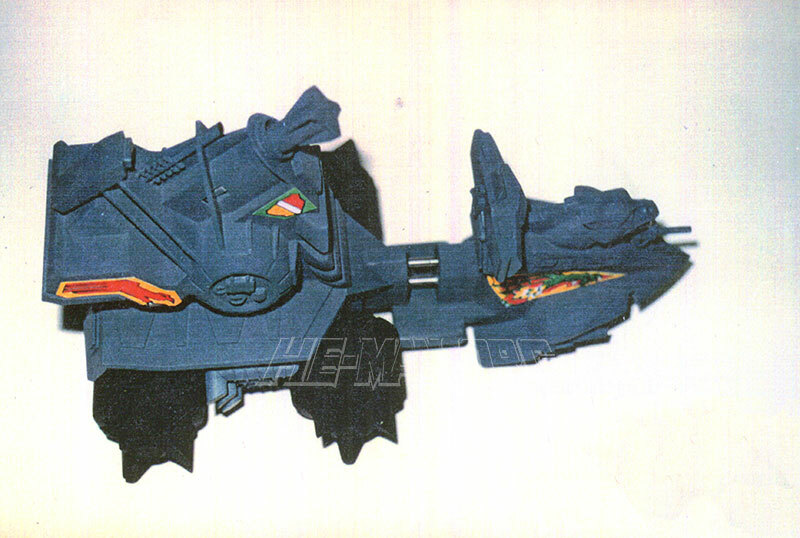 Subsequent releases left the belt unpainted. 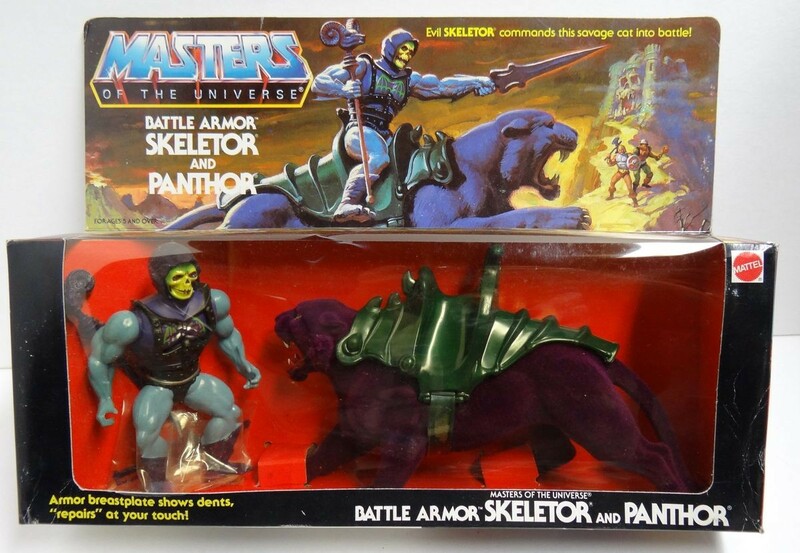 I would assume the idea was to cut costs, and much of the belt was obscured by his armor anyway. 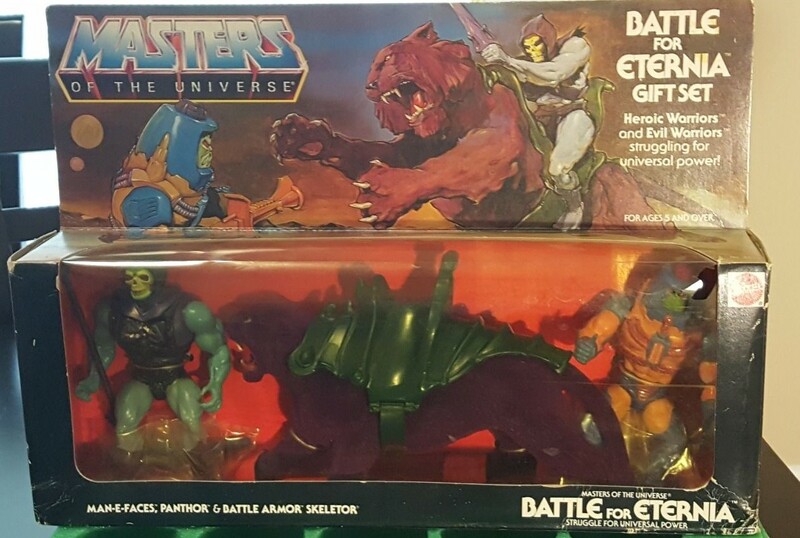 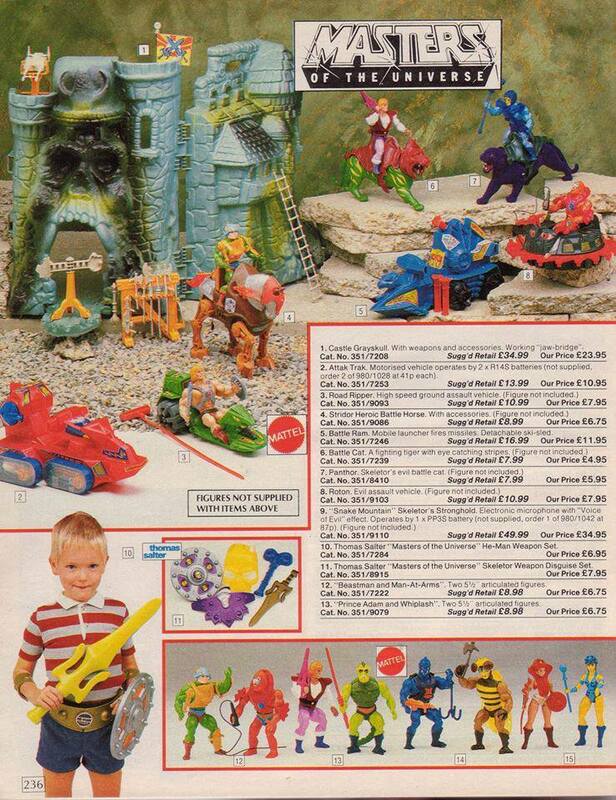 Mer-Man was also sold in a giftset with Battle Armor Skeletor and Webstor, and in a JCPenny giftset with the original Skeletor. 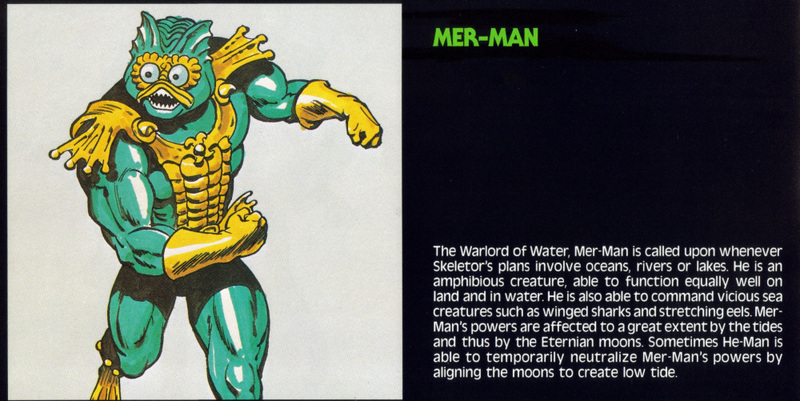 I’ve heard scuttlebutt around the internet that Mer-Man was originally conceived of as a heroic warrior from an oceanic world that was destroyed. 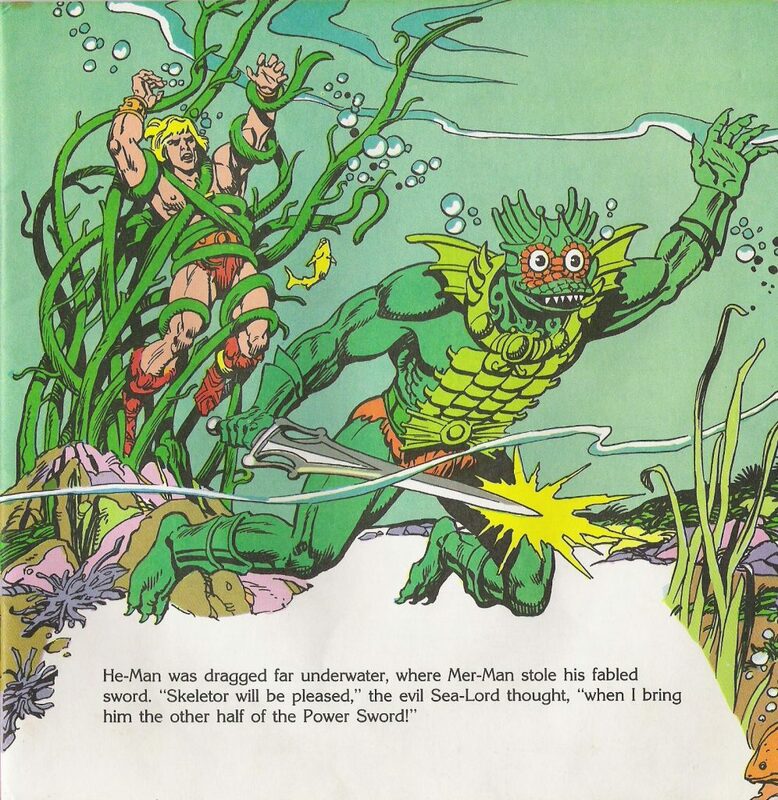 However, I’ve never seen any real evidence that Mer-Man was once heroic. 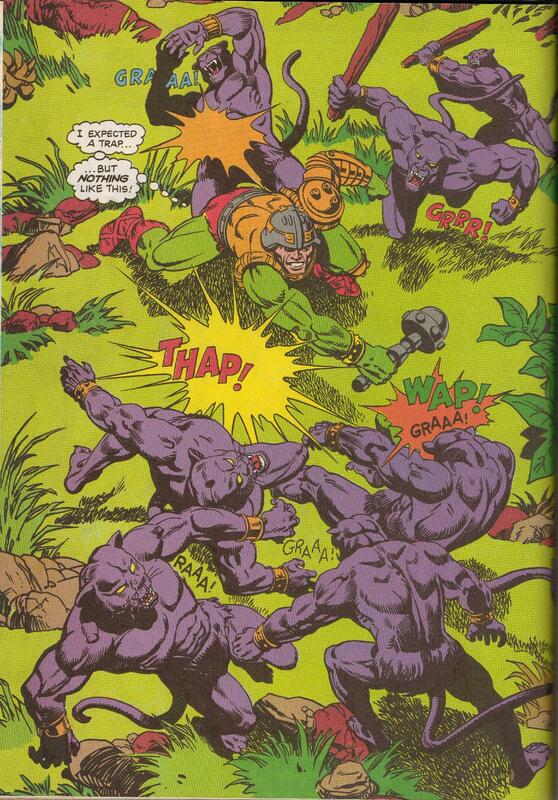 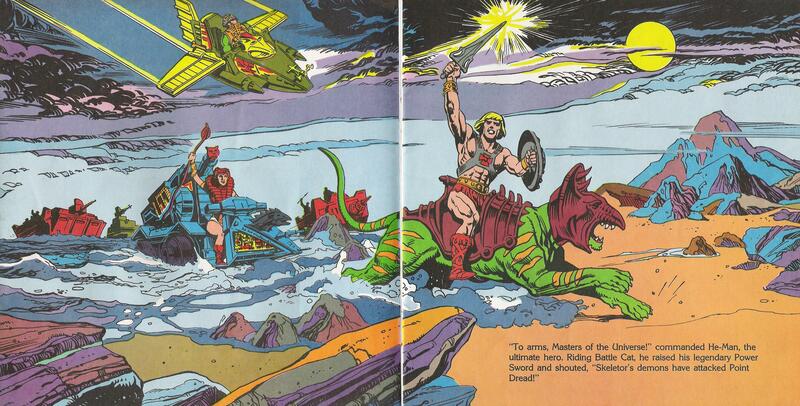 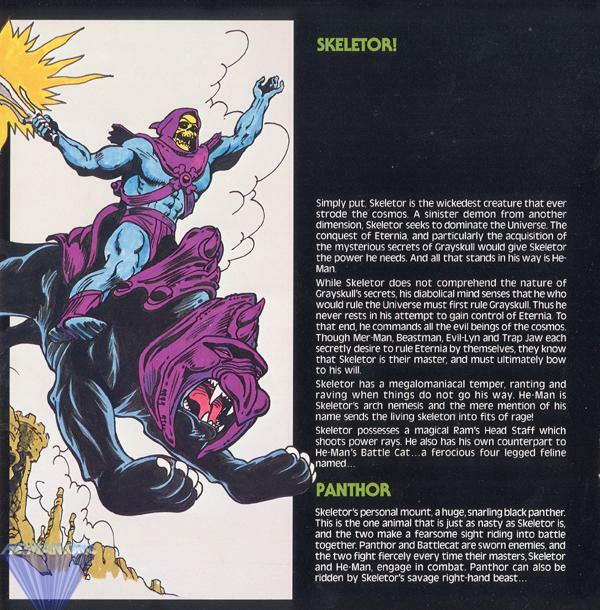 Even in the first mini comic, where Stratos’ affiliations seem to be with Skeletor, Mer-Man was portrayed as an evil warrior. 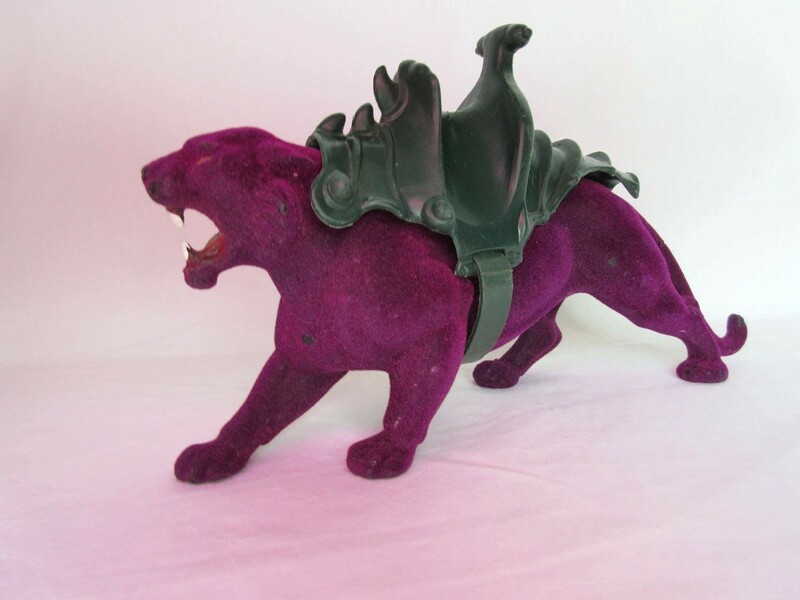 Tony Guerrero the great sculptor and I chased the negative child test comments until we finally realized the marketeers were just messing with us and then we went with what we had. 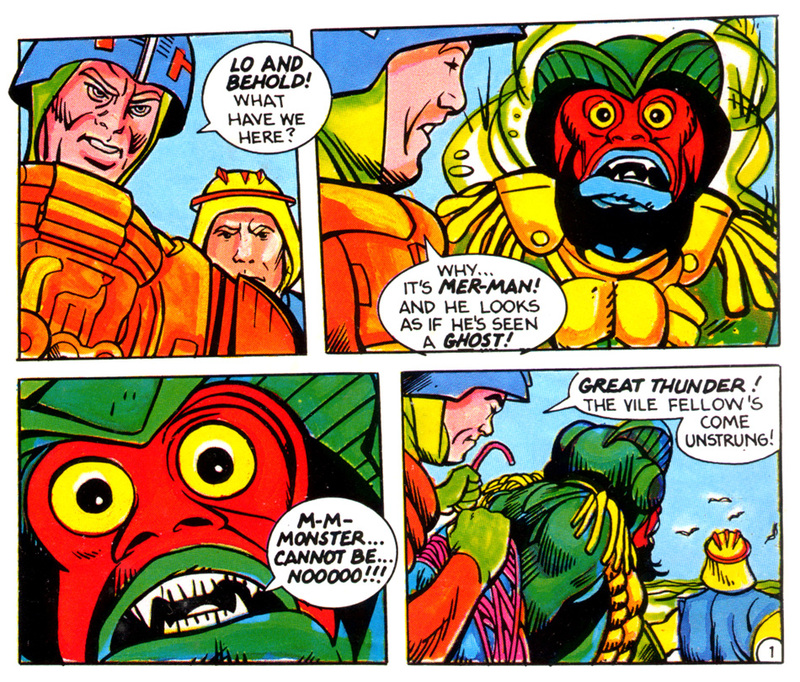 Mer-Man was the weakest but people who like him really like him (I based him on Bernie Wrightson’s Swamp Thing). 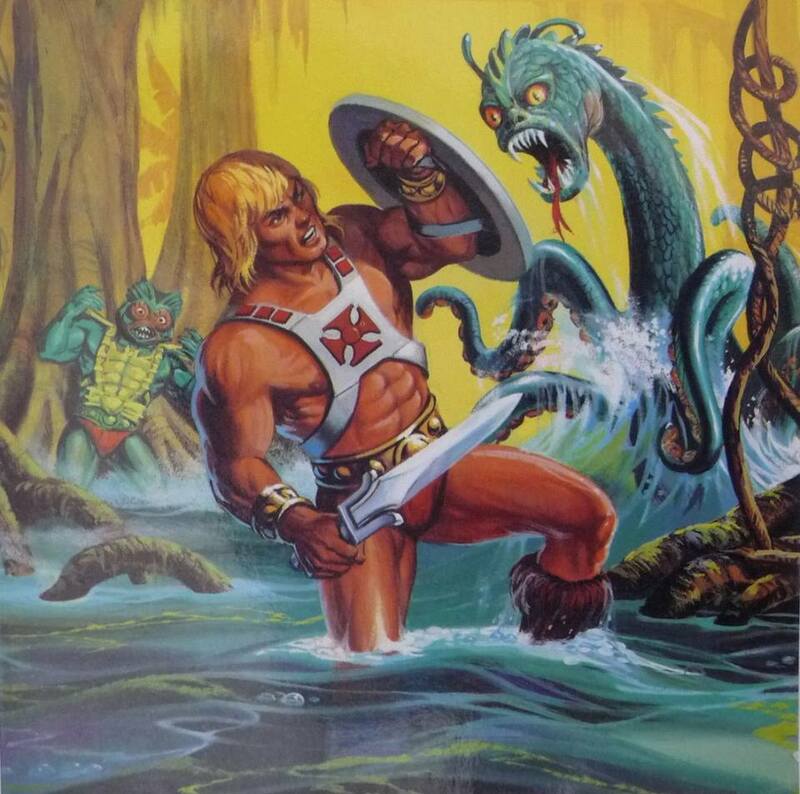 Well, they almost rejected Mer-Man. 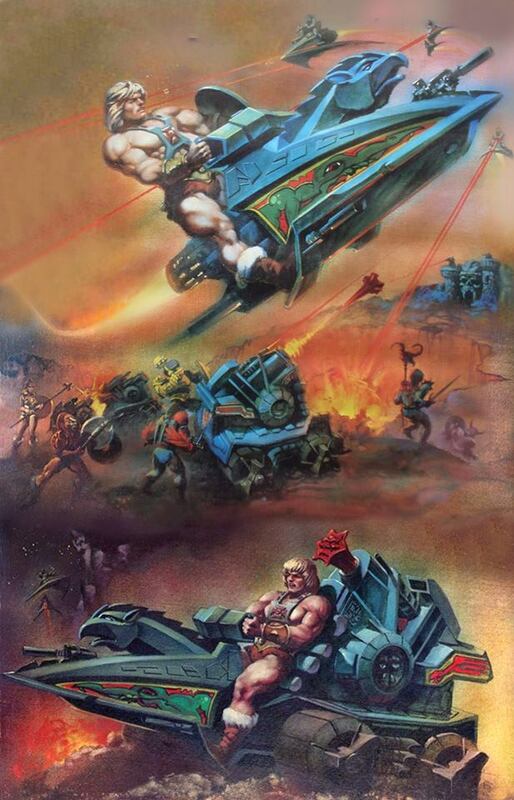 They didn’t understand him, and wanted to take him out of the line. 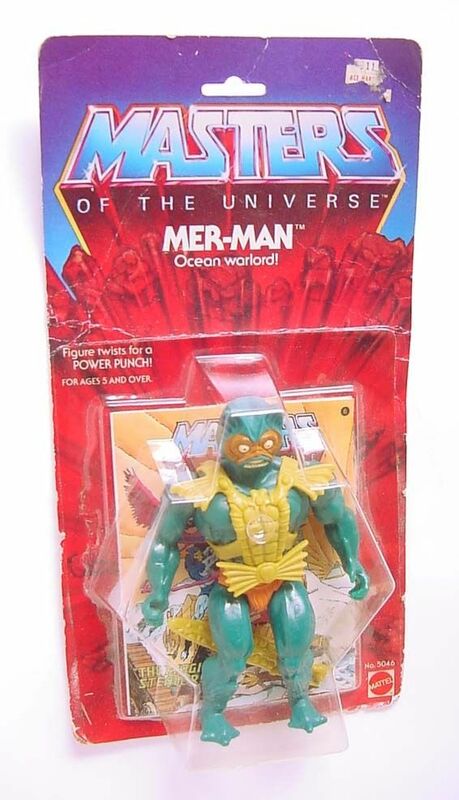 I had a hard time convincing them to keep him. 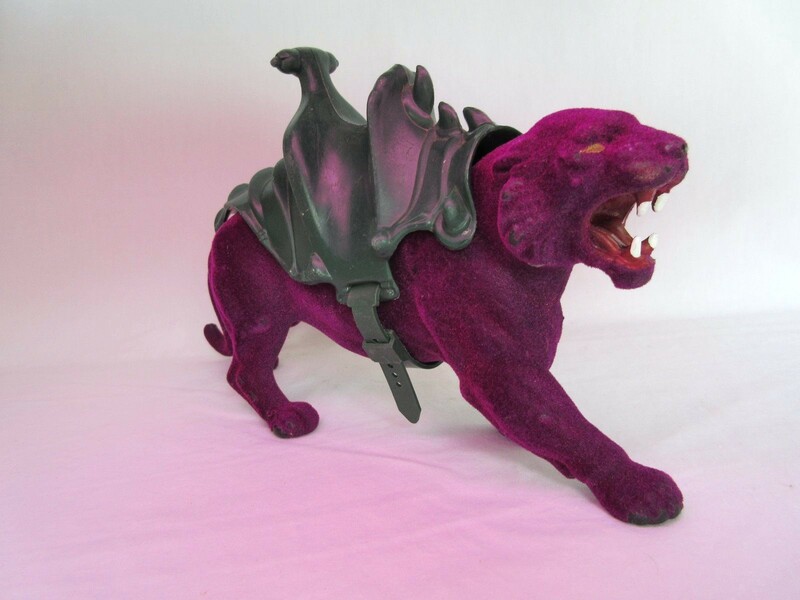 I said “Don’t you understand? 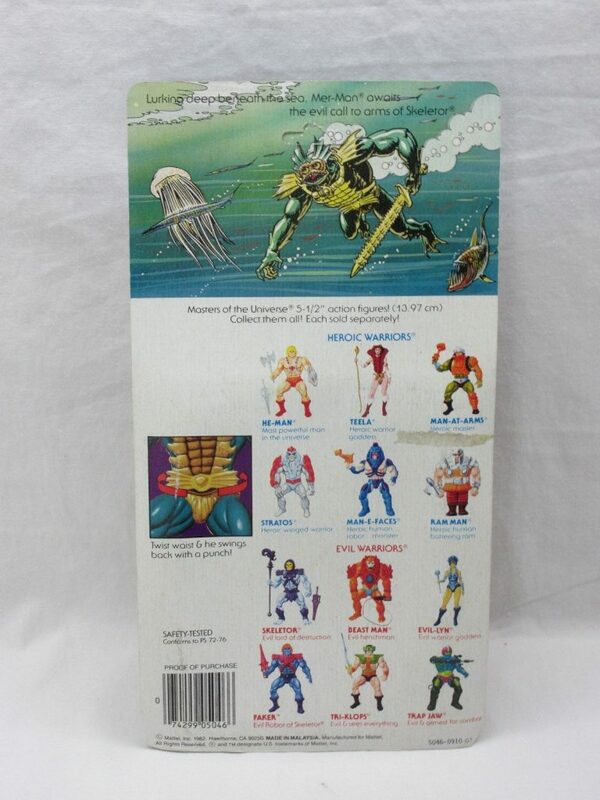 There has to be someone who lives in the water!” I was envisioning a magnificent line of toys that could be played with in the water. 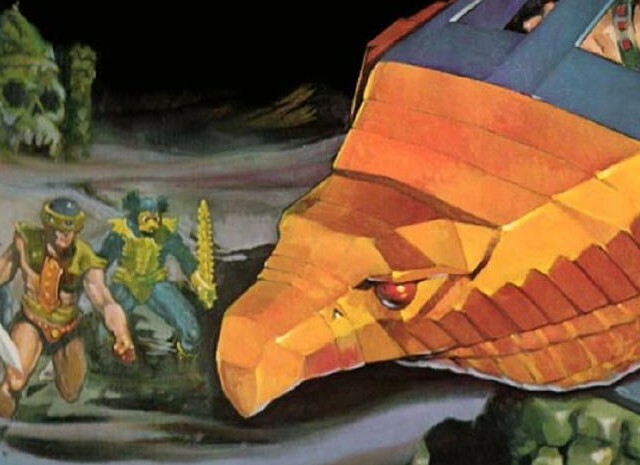 Decades later, George Lucas did a similar thing in The Phantom Menace. 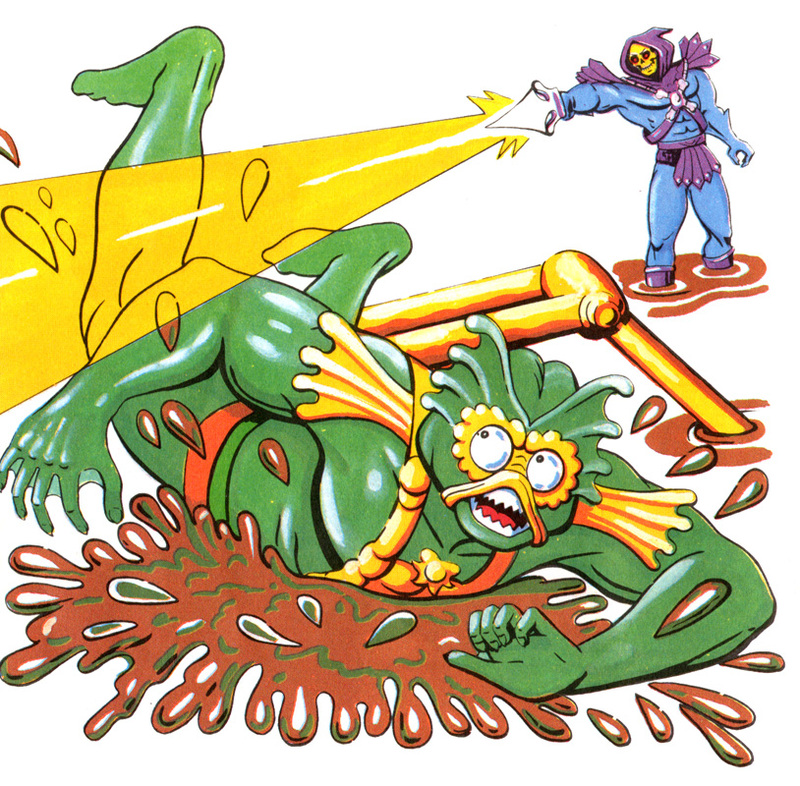 I worked for the US Navy for almost ten years in the Naval Undersea Warfare Center, so I really wanted to do undersea stuff. 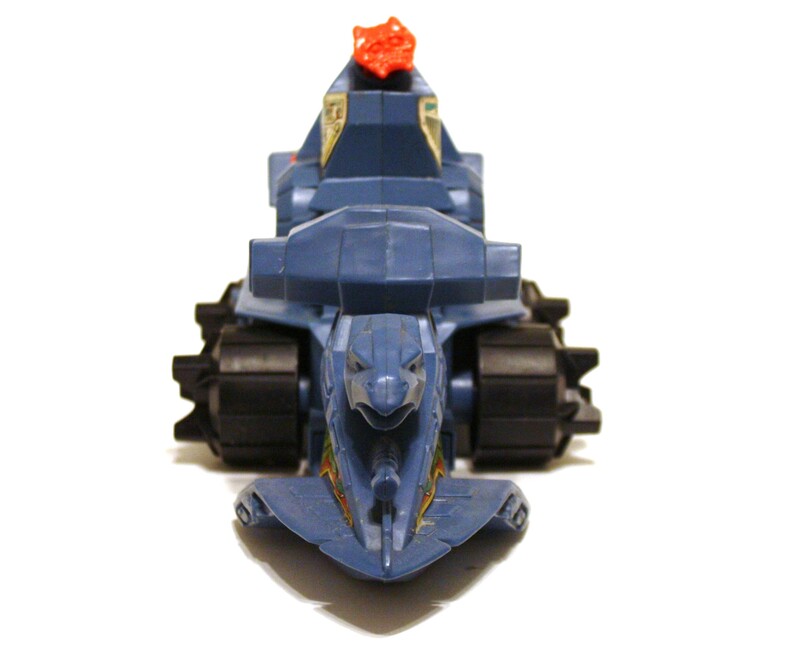 I was a diver, and I felt the mysticism of being under water. 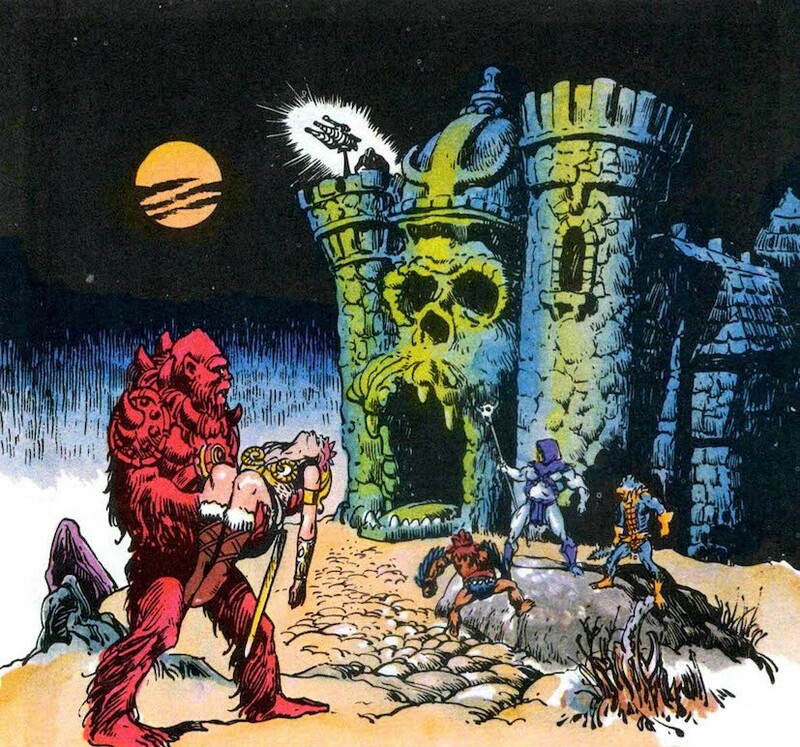 That’s such an amazing area to get into. 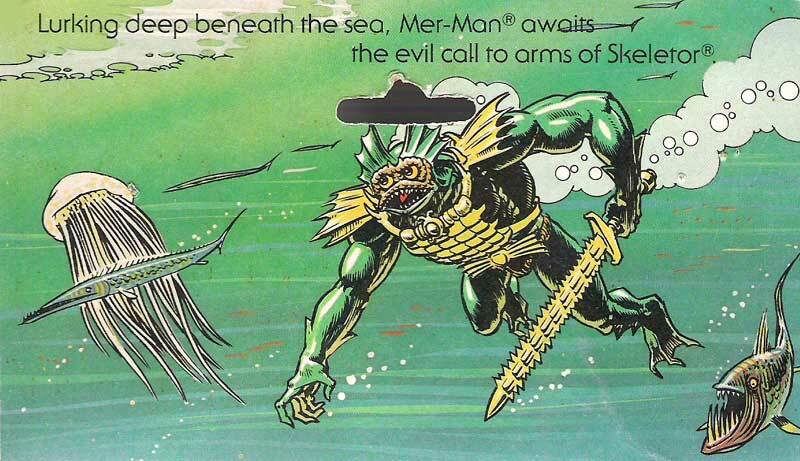 Mer-Man underwent subtle and radical redesigns in different media over the years. 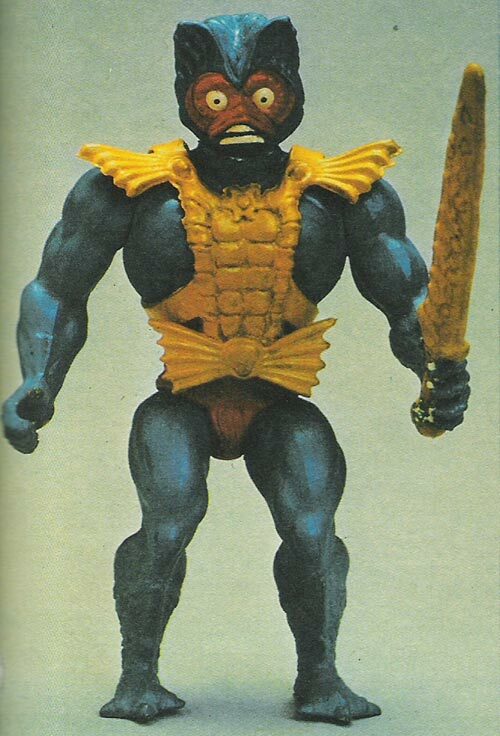 He may be the most inconsistently portrayed character in all of MOTU. 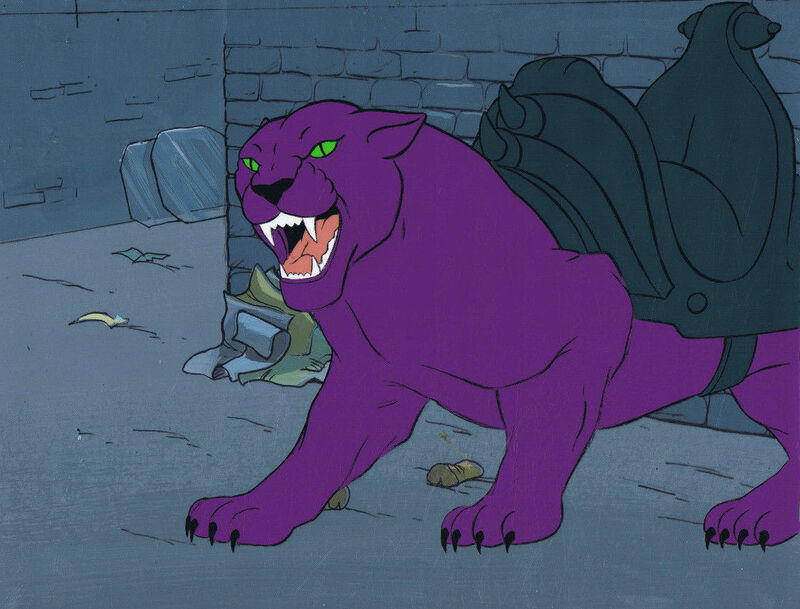 He’s also my favorite. 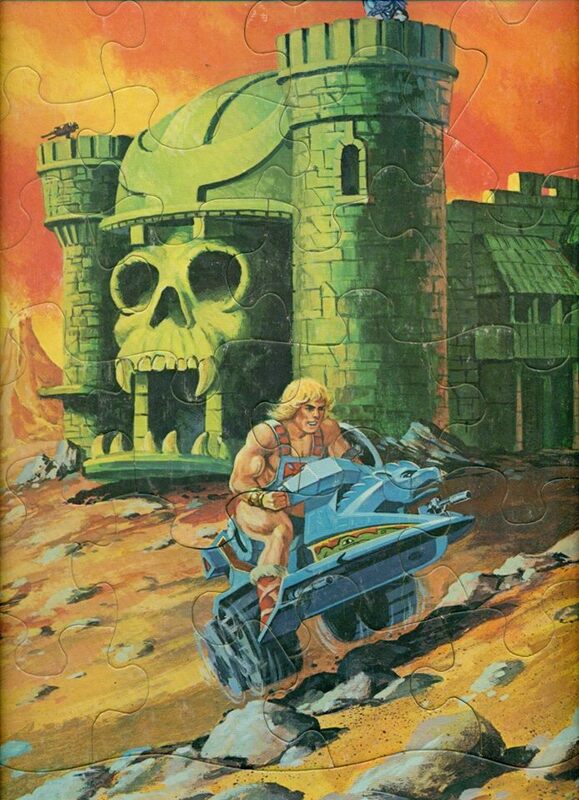 There’s something about him I’ve always found fascinating and a little bit mysterious.